The weather was an uninviting grey, cold and windy, at first light. In no hurry, we waited a few hours until the rising sun worked its magic on the thin clouds and removed the morning chill. On bikes we tried to leave Casalarreina on a marked, signed route, but as is often the case, the hardest part of any new trail is finding the start. There were many signs in many directions, but none seemingly pointing the way of the correct route we wanted to follow. 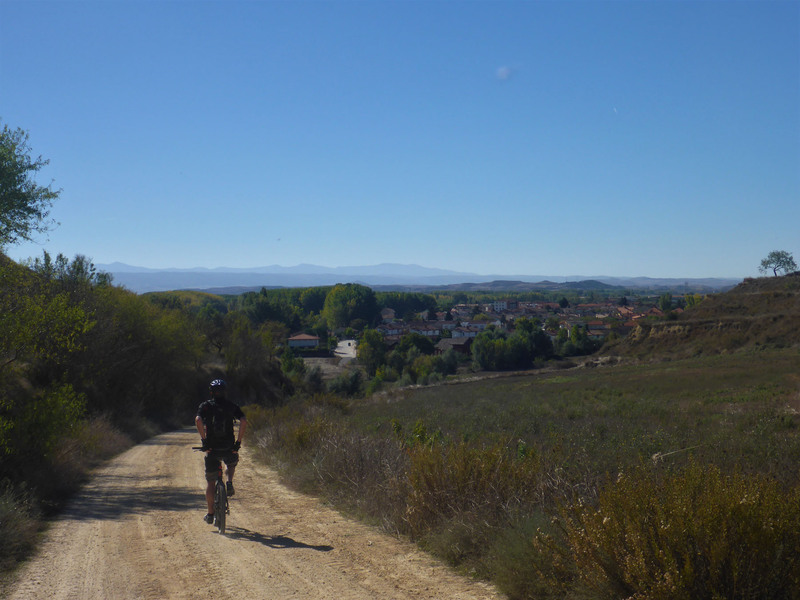 With a photo of the route map we ignored the finger posts and backed ourselves instead, and soon we were on empty gravel tracks, enclosed by red-green vines and feeling fully immersed in an ancient Spanish countryside. Dusty hillsides stood tall wrapped with patches of deep green foliage and below them wide fields varying from green to yellow to brown, depending on current use. 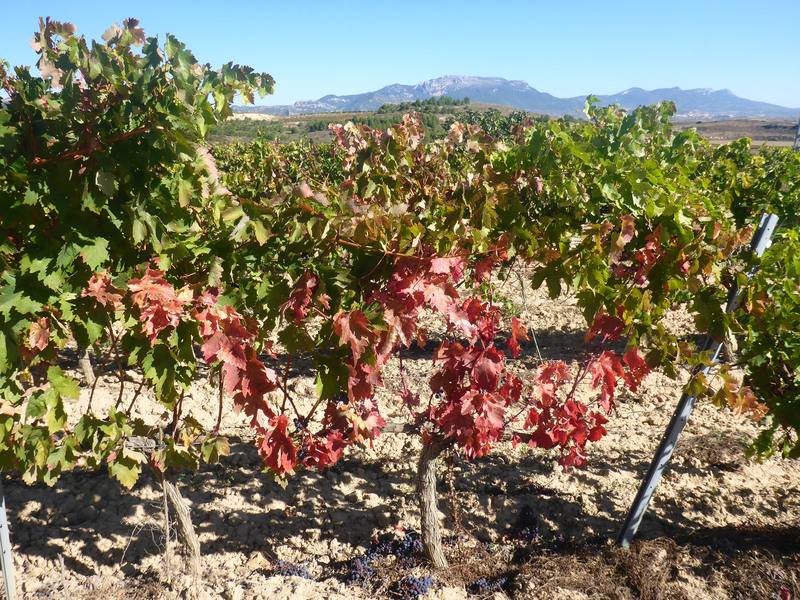 Neat rows of box vines, aflame with oranges and reds, lit up the flat, monotone landscape. 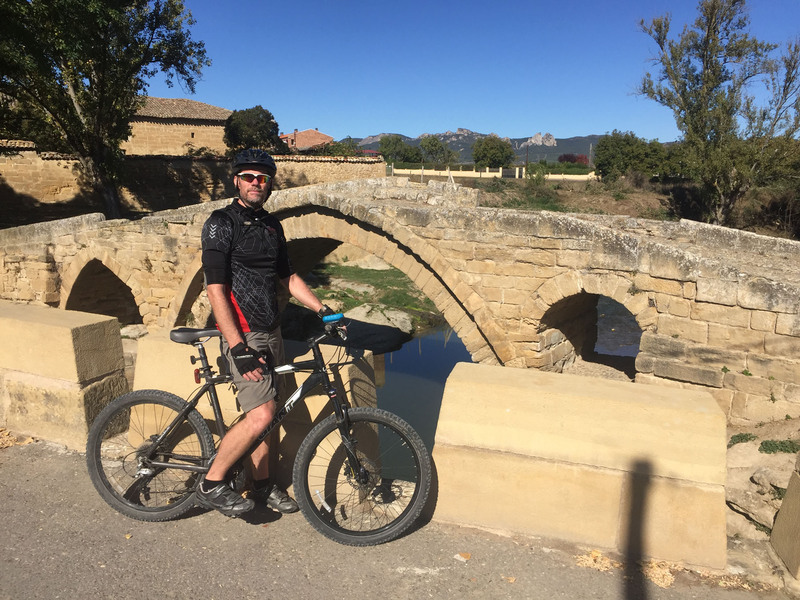 Church bell towers stood tall, distinctive silhouettes on distant hillsides, helpfully marking each coming village on our chosen wine route cycle. We passed through each small settlement in turn, circling their proud churches and making the local dogs bark manically. Zarratón, then Rodezno, then Ollauri to Gimileo. 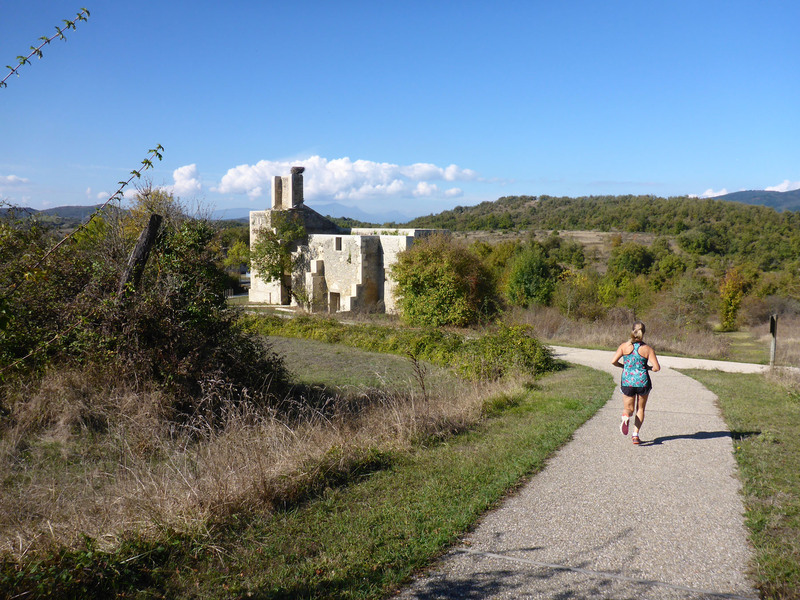 Each village was strategically positioned on a natural, curved mound set above the flat plain, and each brought a warming, breath-stealing hill-climb up followed by a fun, sweeping descent back down the opposite side. Tiny black grapes hung in huge bunches from vines, them smaller than blueberries. Most grapes had already been harvested, but some remained, whether left or missed. We tasted a few, and they were sweeter than expected, tiny bursts of juice but with pips that were a quarter of the grape. The route ahead was cut up in deep ridges and very steep in places, a portent for our upcoming run in similar terrain. After 15km or so, we were approaching the main town of Haro. 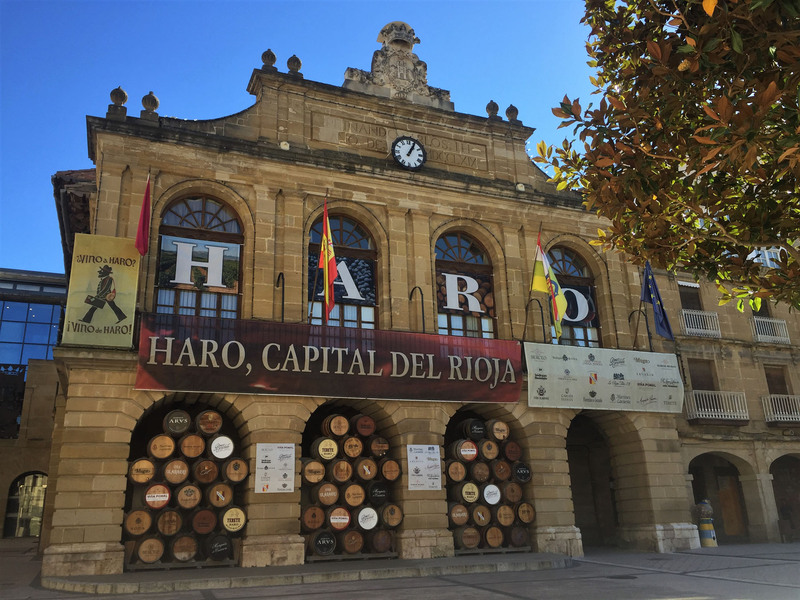 Dating from 1040 CE, historic Haro is the capital of the La Rioja region. 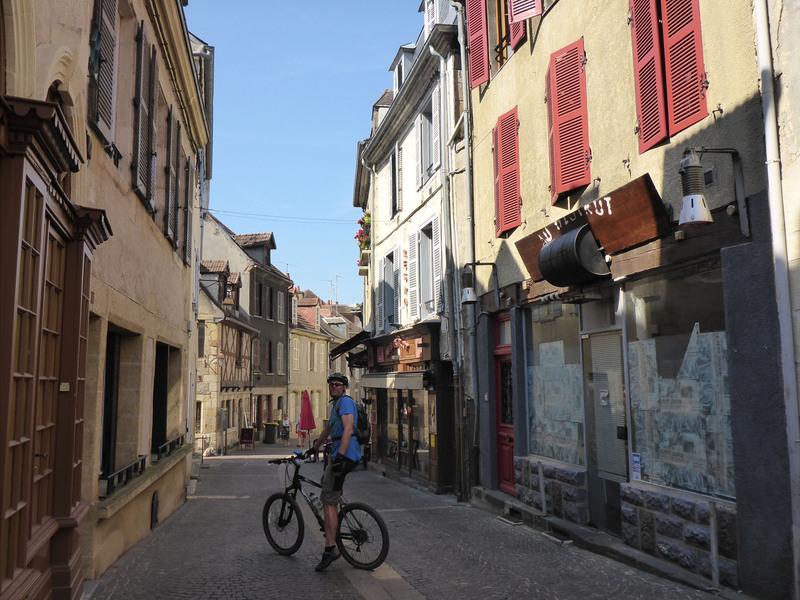 It was scruffy on first approach, sprawling and flat with constant lines of single-storey commercial premises, and from the viewpoint of our bikes it was unclear where the historic centre of town was. We re-joined the road and eventually found signs directing us to the Centro that led us to the main church and then into the beautiful Plaza de la Paz. 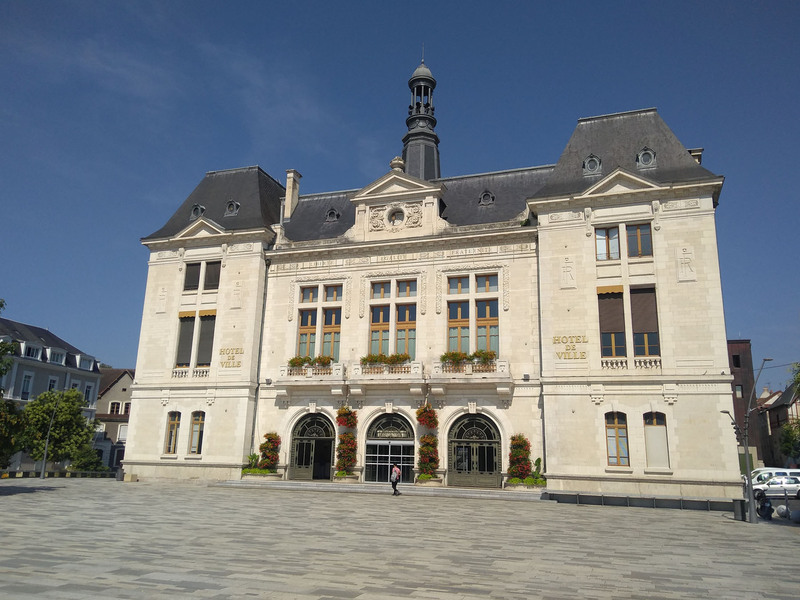 The town hall, all flags and wine barrels, defined one corner of this impressive, imposing square that featured an ornate bandstand in the centre. 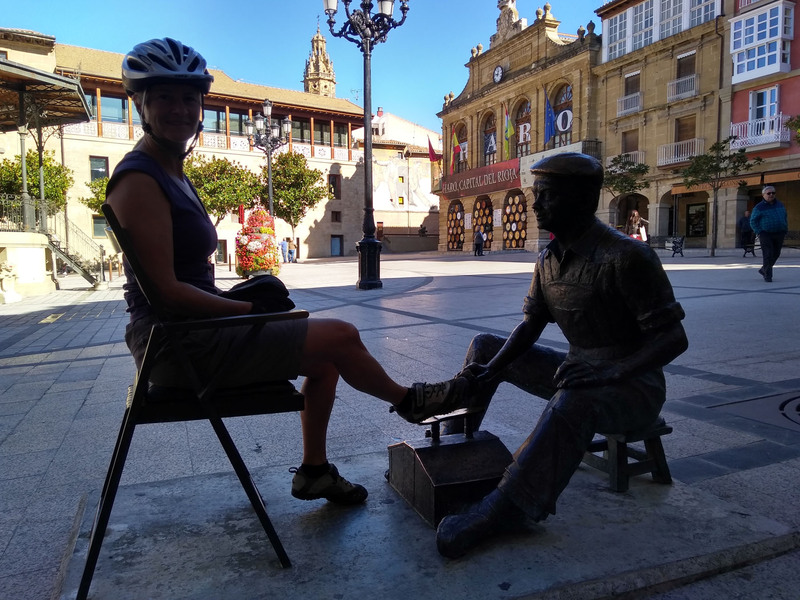 There were a series of bronze statues representing, even glorifying, ordinary local jobs, from shoe-shiner to goat-milker to grape-crusher to wine-bottler. Roundabouts were decorated with giant barrels and bunches of grapes, the motifs of wine-making always in plain sight, leaving no doubt as to the town’s primary occupation. It reminded us a little of Chateauneuf-de-Pape, in its single-minded approach to promoting its famous wares. We cycled to the other side of the river where many of the regional producers had visitor centres huddled together. 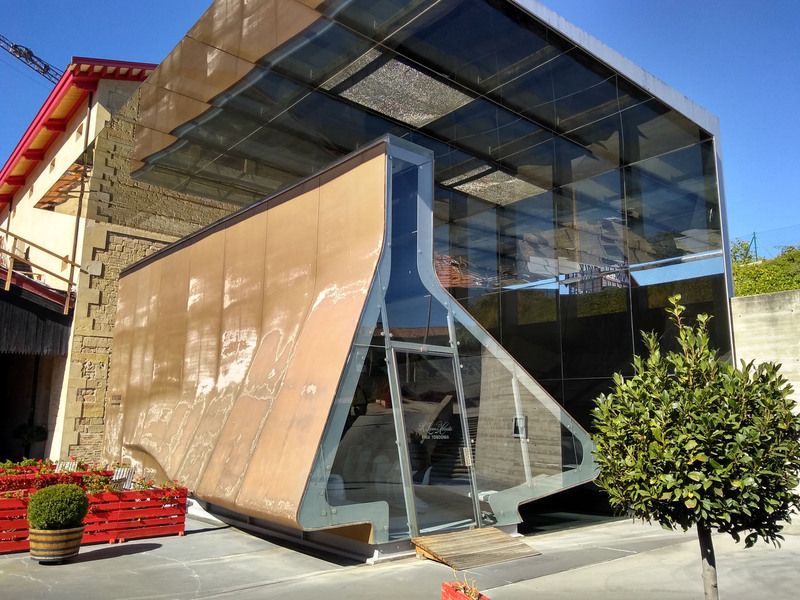 One vineyard’s posh tasting room had been designed by the office of the late Zaha Hadid, so we had to check that out in passing. 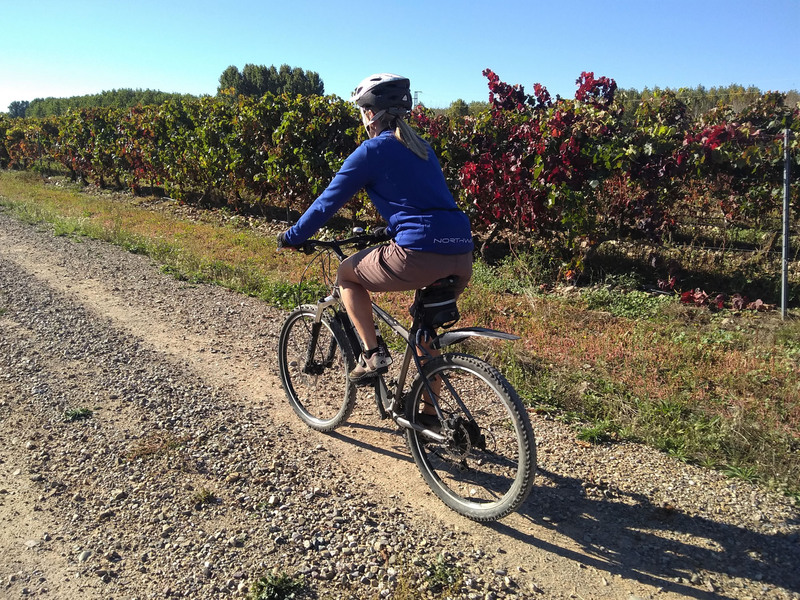 We stayed on this side of the river and followed a small irrigation canal back west, through more expansive rows of colourful grapevines. This route led us through Anguciana then into Cihuri, with its old abandoned bridge, once maintained for passing pilgrims by the local monastery. Nicky suffered another puncture on our return to the outskirts of Casalarreina. Unfixable, we walked back, thankful we weren’t far from Benny. This likely spelled the end of our cycling on this trip, at least until we reach a larger town with a shop where we can buy a repair kit or spare tubes; we checked the local supermarket to no avail. Kids were playing football in the sports centre adjacent to the aire, but took their frantic, energetic noise back home at dinner time, leaving us again to pass a quiet night in the drooping shade of the tall willow trees. 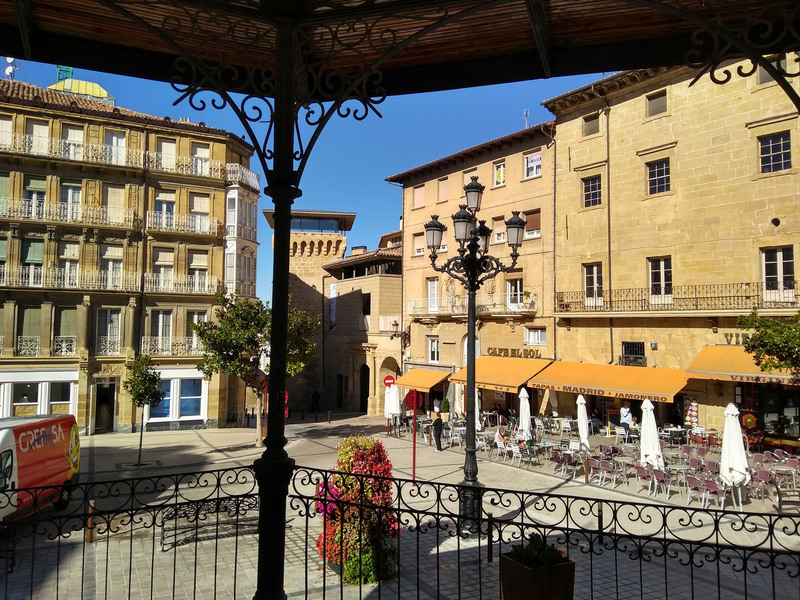 This entry was posted in 2018 Autumn Spain Trip, Cycling, In Spain, Our Travel Journal, Spain and tagged architecture, blog, church, countryside, Cycling, la rioja, old town, pueblo, Spain, sports, town centre, trees, vineyard, vistas, wine on Nov 7, 2018 by Aaron Hill. Under dull, monotone skies and with heavy hearts we again said our goodbyes to San Sebastián and drove south, away from the coast. The morning was chilly, a damp, hanging fog had descended and, combined with a light but bitingly sharp breeze, the heat from our limbs was ripped away. This was very different weather from our glorious arrival. 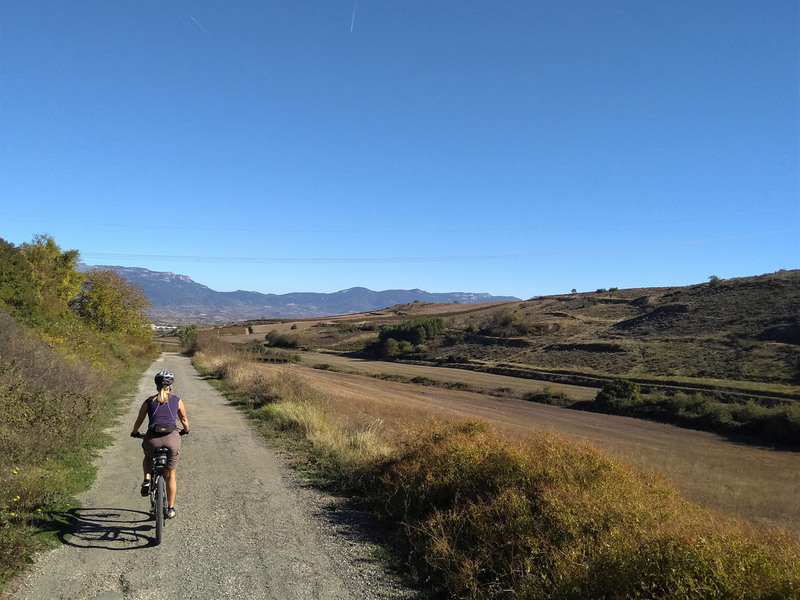 For twenty miles we remarked on how green Spain was looking, until suddenly the entire countryside transformed into blonde stubble fields and burnt grass, a palette of pale yellows and muted browns. It looked like this region had suffered drought and burning sun for long months. 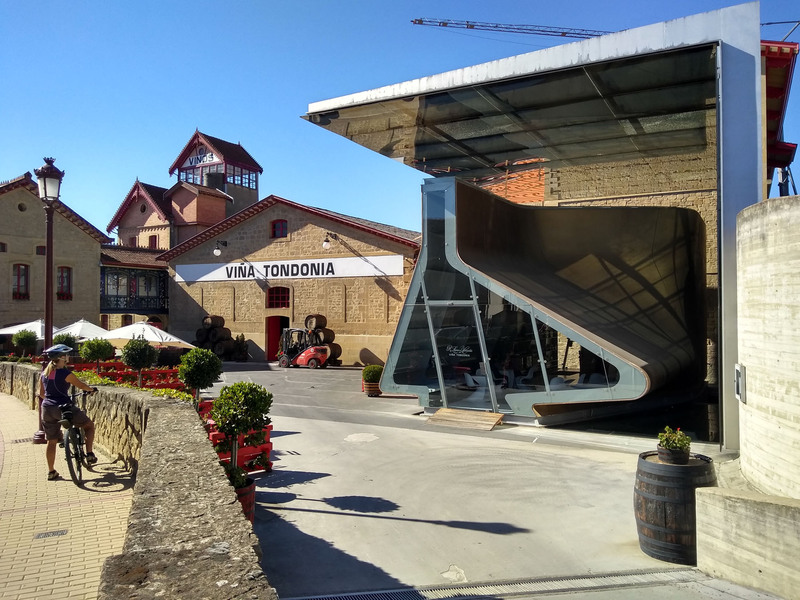 We were on an easy dual carriageway, twisted and steep as it navigated the hilly terrain, reaching the northern outskirts of Vitoria-Gasteiz. 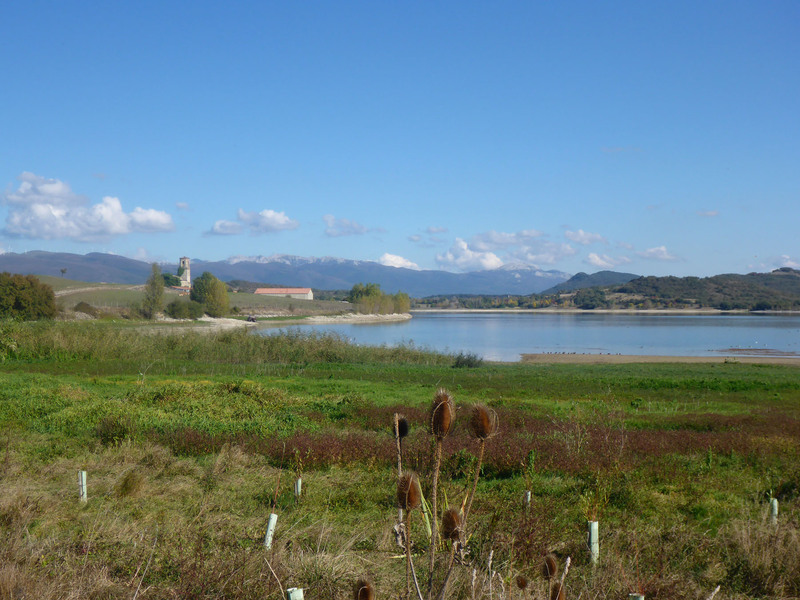 We had plans to visit Ulibarri-Gamboa lake for a few days of gentle running, walking and, perhaps, swimming. 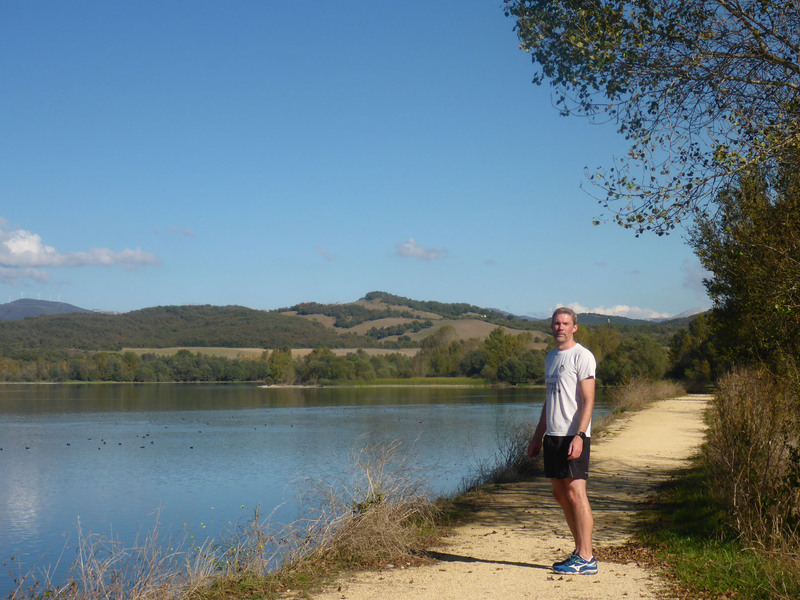 Our first stop was a tourist office at Garaio, near the south-east lake shore. Here we were informed that we could park overnight at one of the nearby car-parks, which proved ideal for us. We went there and ate lunch, marvelling again at our luck. The sun had broken through, burned off all the fog and the sky was a cloudless pastel blue. 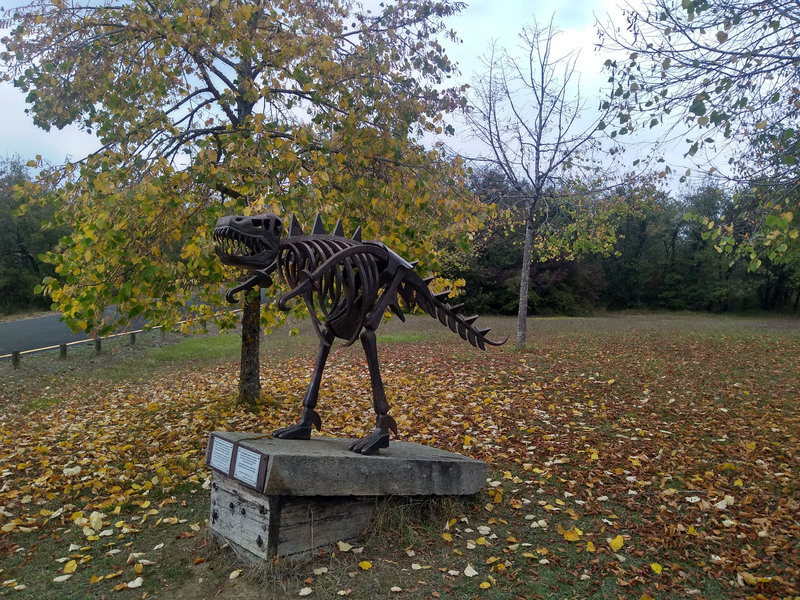 The trees lining the park were turning to the muted reds and amber of rich autumn colours, and best of all, there were no other visitors; the stunning lakeside park was all ours. 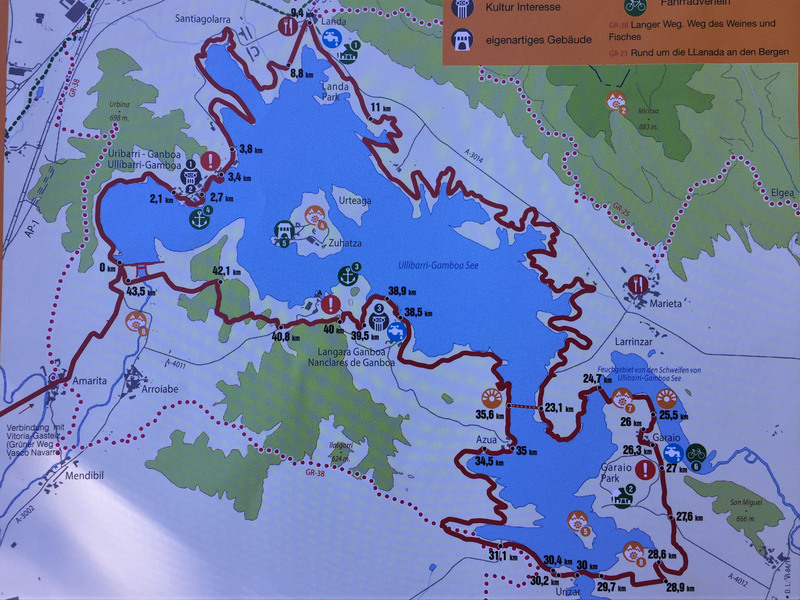 During a leisurely lunch armed with detailed maps from the tourist office we planned a 44km cycle (tomorrow) and a 13km easy walk/run (today), each hugging the shore. 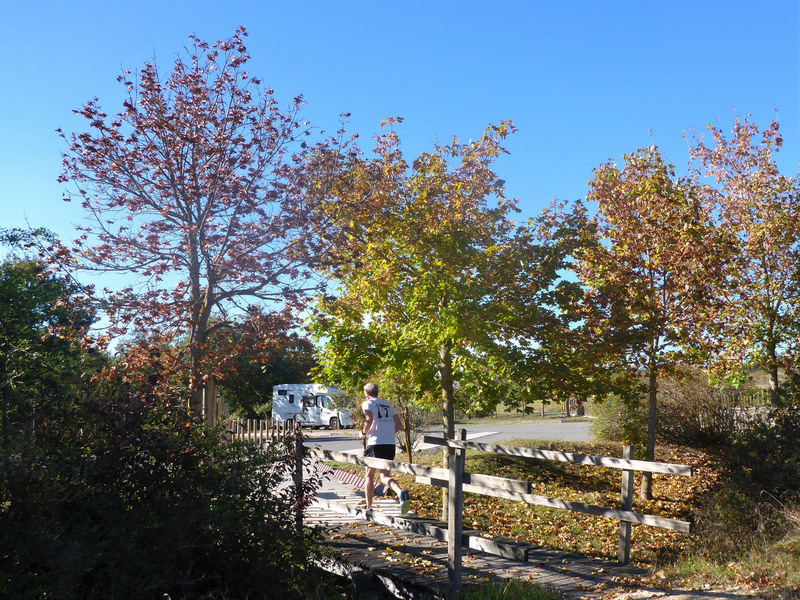 We set off in perfect running conditions; still warm air, wonderful autumn foliage providing occasional shade, no time constraints and with no one else in sight. We passed timber miradors overlooking wide, still rivers alive with grebes, coots and egrets, feeling a little guilty when our presence disturbed their restful day. The paths were leaf-strewn gravel or compacted white sandstone dust, perfect for exploring on foot. We crossed a low timber bridge, more of a pontoon, then later another more substantial, arrow straight bridge, built high above the water. We could see energetic sprites darting in skittish shoals below our feet. Just beyond this bridge crossing stood the ivy-clad remains of a stone church, the sole remaining structure from one of the many abandoned villages that were flooded back in the 1950’s during the formation of this important regional reservoir. Exactly on our 13km expectation, after passing loose cows on the path, we crossed a raised timber walkway that returned us to the rear of the quiet car-park where Benny was patiently waiting. 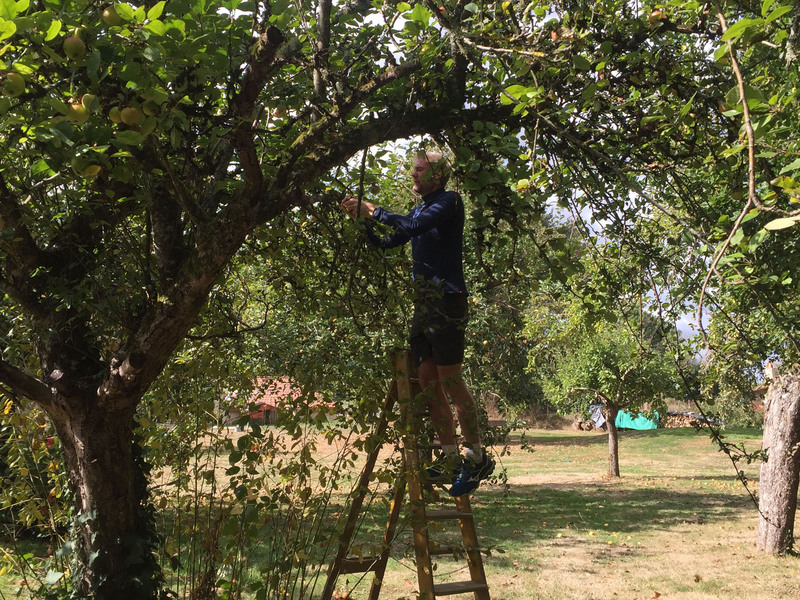 Joyed by the beautiful weather and happily weary from our beautiful, exploratory run, we spent a restful afternoon sipping tea and scoffing pannettone, amazed we’d found yet another gem of a stop. The stillness and quiet, mixed with fresh-air and exercise, led us both to a deep, lengthy sleep. After nearly 11 hours in bed, we were well rested and utterly famished. After breakfast we chatted to our new motorhoming neighbours Nadine and Chris, a couple who lived in the Vendée coastal town of St Jean de Monts. 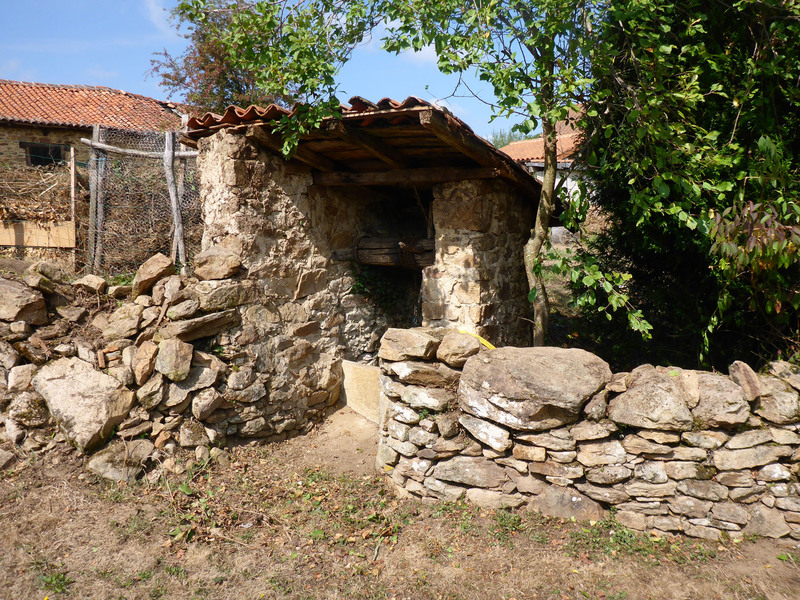 We have long been considering a circular coastal trip round Brittany, starting near Nantes, and their kind offer for us to visit anytime may make a very good starting point for our planning. We finally got moving, wary under very different conditions. The sky was now streaked with muted greys, almost black in places, layering the whole park with a shroud. Autumn foliage was no longer vibrant and bright, but consisted of muted browns and muddy olive greens. We hoped it might clear with time, but sensibly planned for the more likely scenario – dull, persistent rain. With waterproof jackets donned, we started off in the reverse direction of yesterday’s run, following the lake shore on easy paths. We covered distance quickly and soon were back at the tall straight bridge, but passed by rather than crossing. From here the path quickly deteriorated, a less used route. It was steeper now, up and down in rugged, rocky bumps, the surface deeply cracked and broken like it had recently been subject to flash floods. We had to dismount and push for a couple of the steeper climbs, the path too poor to gain traction. Soon after we joined a tarmac road, glad for the easy going. 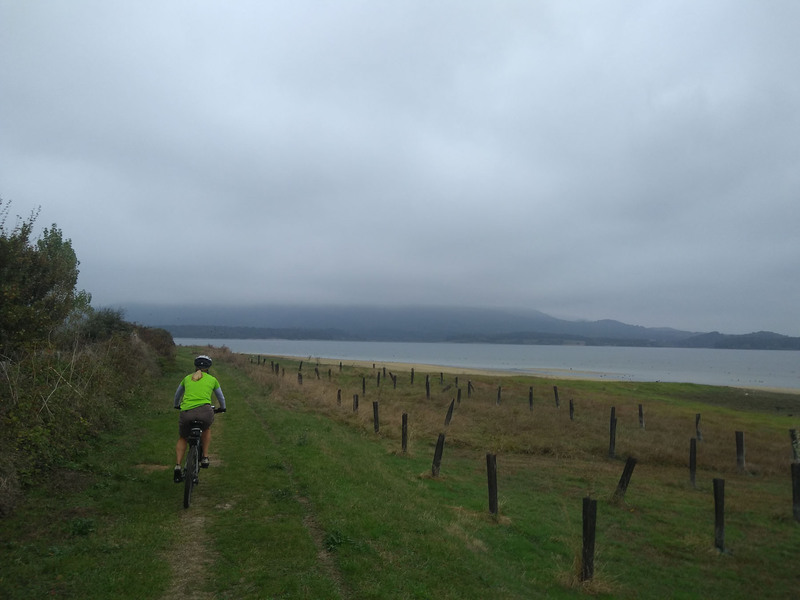 With a miserable drizzle filling the air, and with low visibility across the lake, we decided to stick on the road and enjoy a simpler stretch, cruising downhill and across a river before rising smoothly up to meet the main dam. 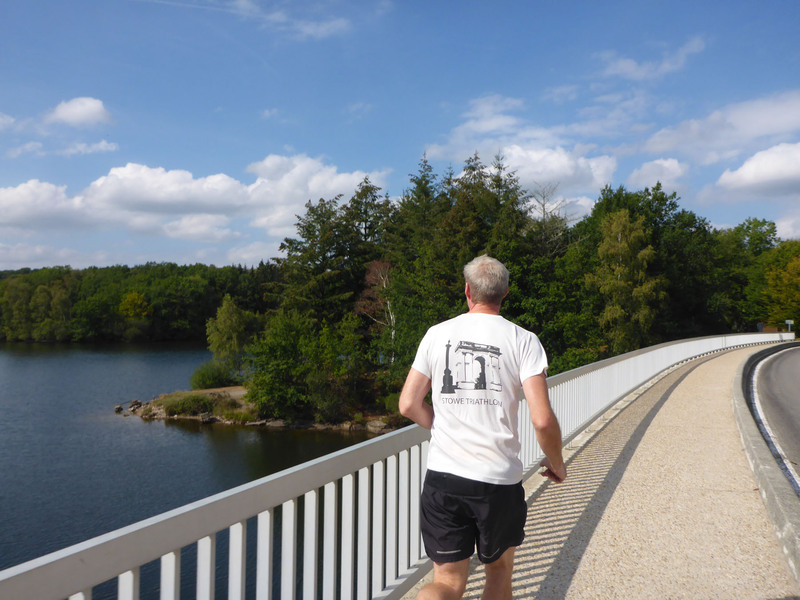 We paused soon after to nibble fruit cake on a timber bench and could barely see the walls of the dam opposite – such a different day from before. Soaked through and devoid of views, we pushed on with a shortcut in mind. Before we got there Nicky’s front tyre was punctured and we had to pause on the path, in heavy rain, to fix it. Only here did we discover all our glues had expired so a patch was impossible but we also carried a spare tube, so this was fitted and we were on our way again. 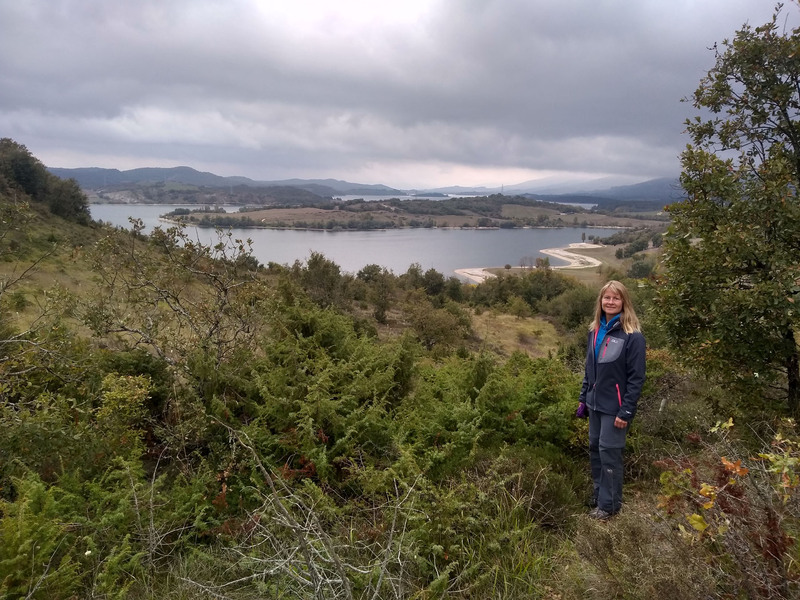 At the top left-hand corner of the lake, near Landa, we decided to forego the shore-hugging cycle route and, heads down, quickly progressed down the shorter, straighter, easy tarmac route to Marieta. Turning right off the road, we re-joined the wiggling cycle path, walked across a pedestrian bridge we’d ran over the day before and, after another grassy shortcut, we happily arrived back at Benny. Our shortcut had reduced the lap to 37km, rather than the expected 44km. Drying, cleaning, rinsing, showering and packing dominated our next hour, as we faced the usual motorhome struggle of what to do with a load of sodden gear, especially when the rains persist outside. We steamed cosily inside, reading and supping tea much of the afternoon. Late afternoon, after a warming rest, we got a little restless and decided on a short walk. The weather had dried up and small patches of blue sky were visible in the otherwise grey murk. We followed the road back towards the tourist office, before cutting left to ascend to a local high point. 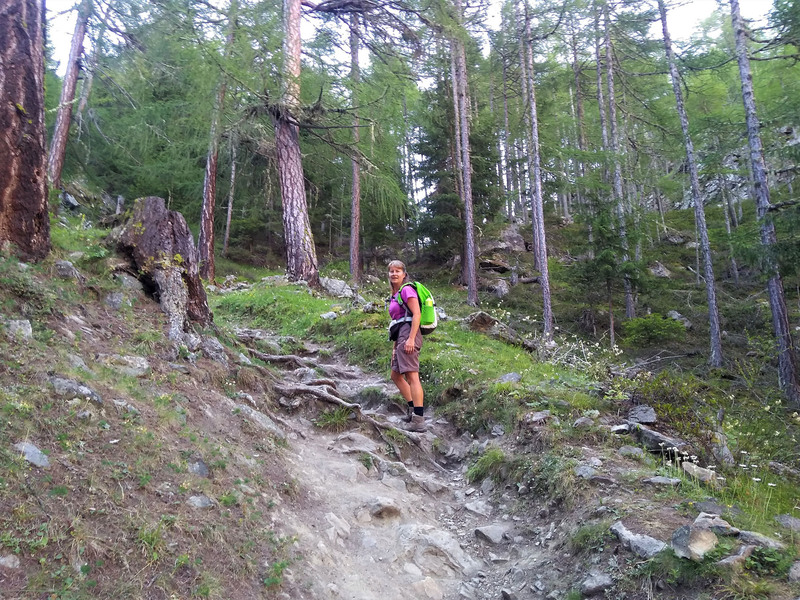 Stone steps formed the route, our leg muscles being tested again. Adding just this small raise changed the perspective over the lake. We spent a few restful moments at the top picking out places we had visited and spotting key landmarks in the rolling landscape. A small number of vivid copper trees lit up the vista, set between a sea of darkened green, lime and white leaves. At a distance we could just see the river that had been dammed to form the reservoir. At the bottom of the mound we passed a metal sculpture of a dinosaur-like creature that, like the polar bear in Tromsø before it, just had to be climbed. (always a child at heart). 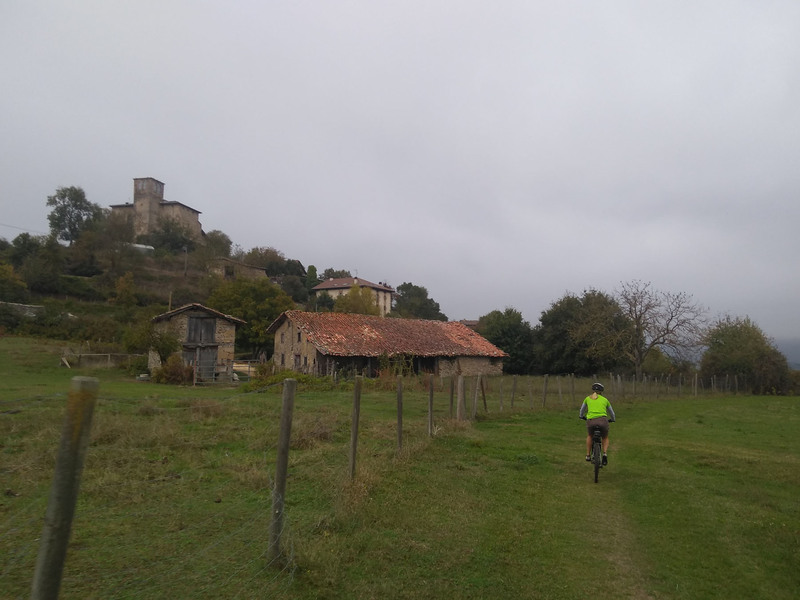 This entry was posted in 2018 Autumn Spain Trip, Cycling, Hiking, In Spain, Running, Spain and tagged autocaravana, autumn, church, countryside, Cycling, lake, limoges, nature, park, Spain, Switzerland, trail running, travel on Oct 26, 2018 by Aaron Hill. We left La Jourdanie late, the packing for a three week trip taking longer than anticipated. We had thought we were nearly ready, but the final essential items to add still ate up our morning – so much for an early start in Benny. 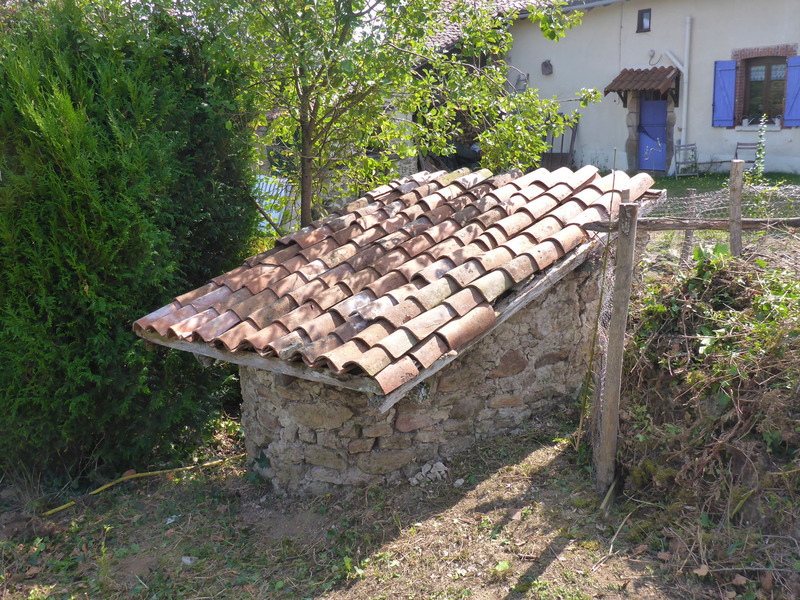 We were finally away by 11am, heading south, pausing only to empty our recycling tubs as we passed through Châlus. 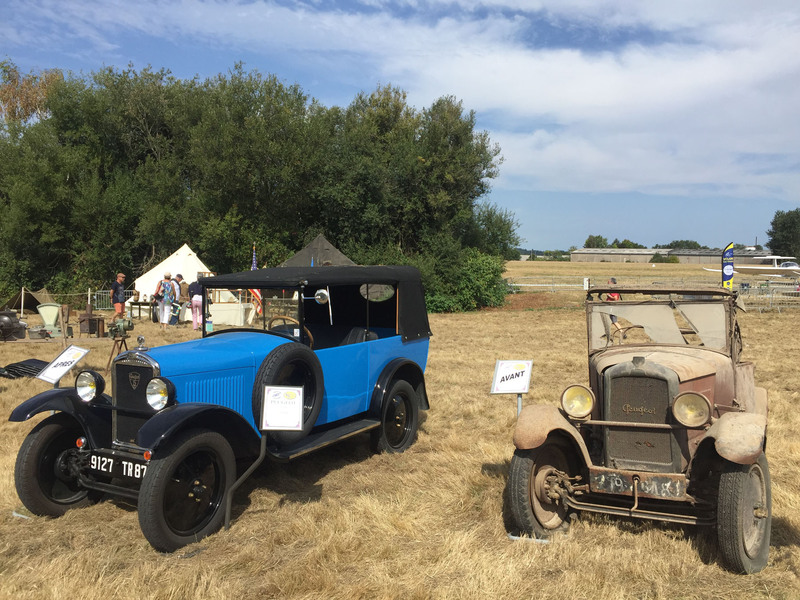 Now-familiar roads carried us to Thiviers and around the west of Périgueux, where we called into a Benimar dealer to see about a few niggling items, forgetting that all but one were actually Fiat issues. Large plops of rain dulled the day as we passed Bergerac vines with the first hints of autumn colours, set in fields lined with golden red ferns fluffed up like bright plumage. 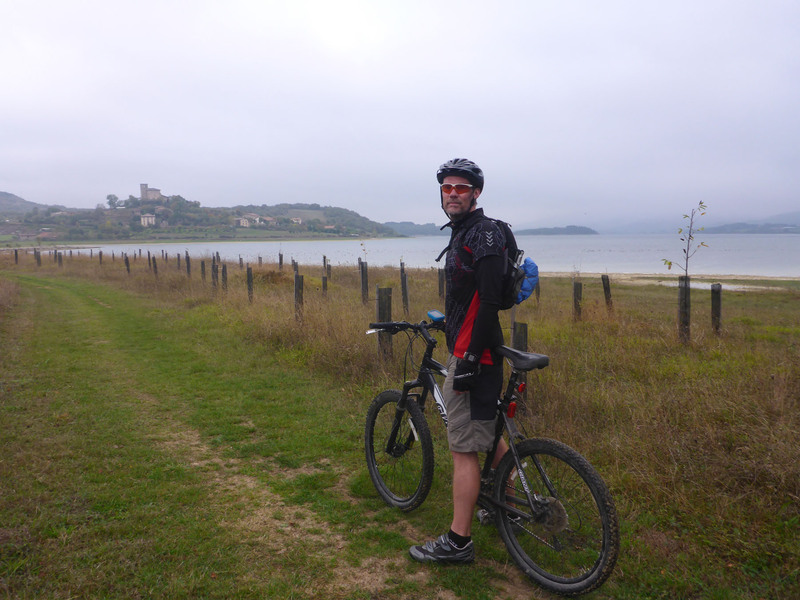 We passed more familiar villages, places with aires we’d once stayed at, others we’d cycled to or visited on walks. Many looked different, lessened in the muggy rain, not matching the perfect memory of the clear blue skies filled with warming sunshine our memories dredged up, or had perhaps created. 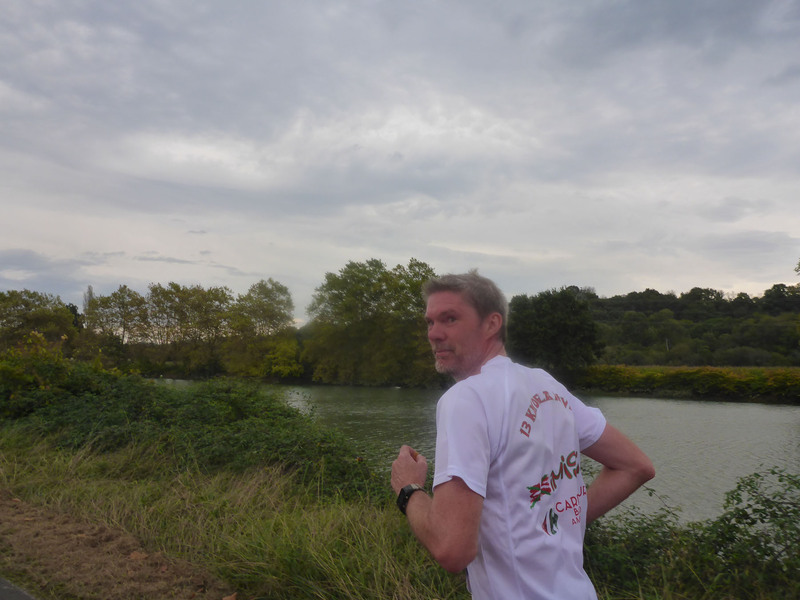 We crossed the calm flow of the rivers Isle, Dordogne and the Garonne. 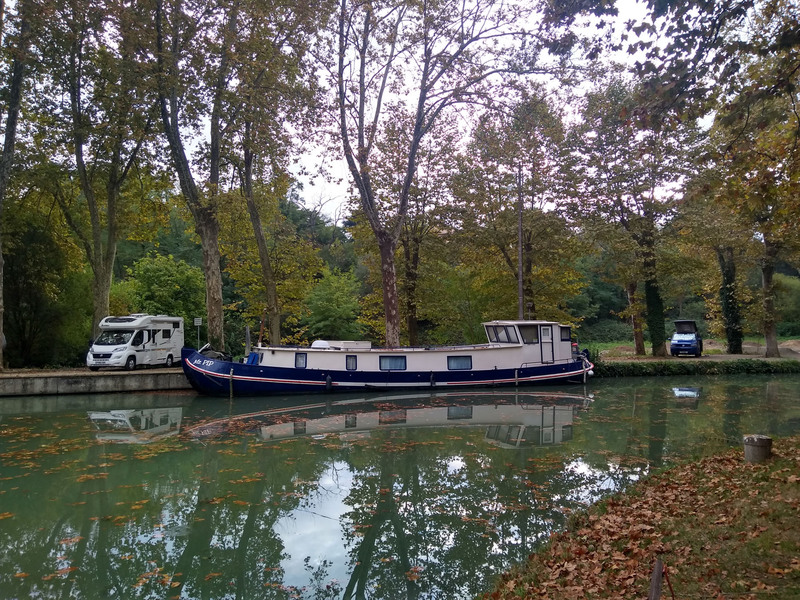 We reached our first overnight stop, Caumont, a small free aire on the banks of a canal flowing parallel to the Garonne, the same stretch of canal where we spent much of our time running and cycling during our La Reole house-sit. 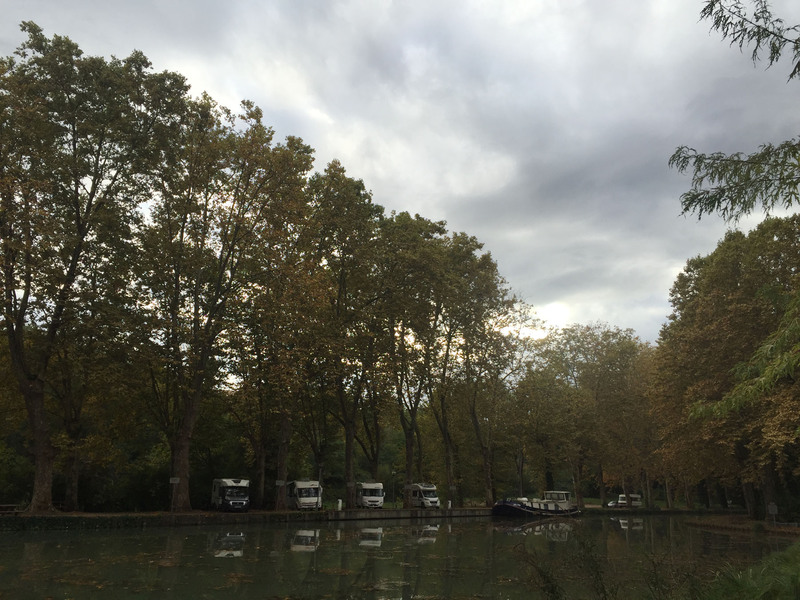 We parked up under tall plane trees laden with yellow leaves and reflected on the simple serenity, the instant hit of peace that can be found in some well-positioned aires. Inevitably the church bells began and we started to reconsider, but even their incessant ringing was tuneful enough to soothe us rather than annoy. 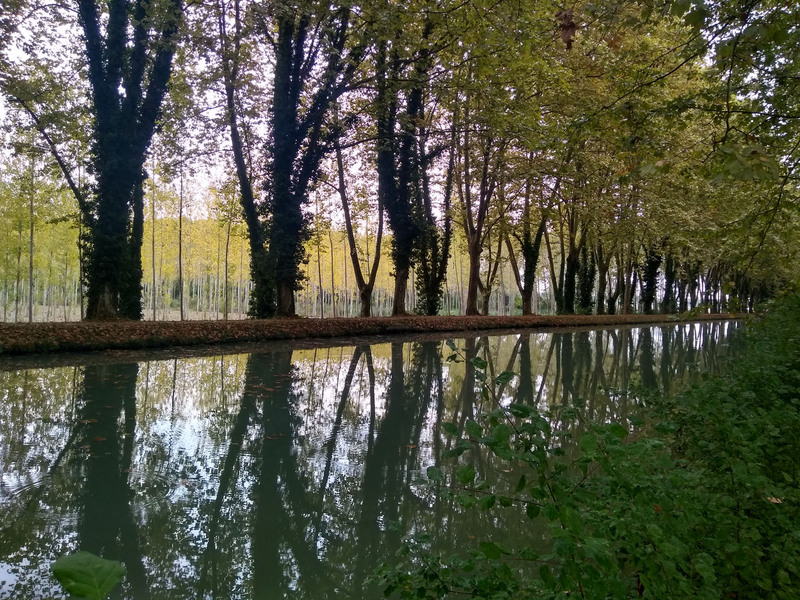 We enjoyed a short walk along the canal banks, watching the drifting yellow leaves drown in the milky green water, before pizza, darkness and bed. The next morning brought a longish drive, on ruler-straight roads through scrub and wild woodland. 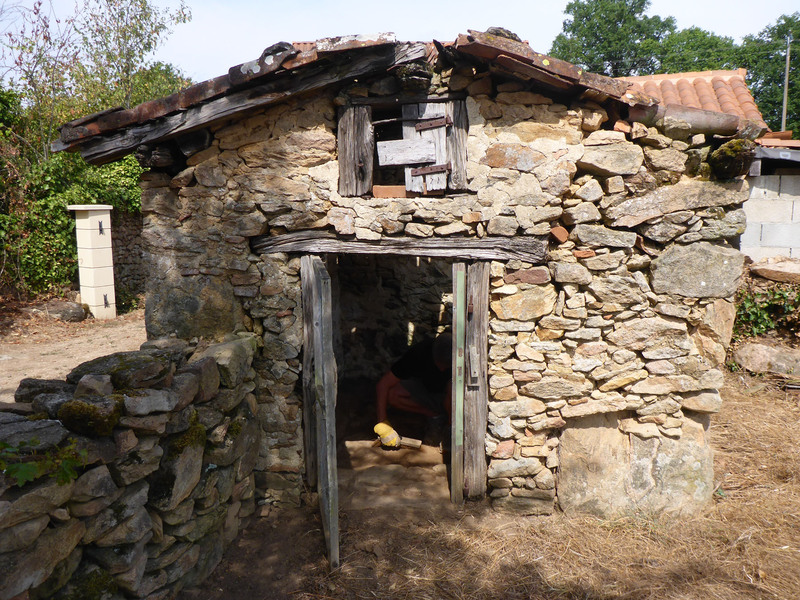 We were back in the true south-west, empty and sparse, with only the brief oasis of small villages breaking up the monotony. 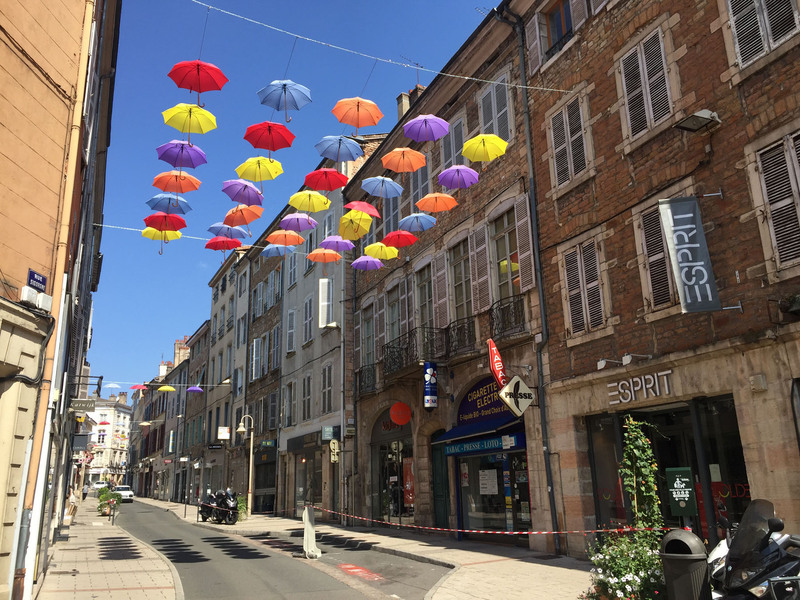 We had vague notions to visit the only large town on our route, Mont-de-Marsan, but on arrival it was solid with parked cars for miles in all directions and we saw nowhere easy to stop. Rather than loop around and spend time hunting out a place to park, we kept on, back on the long straight road to the bottom corner of France. 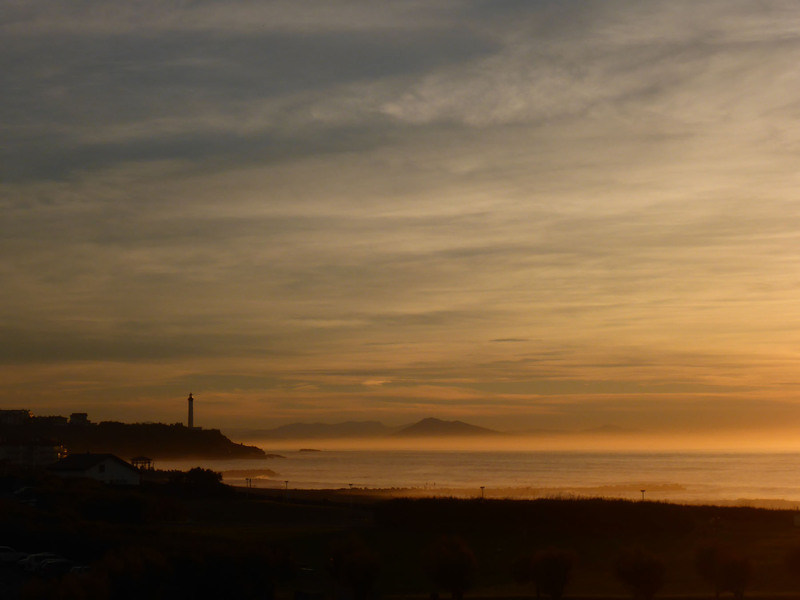 We stopped a little to the north west of Bayonne at a paid aire (€6 / night) in Anglet, on the coast. 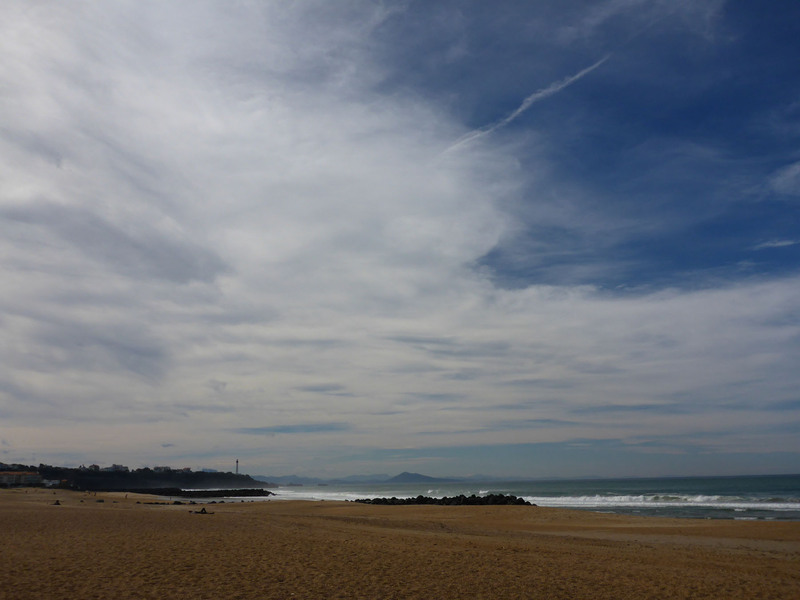 It was two minutes from Biarritz’s north beach, where we spent most of the afternoon watching the wild, powerful waves break hard on the sand. 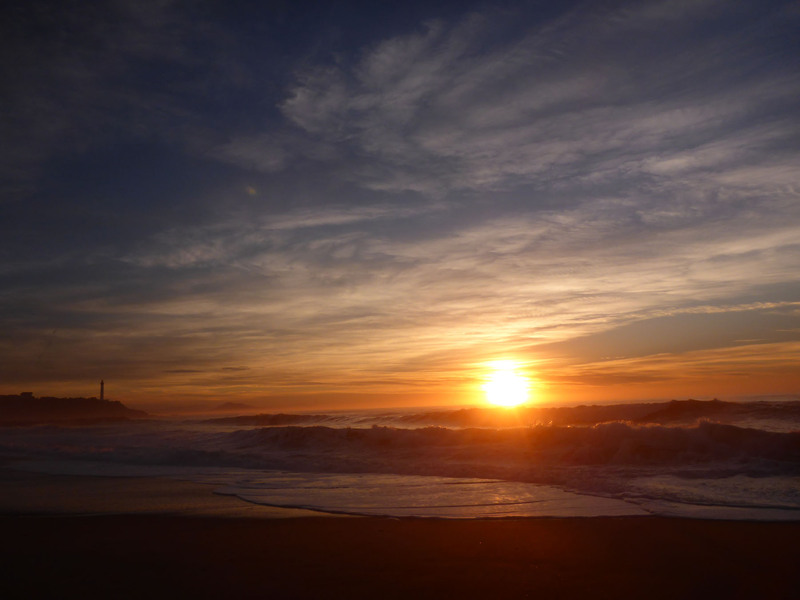 We returned for dinner then headed back to the coast to be bombarded by an incredible sunset on a busy beachfront boulevard. 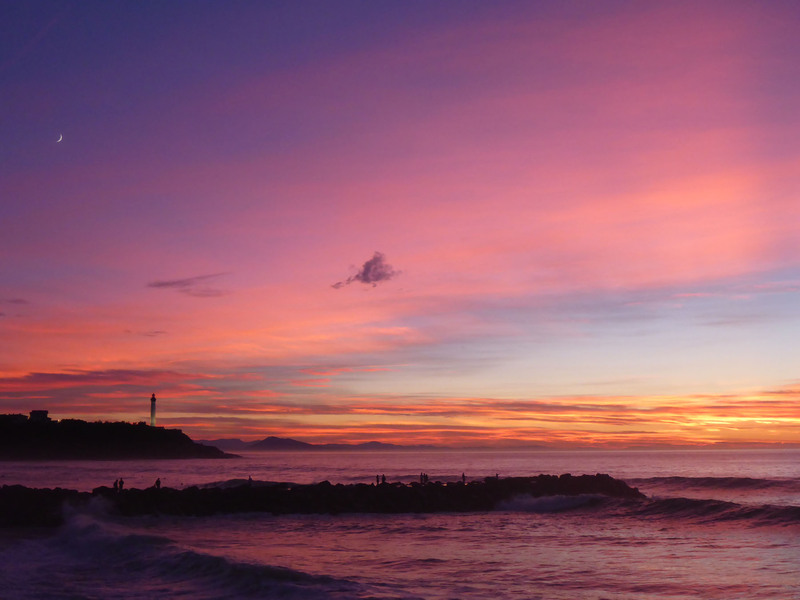 Walkers, runners, skateboarders, surfers floating in the pinkish water framed by a backdrop of wild red sky, families walking dogs, drinkers, eaters and selfie-takers. Active and vibrant, thoughtful and serene, the only negative were the occasional swarms of roaming sandflies. 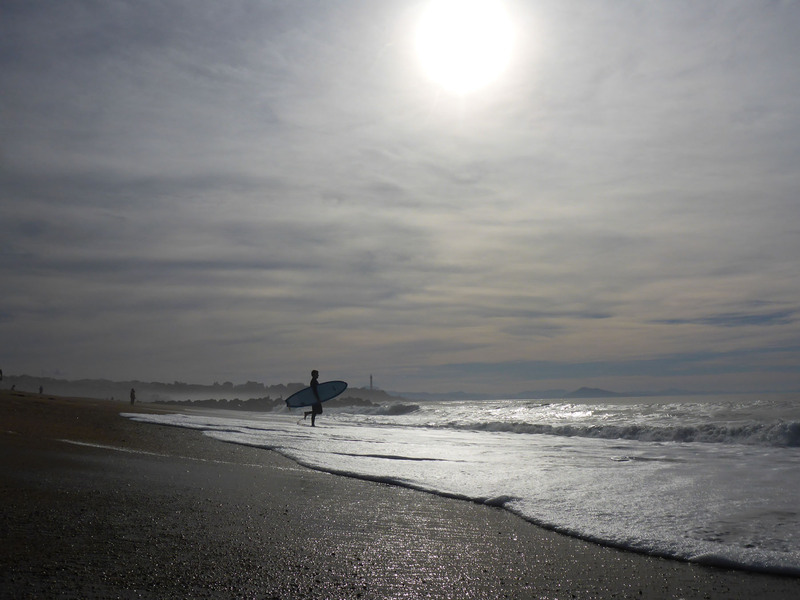 Many water-babies, tanned and tattooed, were standing wrapped in fleece towels, shivering gently after a full day of attempting to surf that perfect wave. 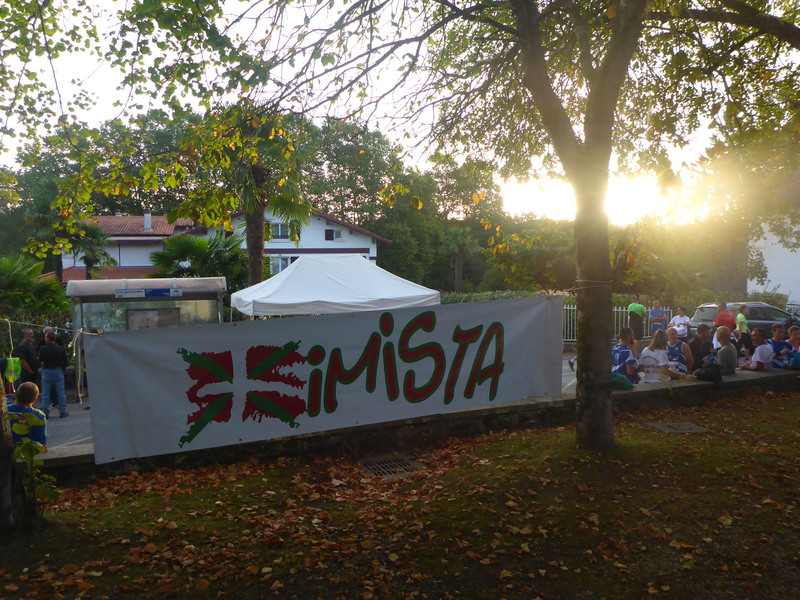 There was a wonderful vibe, chilled and easy, a proper community feel for the entire length of the shore. Very different groups were mingling peacefully to enjoy the warm autumn evening and the exploding sunset. We felt privileged to be here at this moment, the fall of the dice aligning perfectly for us. We have to remember to keep appreciating it all, this glorious freedom we have. The crashing thuds of the waves kept us awake, seemingly creeping closer and closer in the dark, unknown stillness of the night. We finally slept and awoke late, a welcome benefit of our fluid lifestyle. 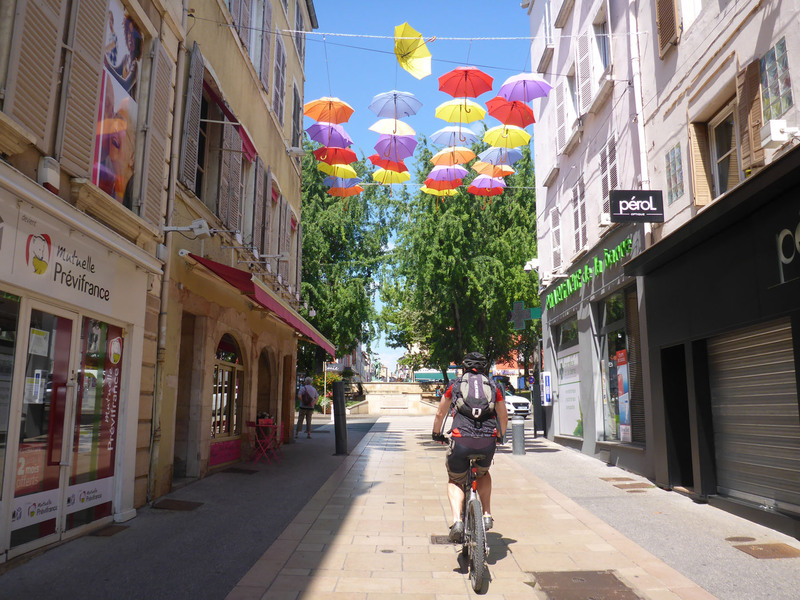 We readied our bikes and cycled off, towards Bayonne; we had a race to complete our registration for and a city to discover. We zagged across empty roads, passing hugely impressive houses, both ancient and brand new, hidden behind high walls and tall trees. We reached an off-road area with a network of criss-crossing parkland trails, pine needles and ferns draped over a deep sandy base. We climbed up small, steep hills, dunes really, with our back wheels spinning out in deep sand, making the rises that much harder to summit than we’d expected, or hoped for. 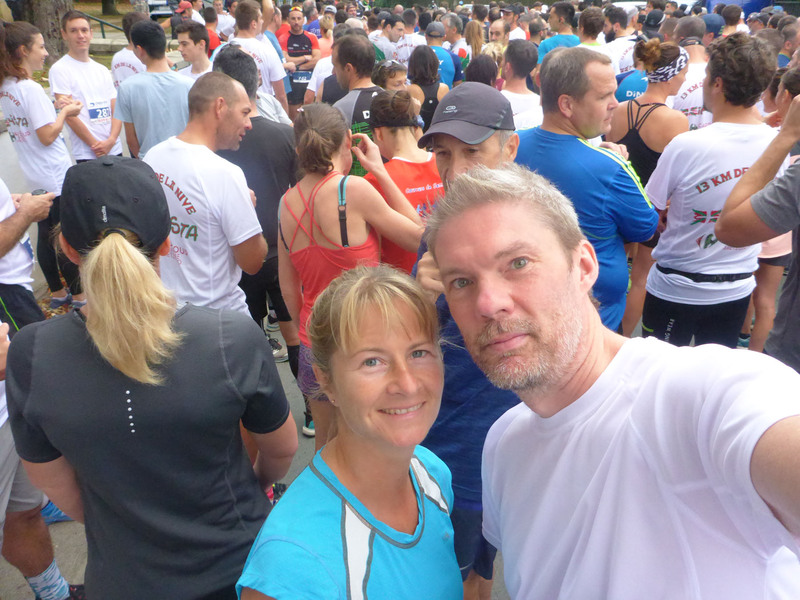 We headed first to the Stade La Floride, where we would catch a bus early Sunday to take us to the start of the race, only to find this was not the actual location of the registration. 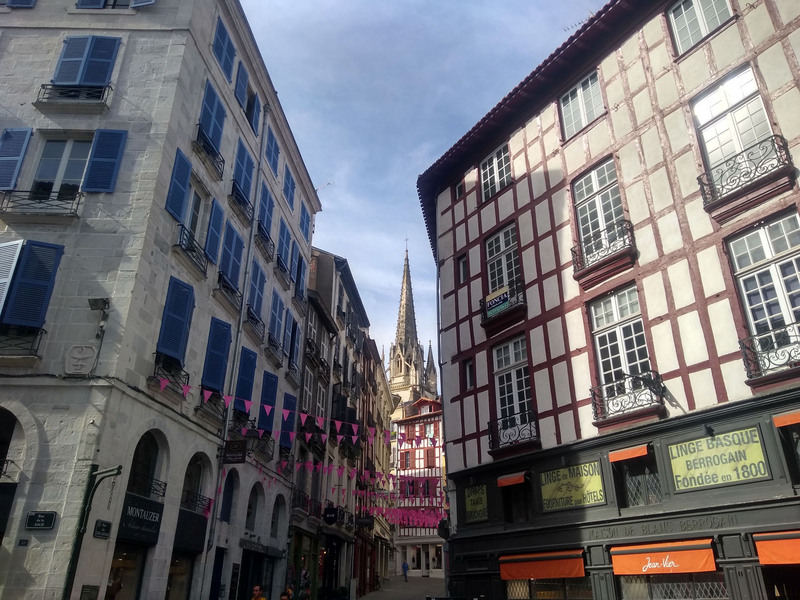 We doubled back into town and after a few more false stops we located the correct place on Rue de Basque just moments before it shut for a two-hour lunch. We happily collected our T-shirts and race numbers, safely tucked them away and were then ready to explore the city. 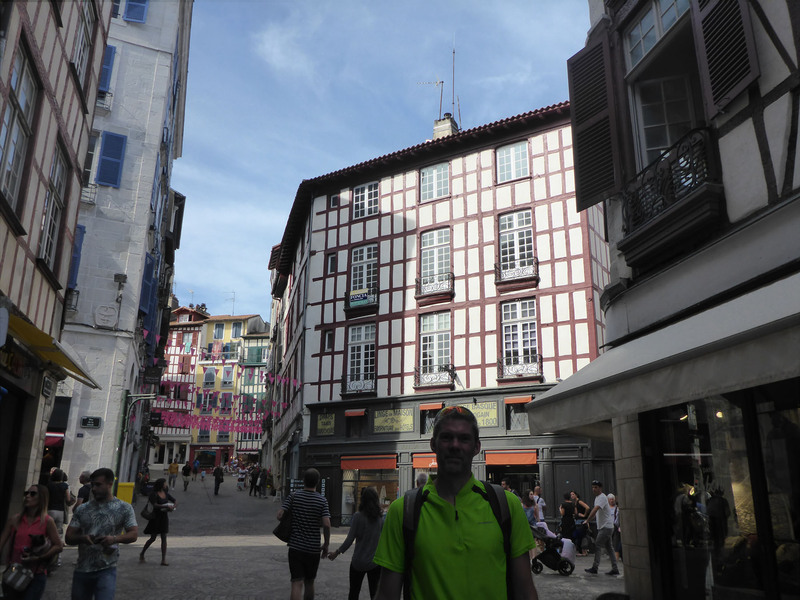 First impressions – Bayonne was a delight. The day had reached 28 degrees before lunchtime, unexpected by us in mid-October. A produce market filled a long, thin plaza set along a stretch of the river Nive, and narrow streets brimming with boutique shops and busy cafés led off in every direction. Five or six storey townhouses lined these streets, their colourful shutters closed against the sun, some timber-framed, many with stone-arched passageways at ground level utilised as commercial premises. 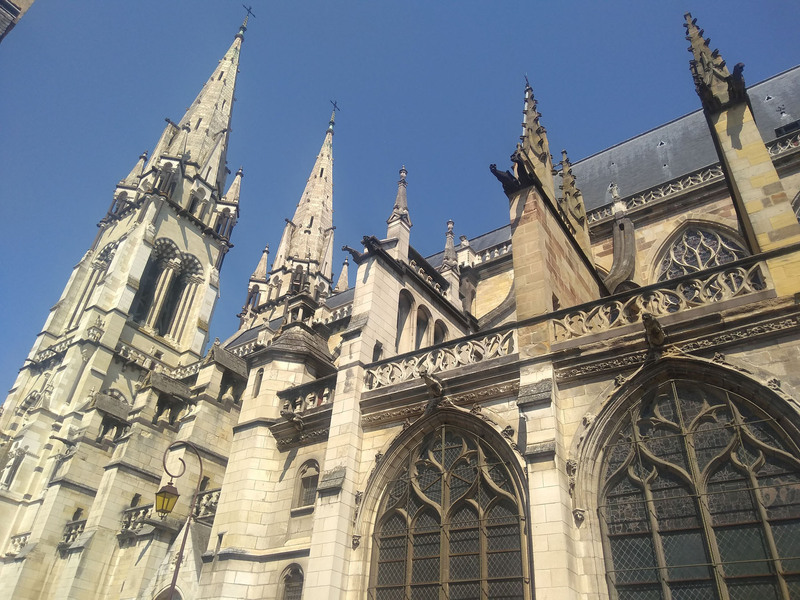 The domineering twin peaks of Bayonne cathedral, the Gothic Cathédrale de Sante-Marie, were always visible above the rooftops. A wonderfully colourful and fragrant permanent covered market selling a wealth of tempting delicacies teased our senses. They were serving tapas and wine at makeshift bars, and in several places we heard more Spanish than French being spoken. 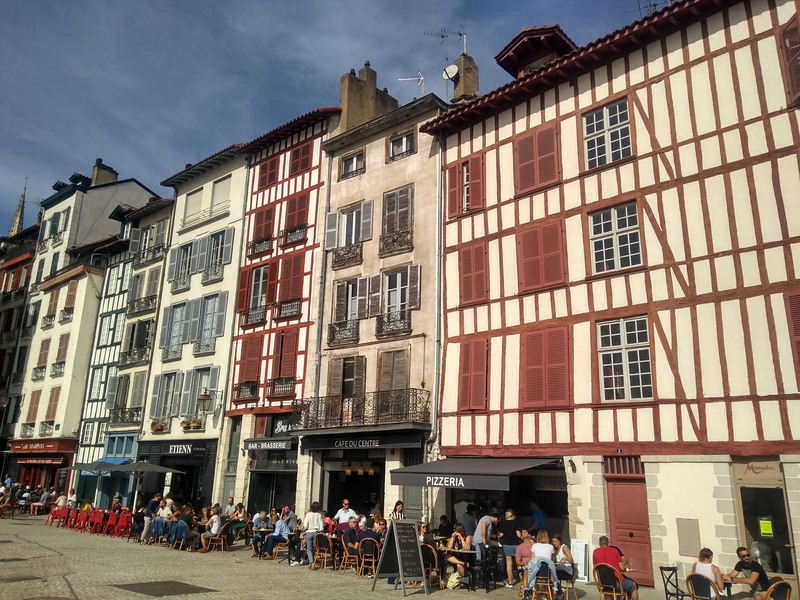 We had no prior knowledge or any real expectations of Bayonne, so were utterly contented to have time in this gem of a city. 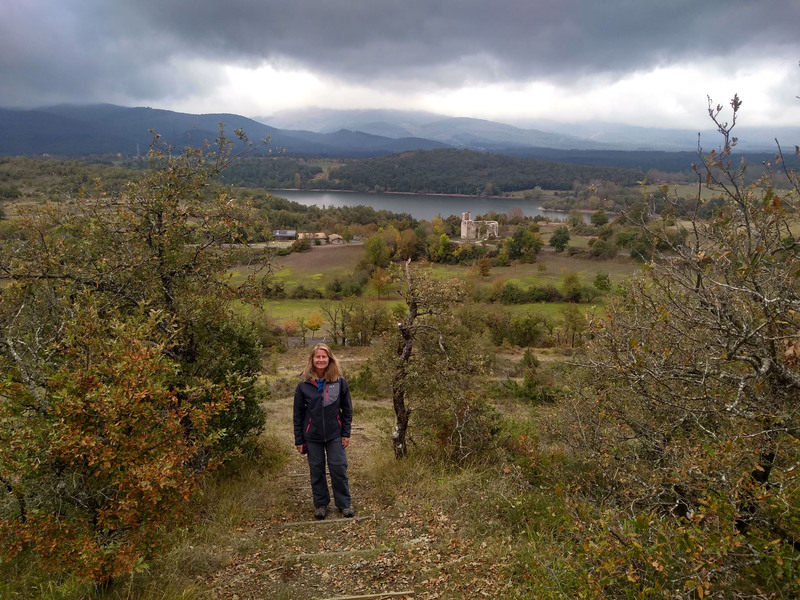 We had dismissed it two years ago as we passed, eager to reach Spain and the Picos de Europa, and we’re now sorry to have done so. We sat on the cathedral steps and watched a wedding photoshoot where the bride, not to be outdone by her groom’s orange waistcoat, donned dark sunglasses and a blue denim jacket over her flowing silk dress. 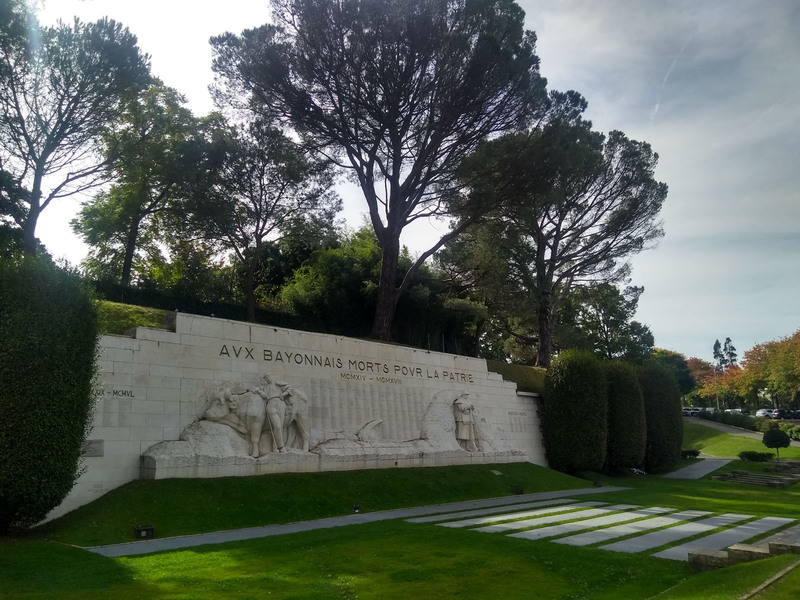 We wandered through the nearby Botanic gardens to reach the Monument aux Morts, the grand memorial to the war dead from Bayonne. We continued our stroll to the Hôtel de Ville and adjoining Opéra house, buying our mothers local postcards in a small tabac off the Place de la Liberté. We wandered a while longer, lingering on busy streets to soak up the sights, smells and sounds, before returning to our bikes, abandoned on rails beside the cathedral. We cycled back on the easier but slight longer coast-hugging cycle path, through the more practical, robust, industrial northern harbours. 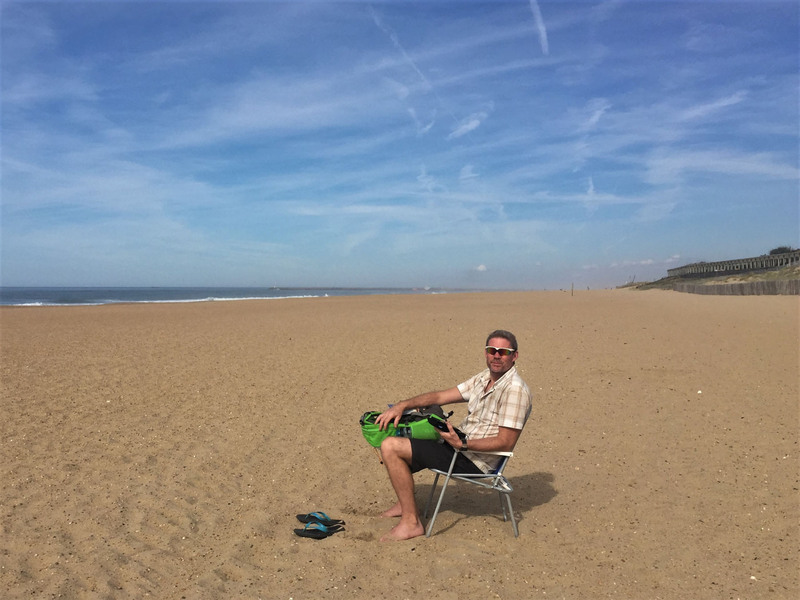 The rest of our day was spent back on the beach, our skins gently bronzing, watching an unending conveyor belt of waves crash into 3m diameter tubes of white foam and froth. 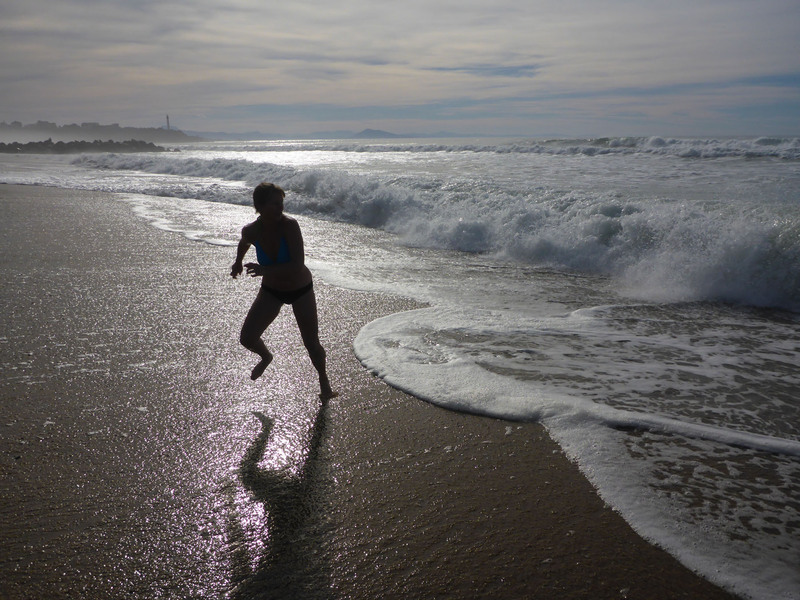 It was a delight to lazily watch nature’s wild sea, but it conflicted with our desire to swim. The next morning was race day. After a self-imposed alarm and a quick pack up, we no doubt annoyed our neighbours with our Sunday 7.15am exit, the day still wrapped in moody darkness. We parked up at the Stade La Floride, ate breakfast and dressed for action. 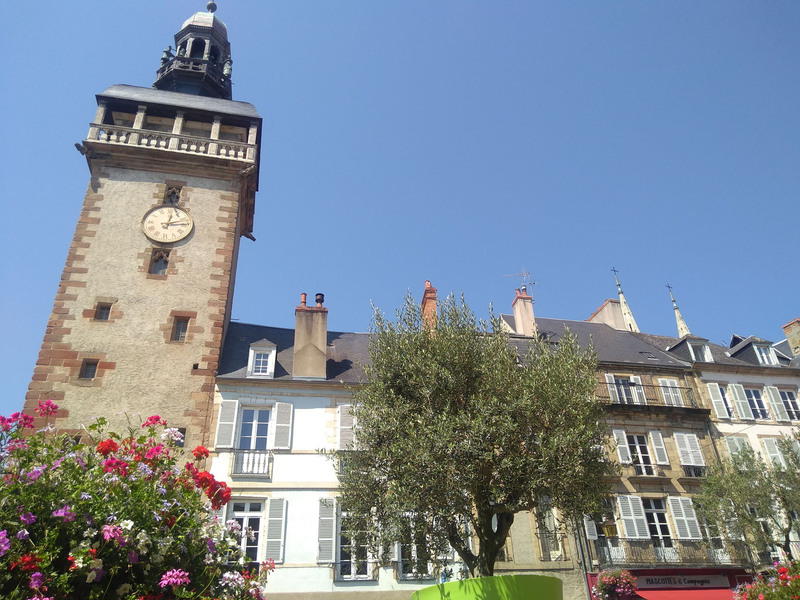 The first buses left from here for the town of Ustaritz at 8am, where we would run the 13km back to Bayonne, along the banks of the river Nive. We caught a bus and it smoothly deposited us by the village church to await the 10am race start. There were no facilities here, and no water available (they had coffee though) and we wished we’d waited for a later bus. We mused about, pretending at a thorough warm-up, but fooling no one. More stripy buses periodically arrived, carrying the 350 or so race entrants to the over-crowded start area. The trees and bushes of the church grounds were soon overrun with lycra-clad hooligans peeing everywhere, trying and failing to be discrete. Eventually we were called to the start and the race began, first through the town streets on temporarily closed roads before cutting onto a wider than expected path following the banks of the river. Small pockets of spectators clapped us on, with a few small kids delighting in high-fiving passing runners. Avoiding the scramble, we’d started near the back of the field so had the guilty pleasure of slowly picking off the slower runners, one or two at a time, as we made our way towards the finish, a bright string of colourful vests stretching out into a long line in front of us. The river was hidden from view for long stretches and the snatched views of it proved not as picturesque as we’d hoped, although we did see single skullers gracefully skimming past on the still waters. The route was paved and flat the entire way, all easy running, or at least it would be for those runners who’d trained sufficiently. After 10km the lack of recent distance in our legs began to tell as our pace slowed rather than increased as we’d hoped. The last 3km were a slog, but we were buoyed by larger crowds and our arrival at the stadium. Sadistically, they then made us complete a lap of the running track before allowing us to cross the finish line in relief. 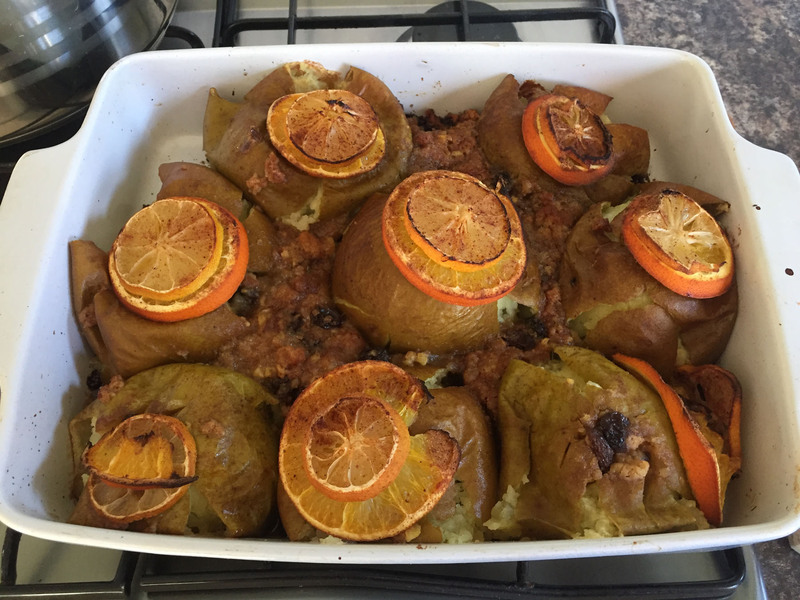 We gorged on cake, chocolate, apricots, bananas and oranges at the finish, then luxuriated in long, steaming hot showers in the changing facilities of the sports centre. Glowing from our run, we paused to watch a high quality rugby match, before driving Benny back to the same aire to relax for the afternoon. No sooner had we slotted back into the same spot (such creatures of habit) the heavens opened in violent torrents, but contented and weary we rested up snugly in Benny – let the weather do its worst. 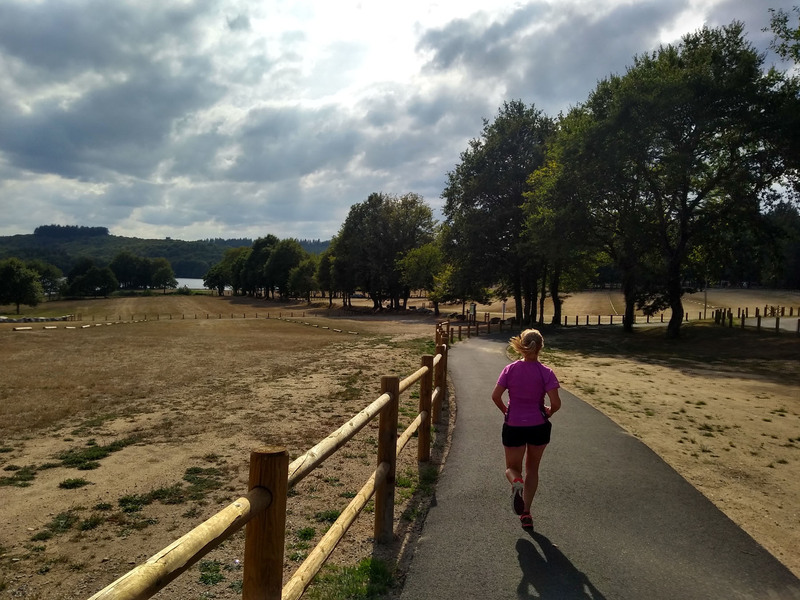 This entry was posted in 2018 Autumn Spain Trip, France, In France, Our Travel Journal, Running and tagged architecture, beach, canal, church, Cycling, driving, France, markets, nature, race, river, sunset, Swimming, trail running on Oct 20, 2018 by Aaron Hill. After our relaxing, relatively speaking, week of birthdays and dinner parties, we continued with our renovations and works. We were refreshed, attacking jobs with a renewed vigour and keener eye. We ticked off many items but our to-do list continued to grow longer as we discovered other items needing replaced or other projects we suddenly felt excited by. Ensuring variation in our tasks kept our interest and energy high. Our focus is on working hard, but we have the freedom to stop, rest, take a day off, have a dip in the pool or try something new when the mood takes us. We are tied to nothing, our time is ours to use as we wish. 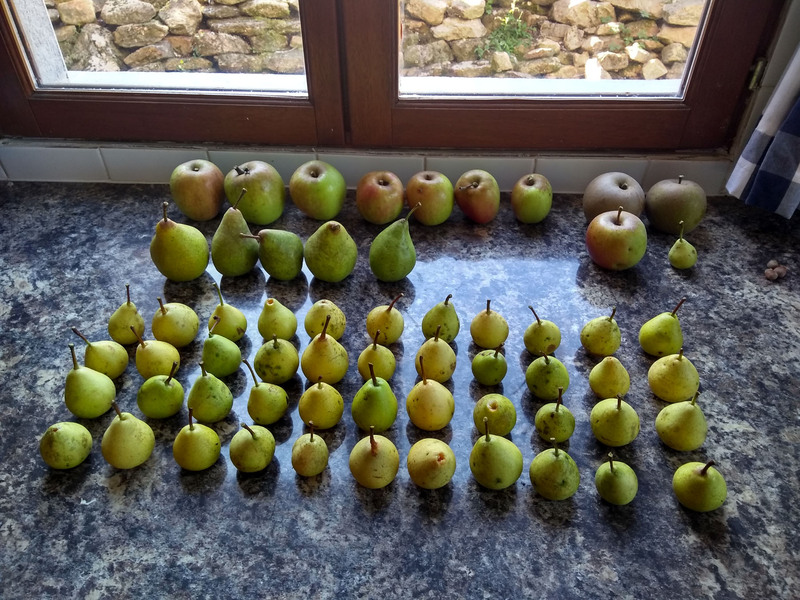 We have been foraging, baking cakes, learning music and languages, stone wall building, roofing, planning orchard tree layouts, digging our fledgling vegetable patch. 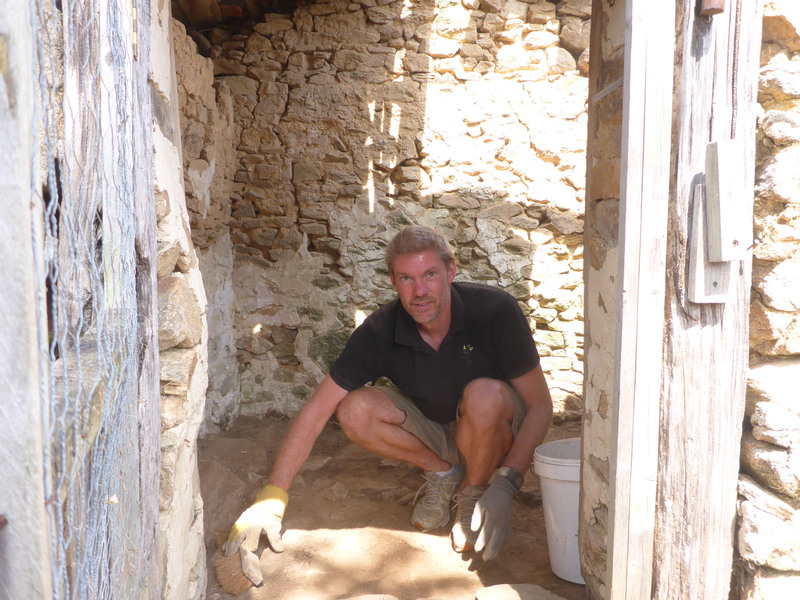 A previously ignored stone chicken shed, with a semi-collapsed roof, surrounded by weeds and with years of thick, compacted rubble inside was suddenly seen as a potential man-cave. I would sneak away to work on clearing this at intervals between prepping or painting walls. Looking for more outside jobs whilst the weather was good, Nicky got excited about uncovering the circular stone well set tight on our boundary. 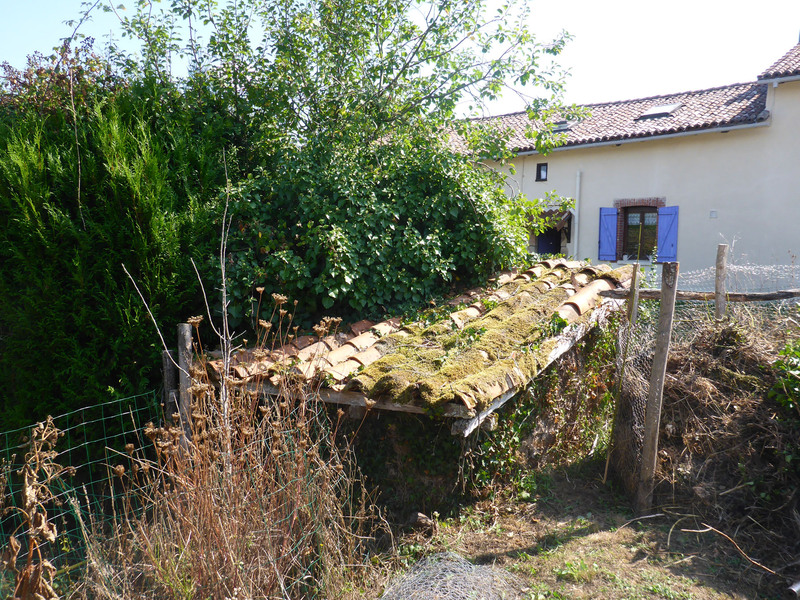 It was almost entirely blanketed in ivy, with a thick carpet of moss on the broken canal tiles scattered loosely around its ineffective roof. We added its revival to our long list of to-do works. 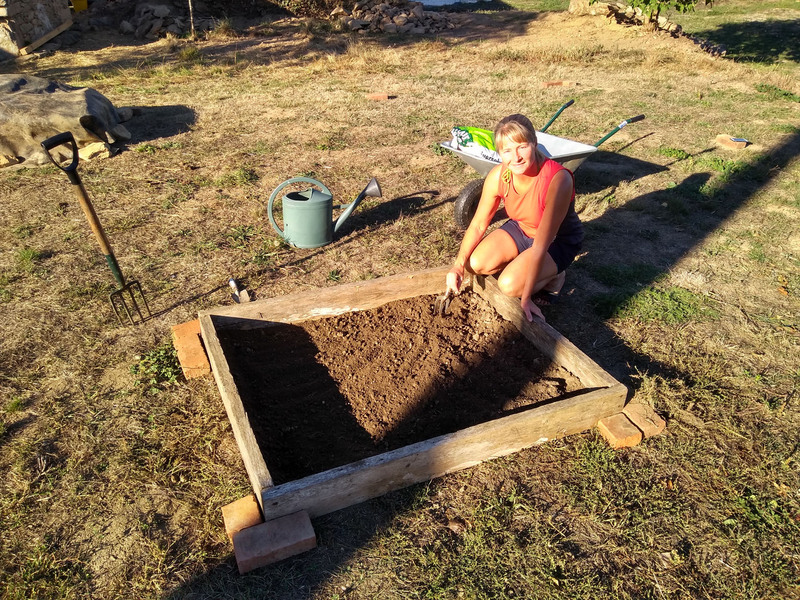 We dipped in and out of these unessential garden jobs at the whims of mood and weather, enjoying our time outside and the constant, obvious progress that such distinctive clearances offered. We had a visit from friends Monica and Ken from our previous house-sit in Cazeneuve. After a long, enjoyable road trip on their shiny new Triumph motorbikes, they arrived with us early afternoon. We fell into their easy company, swimming in our pool in the afternoon heat and sipping beers as we caught up. We later walked around our place, giving them the full tour and garnering their helpful opinions and experiences on the works we are undertaking or planning to do. 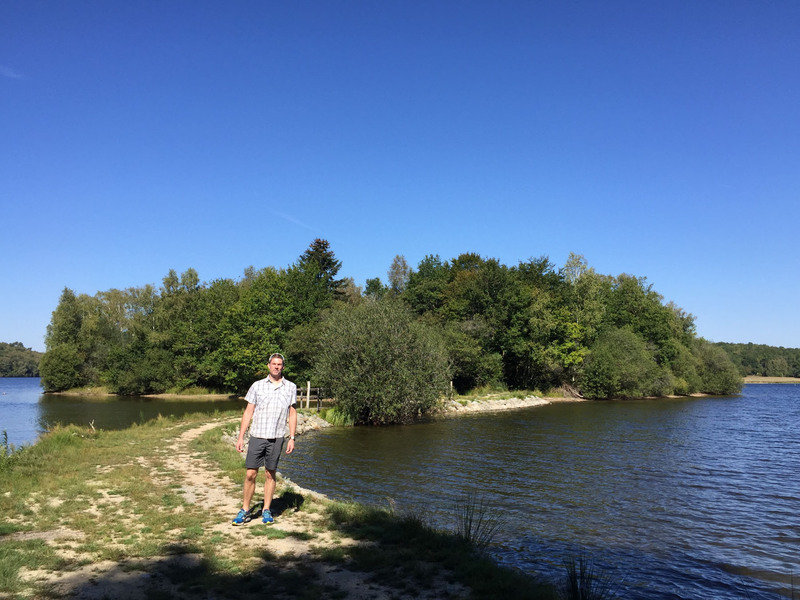 We took a leisurely walk along a local grassy chemin to loop around a small lake, before returning for an al-fresco dinner and drinks. We sat outside until darkness then retired to our lounge and chatted long into the night. After breakfast we said our goodbyes as they headed off to further explore our region, visiting our recommendations of Oradour-sur-Glane and Brantôme. 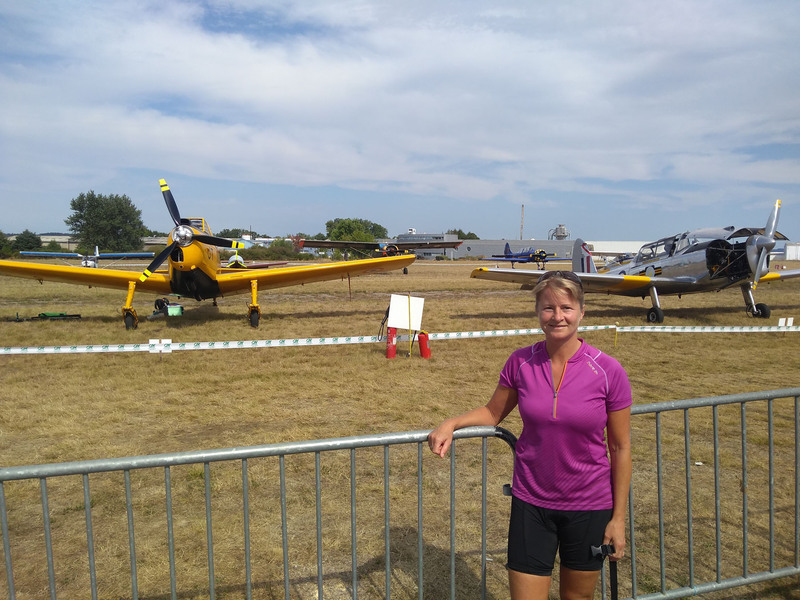 One fine day, as a different sort of effort, we cycled the 30km to Saint-Junien to visit an advertised airshow. We followed minor roads and off-road trails where we could, waggling our way north all the time. 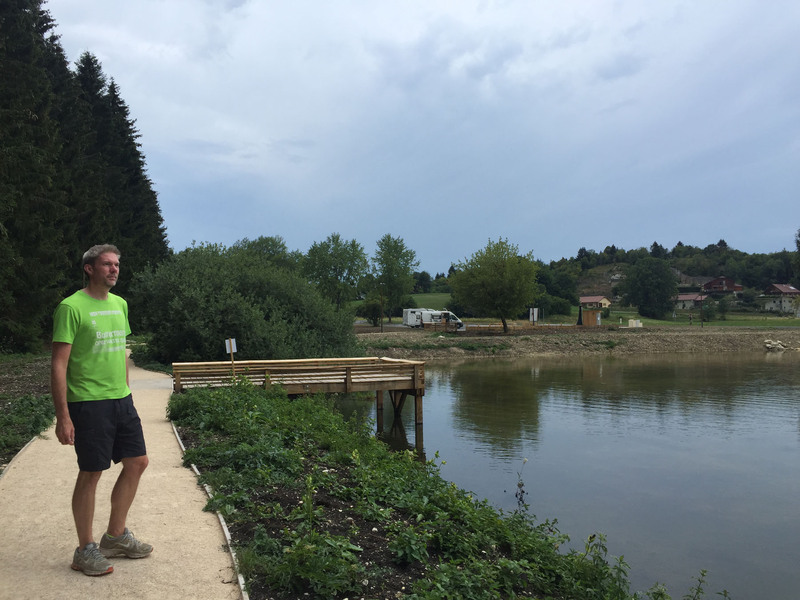 The route was mostly downhill, a very pleasant roll passing through the small hamlet of St-Martin-de-Jussac to the river Vienne where we crossed the bridge into St-Brice-sur-Vienne. 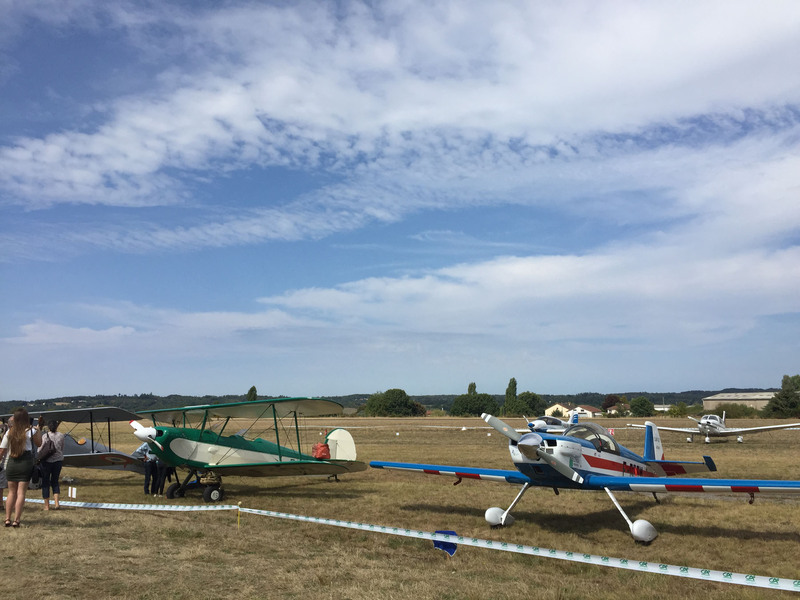 Only then did we face a long, steep climb away from the river to the top end of Saint-Junien to reach the hosting airfield. 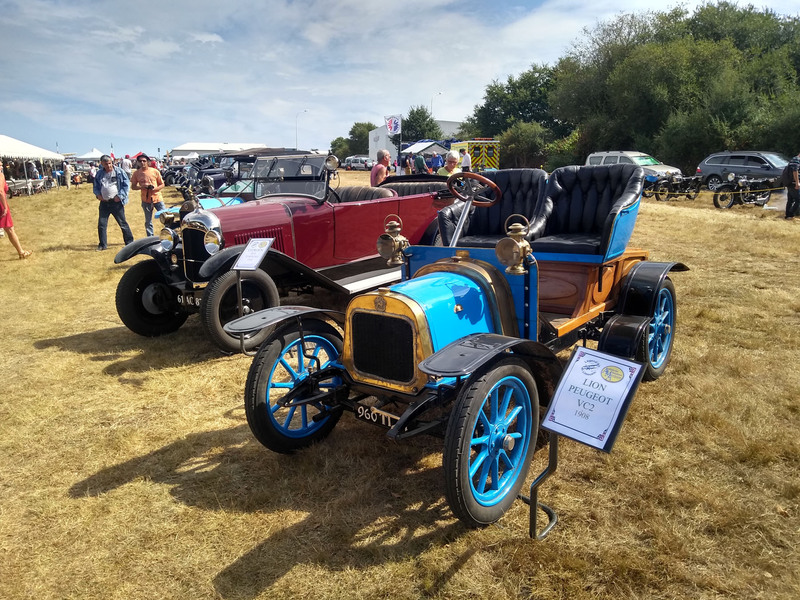 We abandoned our bikes and walked into the event, exploring lines of classic cars and obscure farming equipment, cannons and warfare implements, all manner of motorbikes and of course, small acrobatic planes that were the star of the event. Local flights were available for all who wished it. We checked out the museum displays and small stalls, surprised that the show was not busier. We read posters describing in detail many planes and their uses, and watched a long queue of people take their turn to experience a virtual reality flying experience. 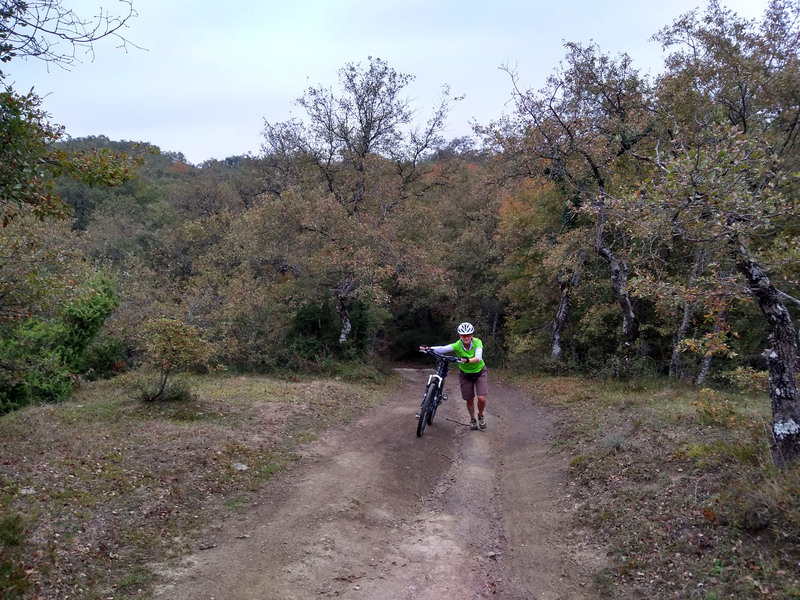 After a thorough look around and a few cheap sugary crêpes to fuel us, we got back on our bikes. We took a different route home, simply for variation and exploratory purposes. We passed through similar scenery and beautiful but hilly woodland paths, before stopping at Saint-Auvent to look in their pretty church. 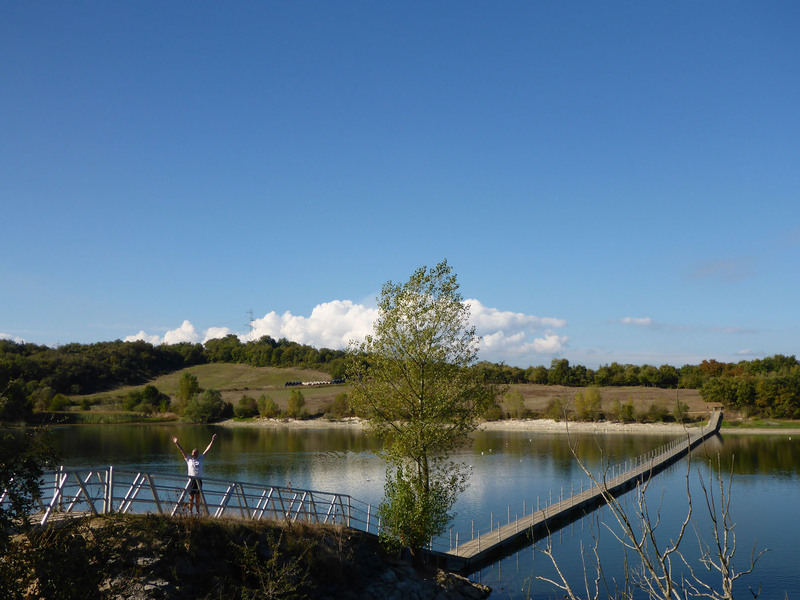 Soon after, we paused at the étang de la Pouge, a long, thin lake that we hoped might have swim potential. There were no signs saying no, but with the presence of fishermen, we feared it was not the best location for swimming. 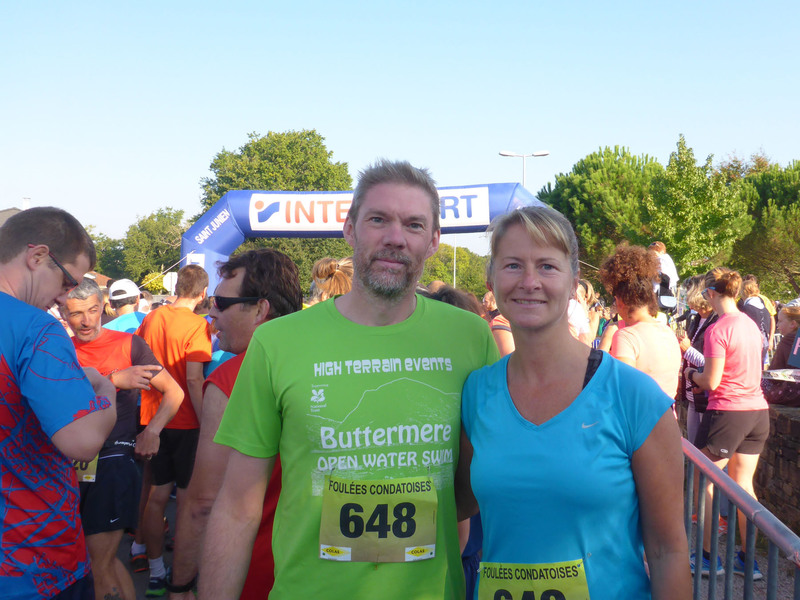 We entered a local 10km race, as something to shake us from our slumber on an otherwise lazy Sunday morning. 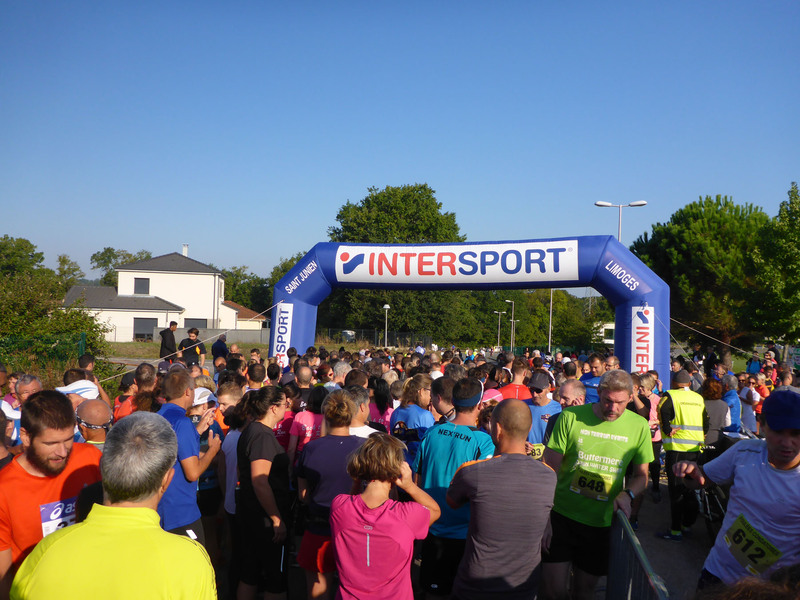 We drove twenty minutes to the village of Condat-sur-Vienne where the race would begin, parking in a nearby Lidl car-park. It was a busy event, popular and bustling, and we felt good to be a small part of such a thriving running community. 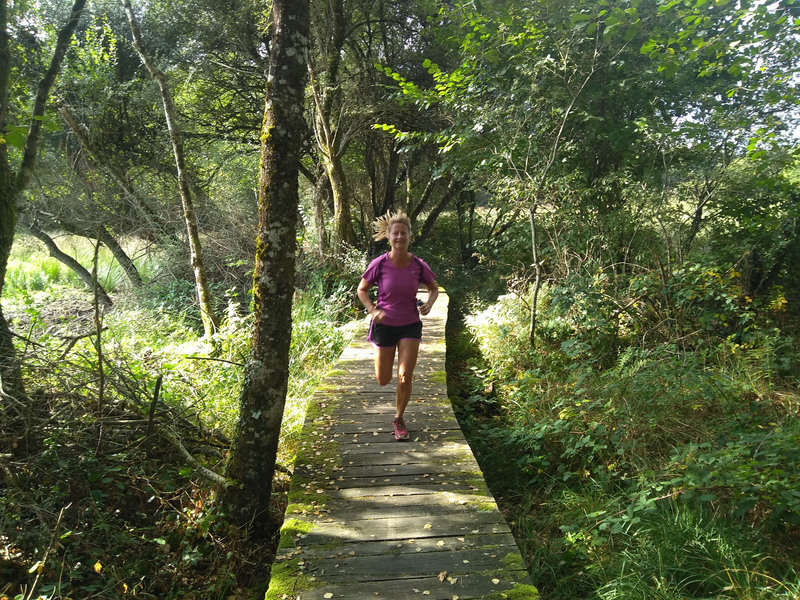 The run took us on closed roads and along gravelled woodland tracks, with overhanging trees providing welcome shade from the morning sun. 52 minutes later we had completed our two laps of the marked 5km loop, having enjoyed the wonderful paths and the cheering crowds. The mayor and other eminent locals presented a wealth of prizes in multiple categories, along with a tombola, using your race number, that gifted bottles of wine. 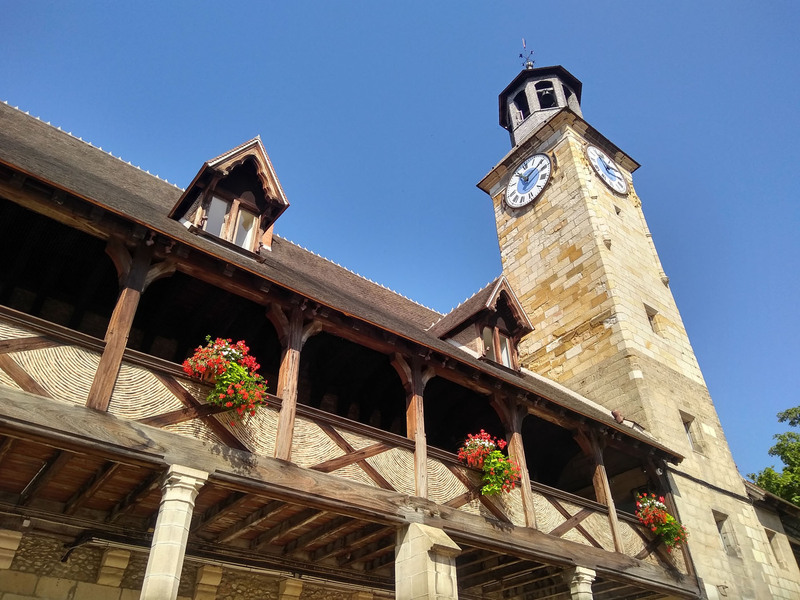 After a further few weeks of house-related works, we decided to treat ourselves with another break, this time a long weekend at Saint Pardoux. We had visited it previously, enjoying the swimming lake and woodland trails, and it was close by, only 40 mins north of us. We reached the comfortable aire, much less busy than on our last visit, and picked out a prime spot to relax into. We knew our way around from before, so it was easy to plan our days here. 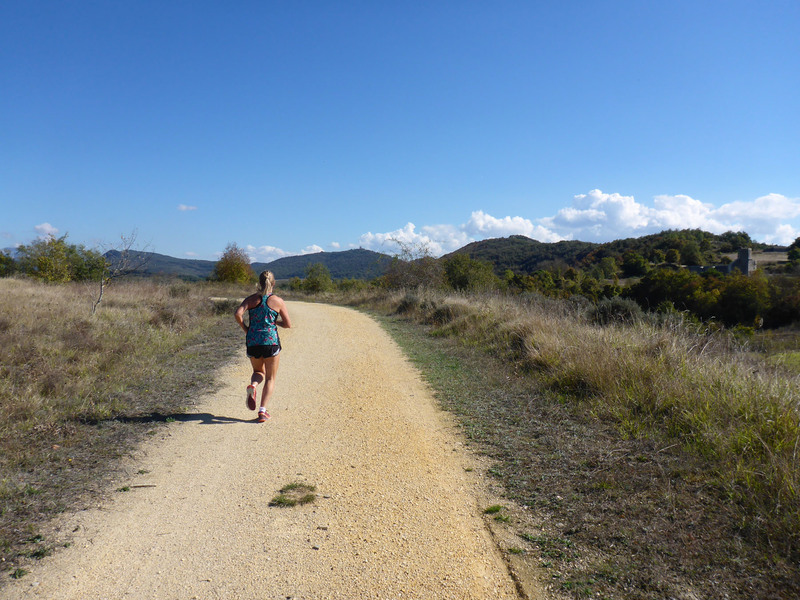 We ran each morning, following the coastal woodland trails on soft paths of tree roots and pine needles. 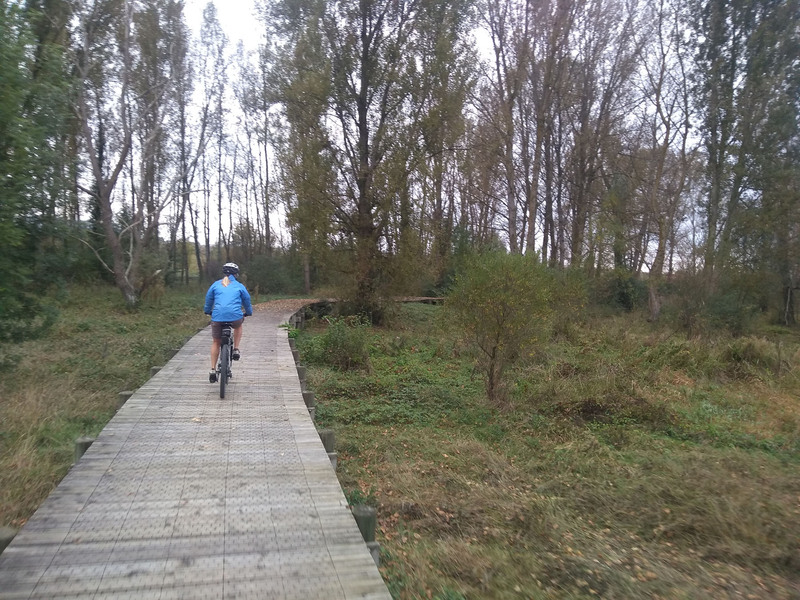 With only one bridge splitting the lake, we faced either a 27km loop of the entire lake, or more local laps around the lake edge and inland backroads. The latter enabled us to create circular routes of 10 to 12km which suited our running level. Post-run, we rewarded ourselves with plenty of beach time, thinking of nothing other than the book in our hand as we soaked up the toasting sun. We had frequent cooling dips into the cloudy water, but little real swimming. 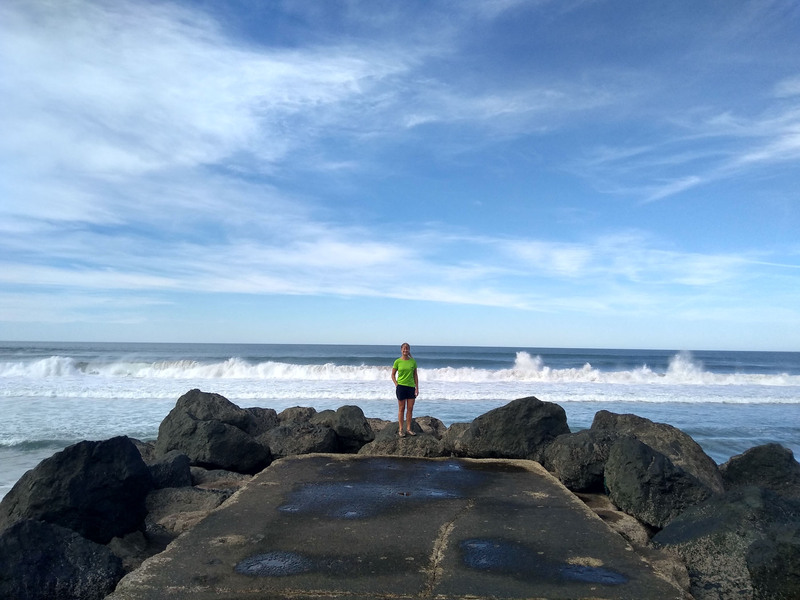 Still feeling a little disappointed with her swimming performance in this summer’s SwimRun event, Nicky tried out various combinations of trainers, floats and neoprene shorts trying to find the optimal, speedy solution for her. From the beach I timed her swims from buoy to buoy to ascertain how each outfit fared. 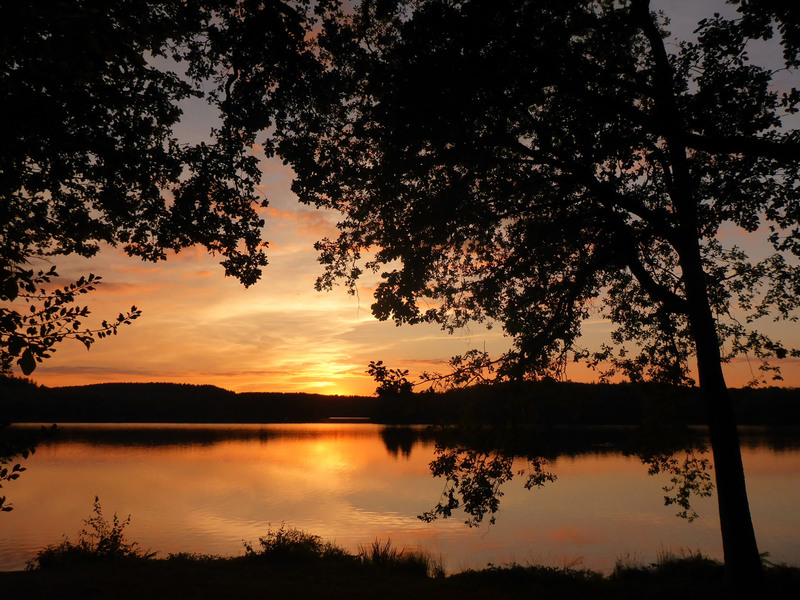 We ventured out for short evening walks, enjoying the burst of deep-red sunsets over the still water and the soothing sounds of calling birds. 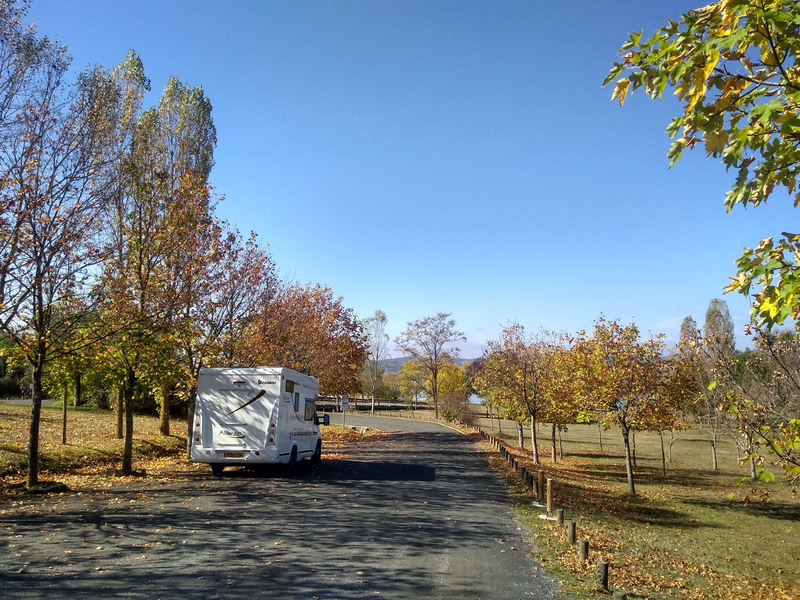 Other motorhomes came and went, milling around busily, as we stayed still, unruffled, the calm centre of our restful universe. Fresh bread, croissants and pastries were available from a well-stocked vending machine behind the tourist building, refilled twice daily, so we had no need to move. 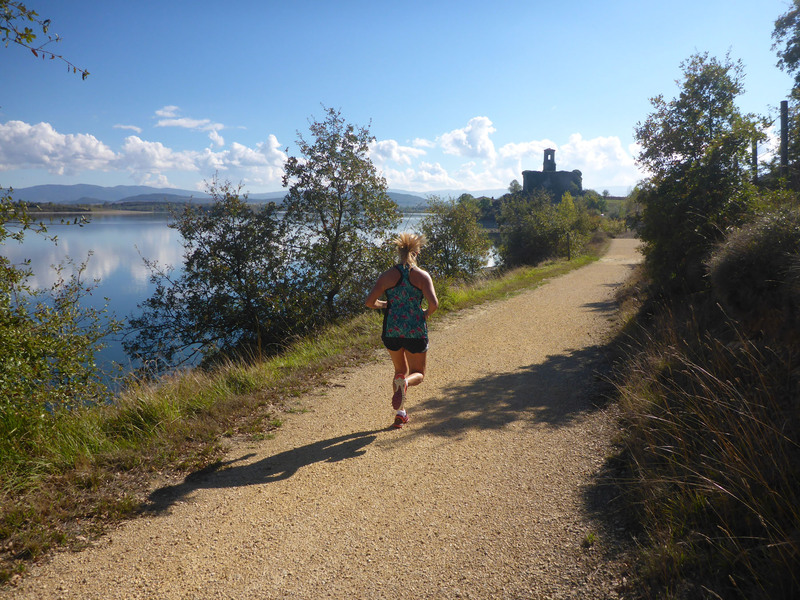 We could have stayed longer, enjoying our running and the fresh, lake-side air. But we decided to return home after two nights and three days, as we found ourselves missing our house, and jobs not yet began were creeping back into our thoughts. We were being taken over by a compulsion to work, to keep busy, to better our nest. We wonder how long the novelty will last, this daily excitement of hard, physical work, so we want to utilise our willingness and drive whilst the determination still exists. Yet these two nights in Benny, our time filled with runs and swims, re-sparked the interest and excitement of the road again. Longer trips will soon be visible on our horizon. 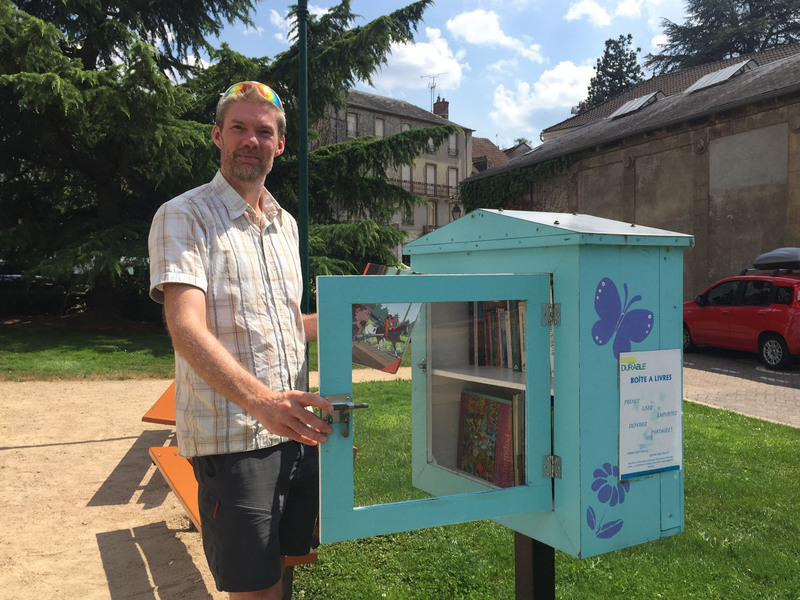 This entry was posted in 2018 Summer Tour, Cycling, Festival, France, Our Travel Journal and tagged aire, beer, culture, Cycling, gardening, lake, lake swim, nature, rebuilding, relaxing, sports, sunset, trail running, wine on Oct 10, 2018 by Aaron Hill. Just two days into her antibiotic schedule, Nicky was feeling much perkier; it was time to move on. We left our rest spot in Abondance and returned back down the mountain. We had to revisit Thonon hospital for some follow-up blood work, as instructed. We parked easily in the empty hospital car-park and waited only a few minutes to see the specialist nurse, blood was extracted and we were away. This visit was more efficient and endurable than the first. Being so close, we decided it would be unforgivable not to have a dip in the glimmering coolness of Lac Léman. There were two aires nearby, so we first headed to the nearest, set right on the lake shore. The road in was very narrow and busy with badly-parked cars and I, squeezing through at around 5mph, clipped wing-mirrors with an abandoned Land Rover. Stopping to check, their mirror was entirely fine, but ours had popped out and the bottom glass shattered. What a week we were having! 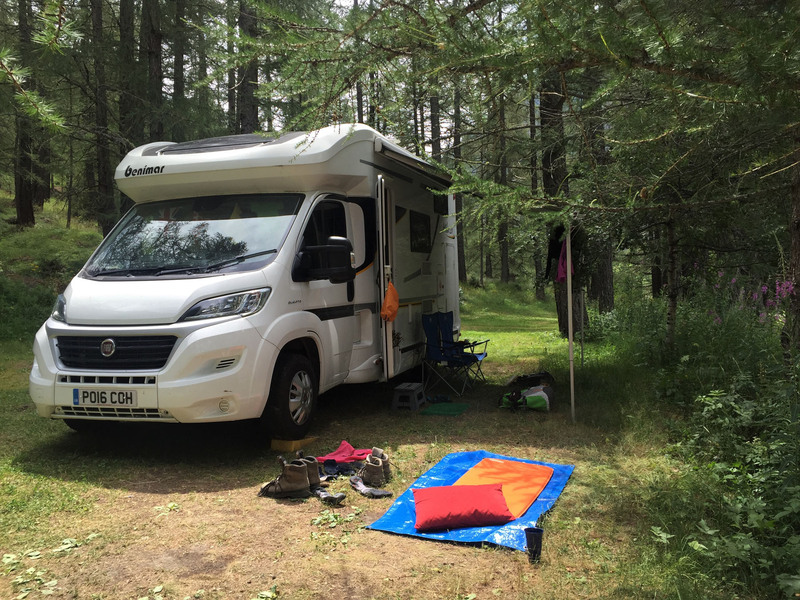 We continued to the tight motorhome parking, a row of three diagonal spaces between the cars on the road, only slightly wider than the spaces surrounding them. We sneaked in and assessed the damage, and with super glue and sellotape managed to fix up the mirror enough to get by for now. 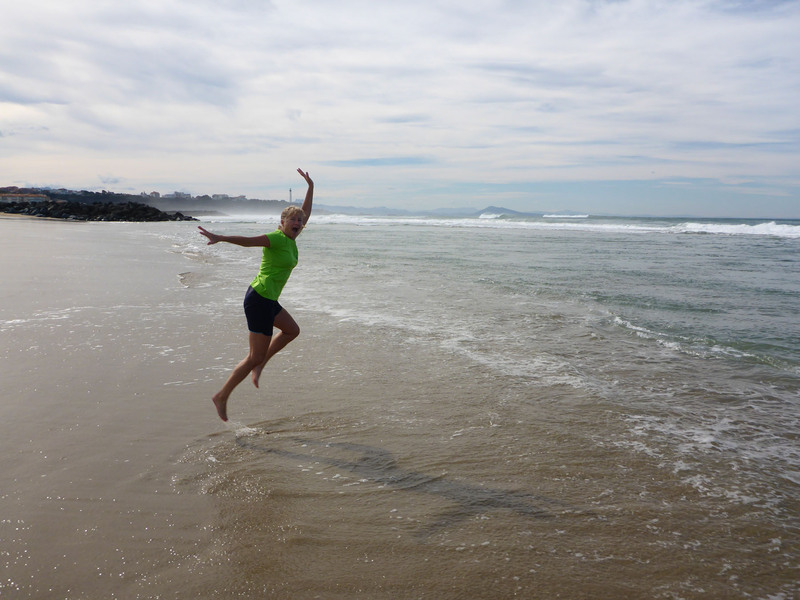 We were metres from the water, so to relieve tension and soothe our minds, we changed and jumped straight in. After a mind-chilling swim and a spot of downtime, we made our way west once more. 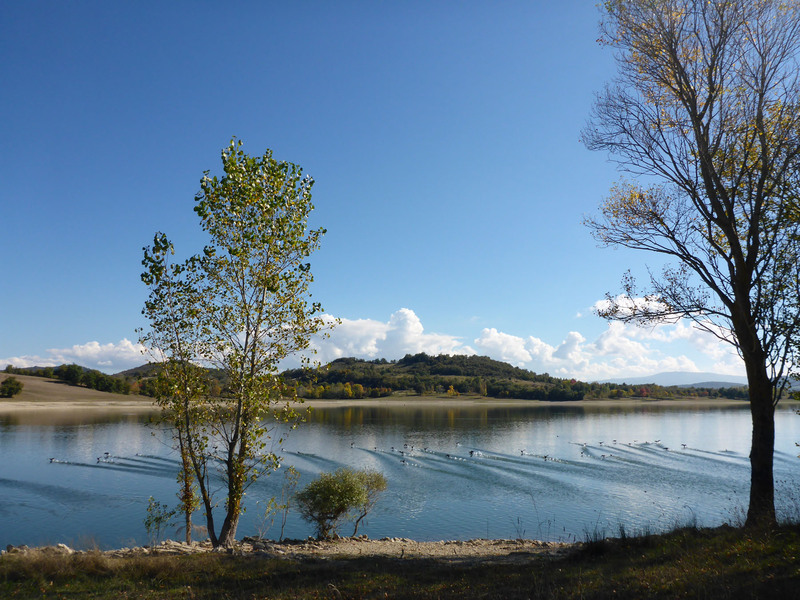 We decided to stop at Lalleyriat, a recently refurbished aire by an almost-completed lake. There was a kid’s play park and a small sandy beach being enjoyed by a few families, although the weather had turned. It was now cloudy and grey, and they soon began packing up with disappointed looks. We walked a slow loop around the small lake then snuggled in for the night as the sudden arrival of heavy rain bombarded our roof. The skies were back to their usual clear and bright when we awoke, so we moved on. 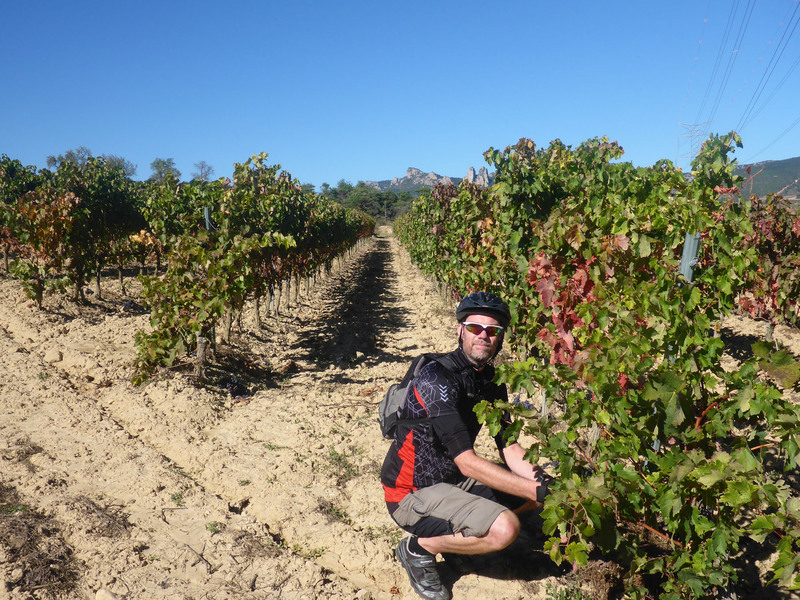 We passed through Nantua and Bourg-en-Bresse to stop by a private vineyard in the small village of Prissé, on the west side of Macon. 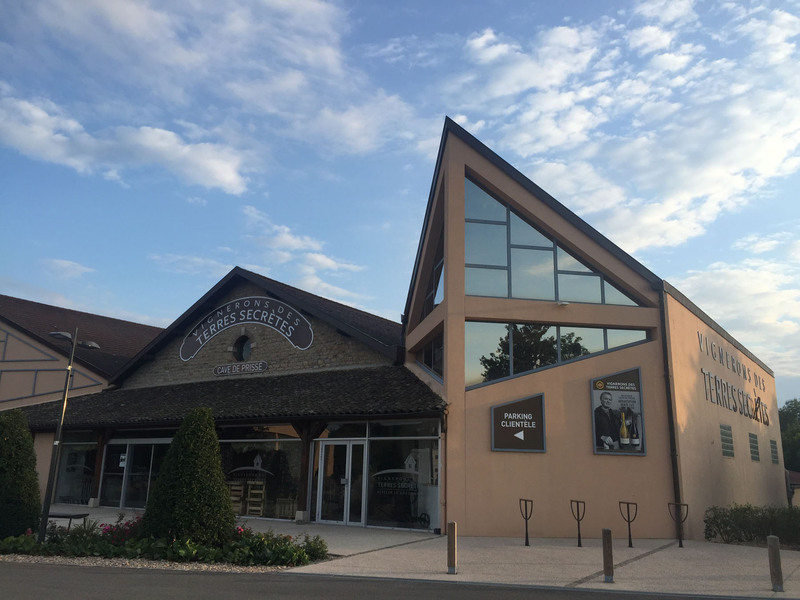 A French Passion site with a wine shop, a perfect base for us. 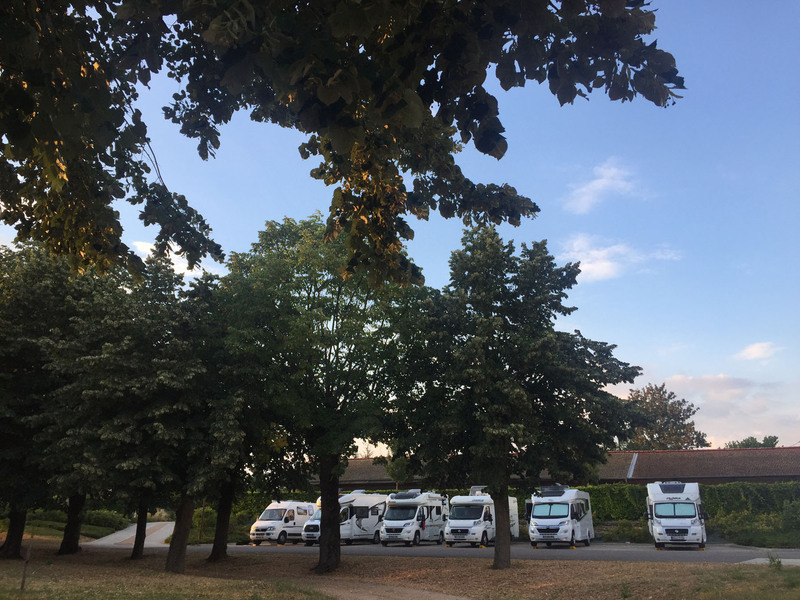 The popular aire, spaciously housing only six vans, was also positioned directly on a voie verte leading into Macon centre, about 9km away. 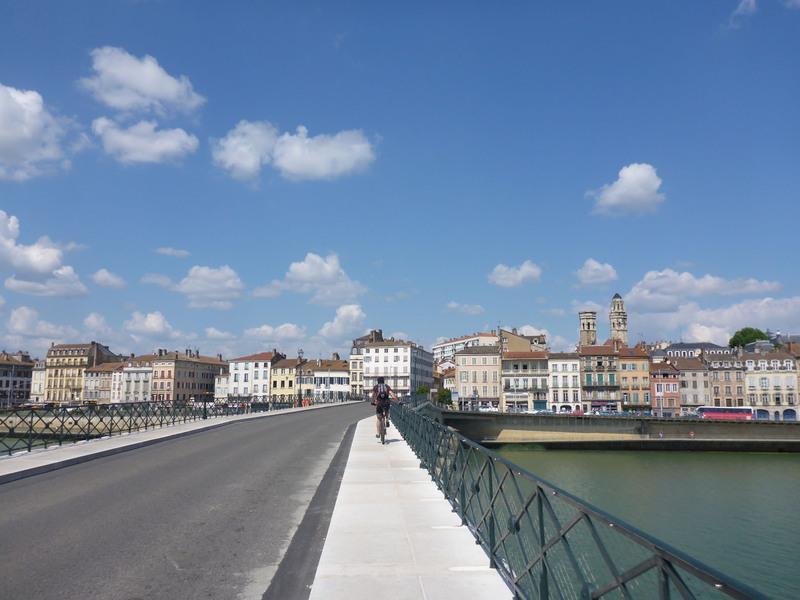 We passed two pleasant nights, and Nicky managed the casual cycle on the voie verte to Macon. We saw hilly fields of ripening vines, green and lush, on the way. Approaching the town we gravitated to the tall church before snaking through the central streets under the shade of brightly coloured umbrellas. 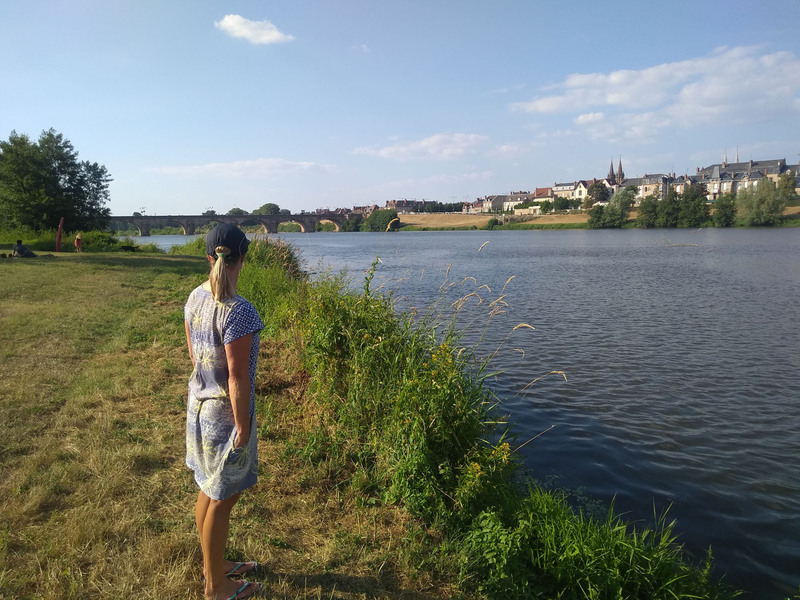 We rolled along the riverfront as far as a municipal swimming pool in a leafy park, then doubled back to cross a stone bridge and view the city frontage from the opposite bank. Macon centre was a lively mix of old and new buildings, dynamic and discoloured, scruffy yet dignified, with the long promenade following the river bank by far the best feature. We reluctantly dragged ourselves away from this comfortable, quiet spot and travelled on, with an extra 10 litres of tasty wine on board from the farm shop. 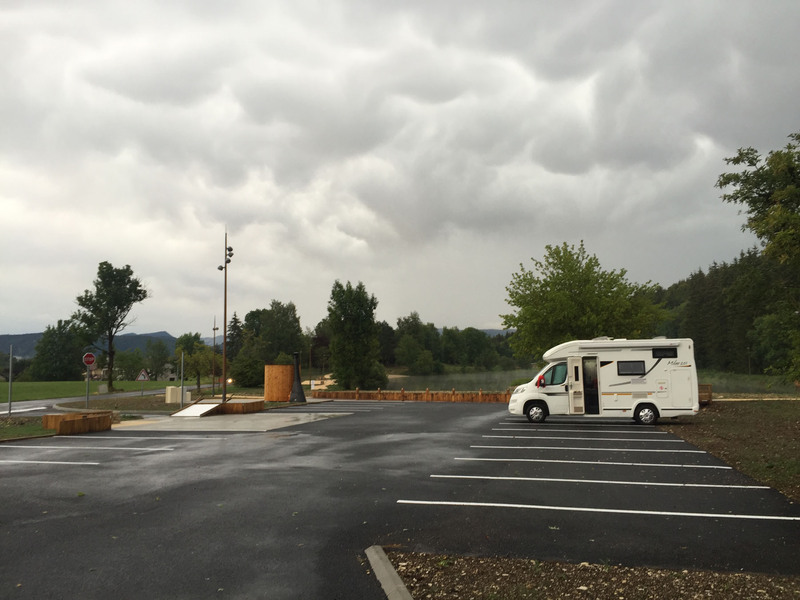 We maintained our westward driving, this time stopping near to Moulins. We entered a huge barriered aire, with the look of an abandoned campsite, with the devastating cost of €0.10/hour. The site felt like it may be an occasional flood plain to allow control of the nearby river. The signs said it was meant for up to 90 vans, but there were 69 vans there the night we arrived (yes, we counted on an evening stroll) and still lots of space for another 60 at least. We walked to examine the tall bunds around the site, set under a high railway bridge spanning the site and running across the river. The rest of the day and evening we sat, enjoying the shade. 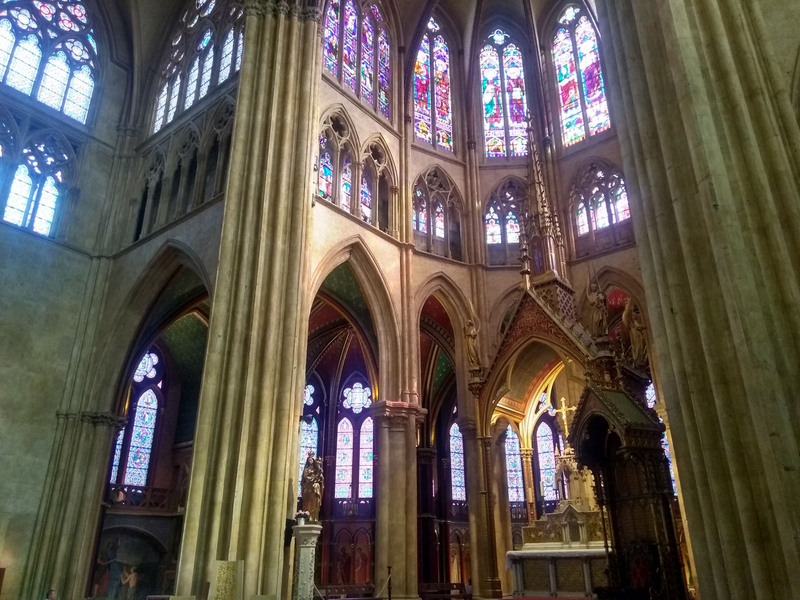 The next day we walked into Moulins under a blistering sun to see both of the twin-towered cathedrals. 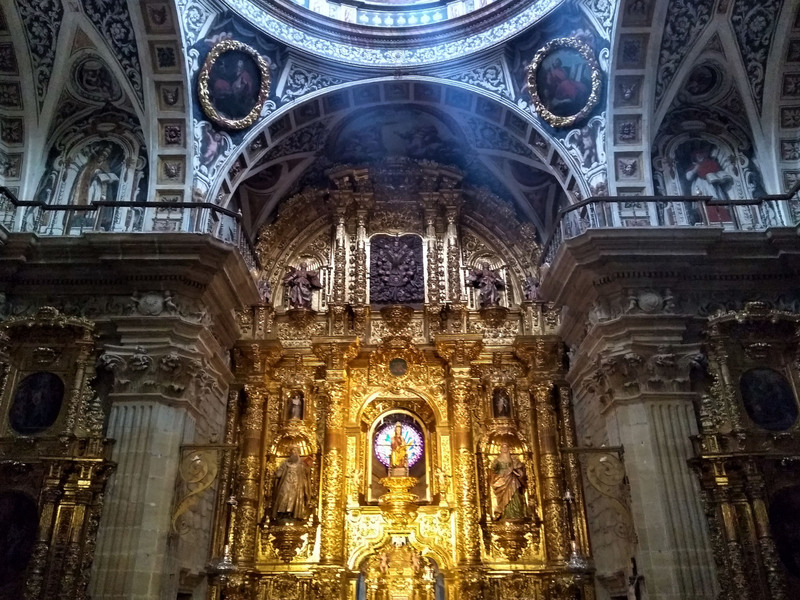 We walked the pretty streets searching out shade, and truly enjoyed the blissful coldness of the cathedral interiors. Everywhere was alight with vibrant flowering borders and hanging baskets. 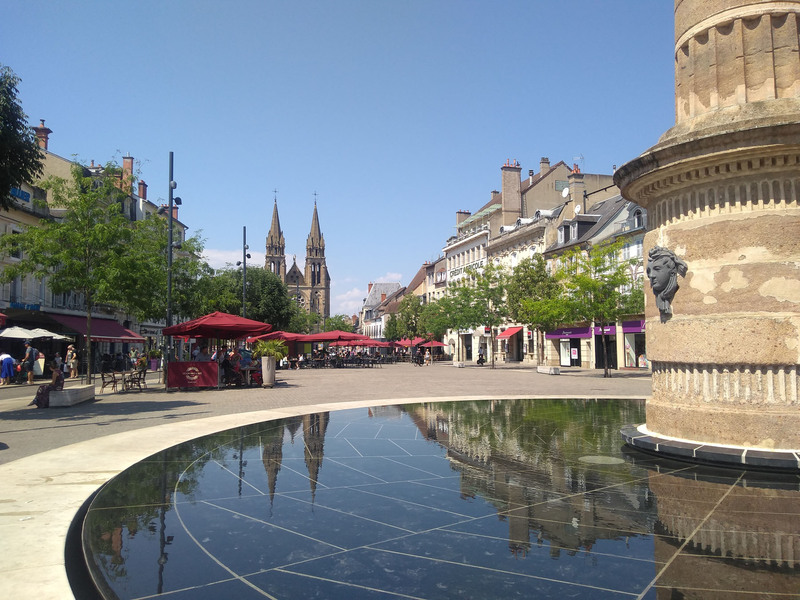 We crossed the main square where street cafés served customers crowded under red umbrellas and excited kids played in the shallow fountain waters. But the efforts of our short walk in such draining heat proved too much for the still-recovering Nicky, so we returned to base and spent a lot of downtime around Benny, sitting and chilling. The welcome rest in such a spacious, shaded aire was exactly what we needed, and definitely worth the €4.30 it eventually cost us when we rolled out two days later. 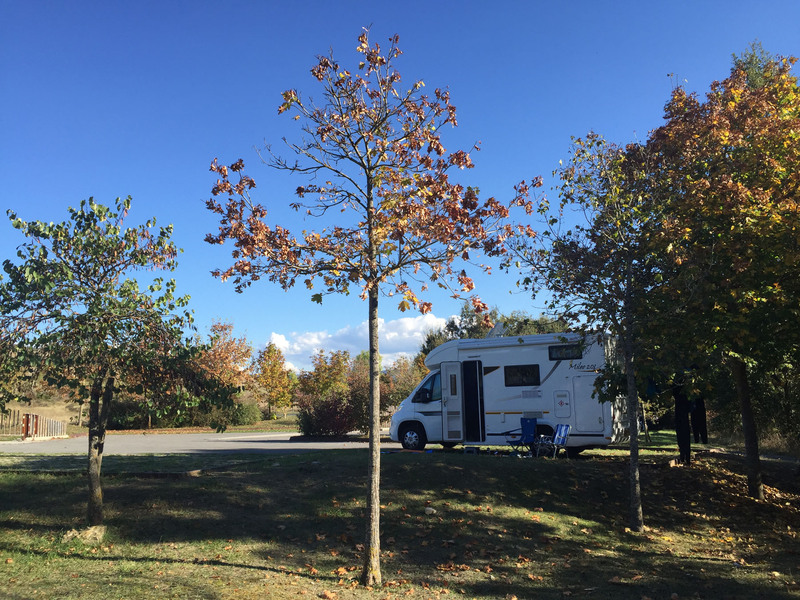 We moved on to Neris-Les-Bains, an €8/night aire with electricity, Wi-Fi, WC, shower and all services, a row of six spaces set just outside the gates to a large campsite. There was nothing available inside the triple-priced campsite that we didn’t have outside, except a three night limit, but we planned to stay only two. It was a short walk into a town that prided itself on keeping busy; a large poster listed all upcoming events – it had five or six listings per day throughout July; art classes, markets, dances, fairs. 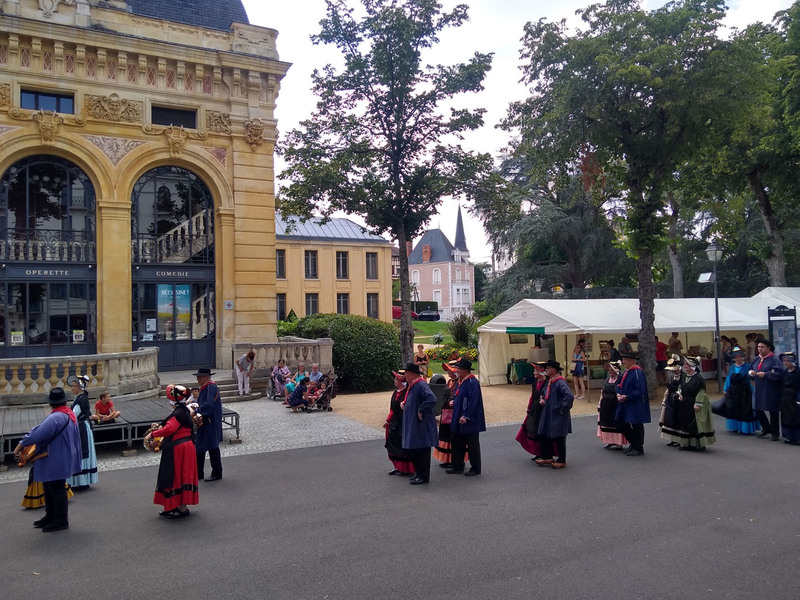 We helped ourselves to a French book from a sharing library box in a small flower garden before watching a display of music and dancing by elderly locals dressed in traditional costume. We passed the baths that feature in the town’s name, still a strong business interest, drawing in crowds. 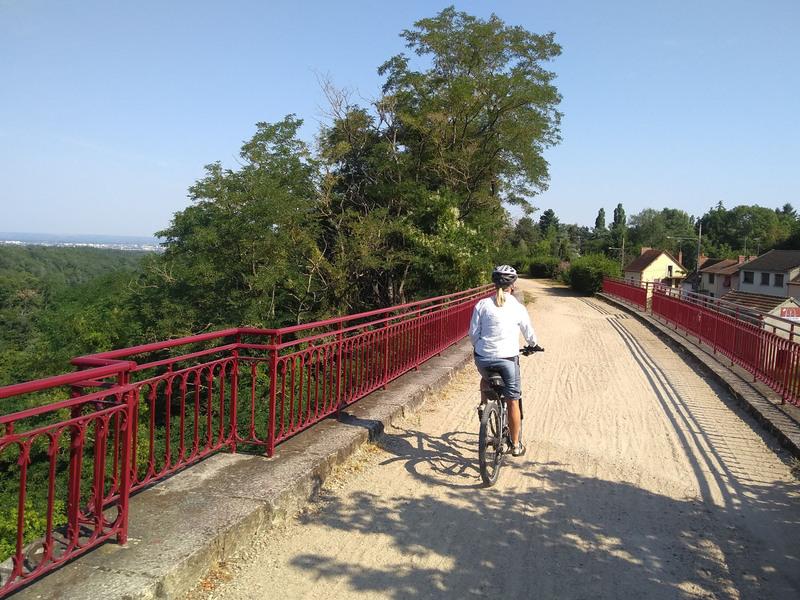 The following morning we cycled to Montluçon along another easy voie verte, gently downhill all the way. 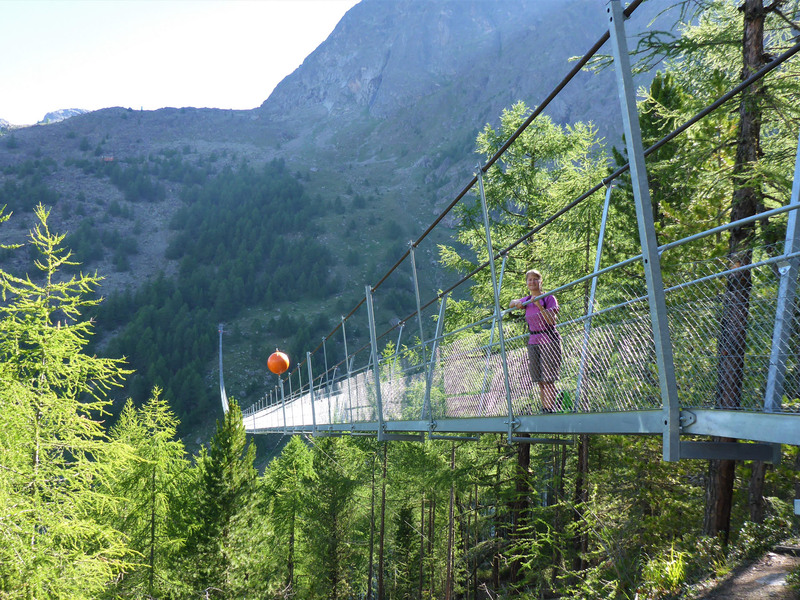 We crossed high bridges spanning deep, lush valleys and rolled through occasional patches of deep shade from tightly-knitted overhanging trees. 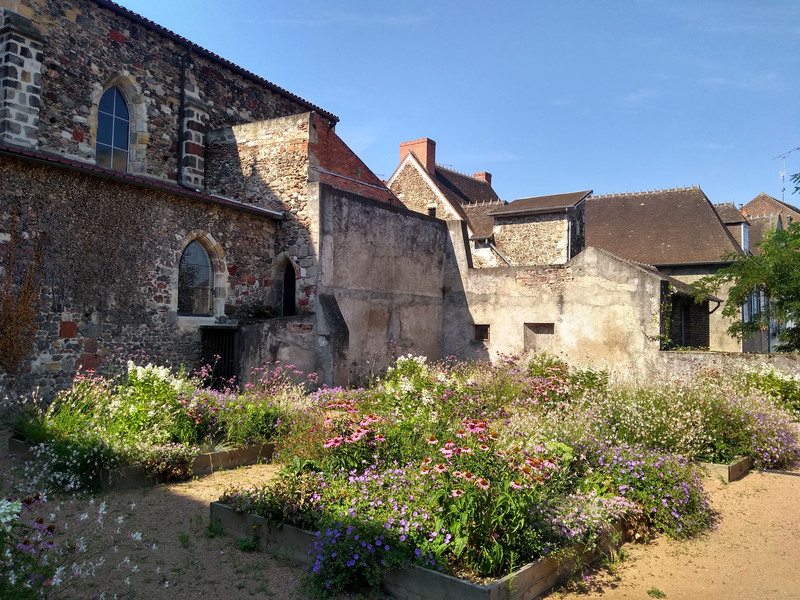 We were soon deposited into the busy centre’s roads at a small park and slowly cycled a loop of the medieval heart, stopping in each small square to look around. We found a modern golden hall beside an old stone church with a beautifully planted walled-garden behind. The streets were neat and clean, with several restaurants making their first efforts to open in expectation of lunchtime crowds. 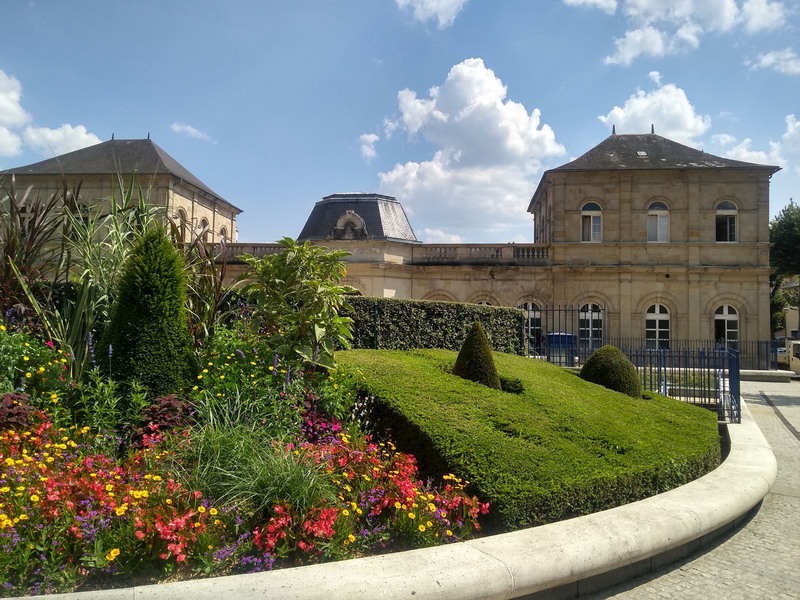 After visiting all the main streets, our eyes turned upwards to take in the domineering central château, its high defensive walls a prominent feature. 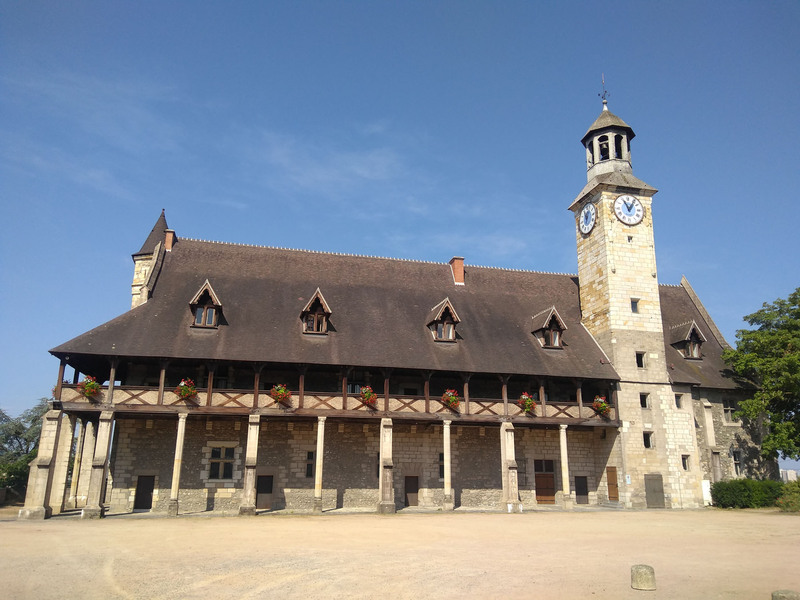 A short, steep ascent led us up to the stone and timber château, the main focal point above the town. It had a decorative clock tower and was hung with well-tended baskets of red flowers. 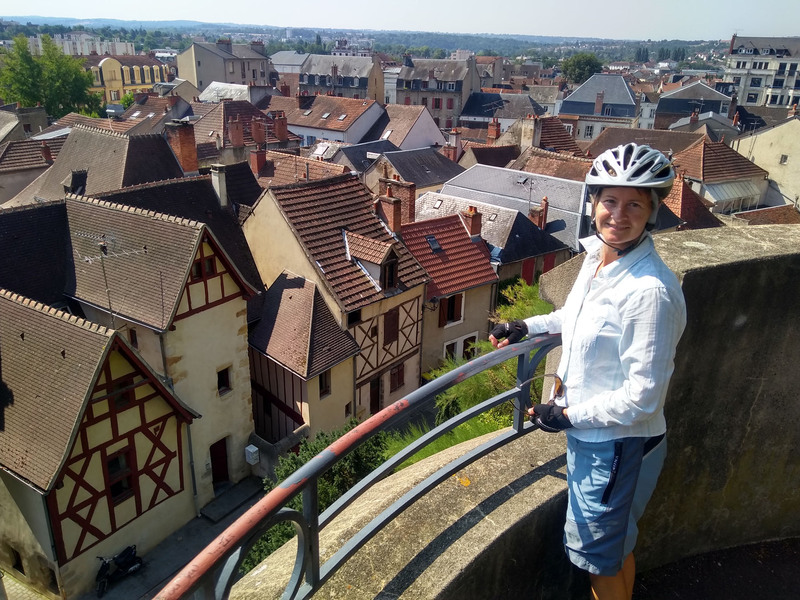 We left our bikes against a tree and walked the perimeter walls, overlooking the entire town. Montluçon looked messy from above; the rear façades of the older central buildings were dirty and grey, their grimy shabbiness contrasting with their immaculately presented fronts. Outside the medieval centre, the town had expanded in too much of a hurry and in all the wrong ways, with dingy industrial units peppered throughout the landscape and garishly-coloured ugly tower blocks blighting the distant horizon. We passed the Hôtel de Ville as we left, enjoying their playful fountains in the empty stone square. 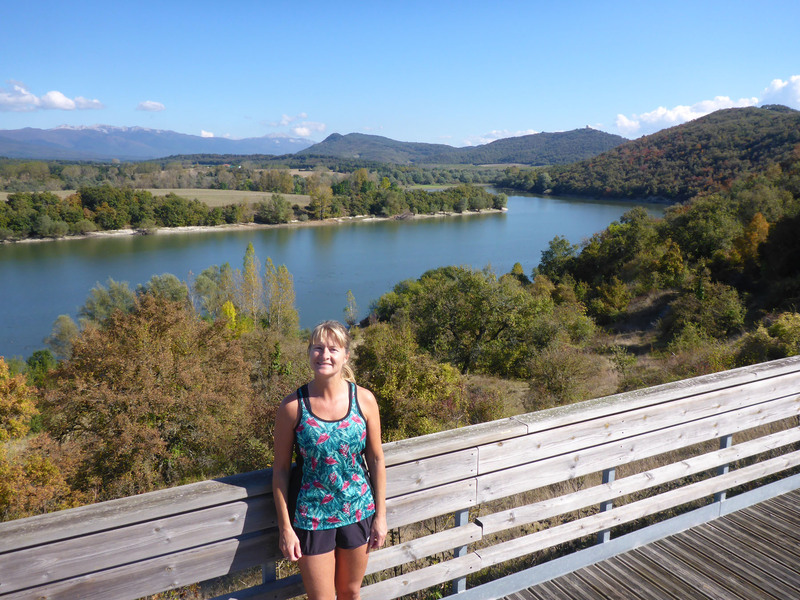 The next morning we serviced and left Neris-Les-Bains, for another short hop towards our new home. 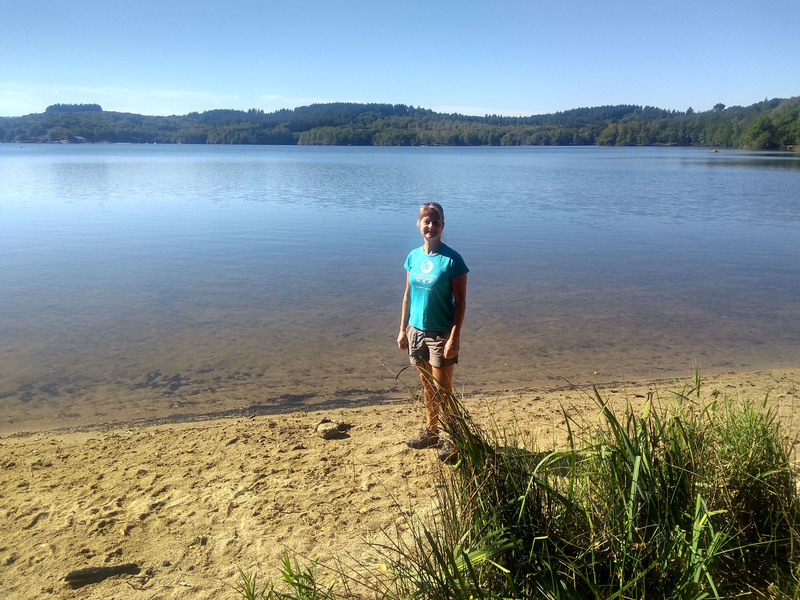 We were now near to Limoges, but still had a long weekend to wait out, and where better to sit out this achingly hot summer weather than at a large swim lake? Shady trees and cooling dips were calling us, and we could not ignore their cries. 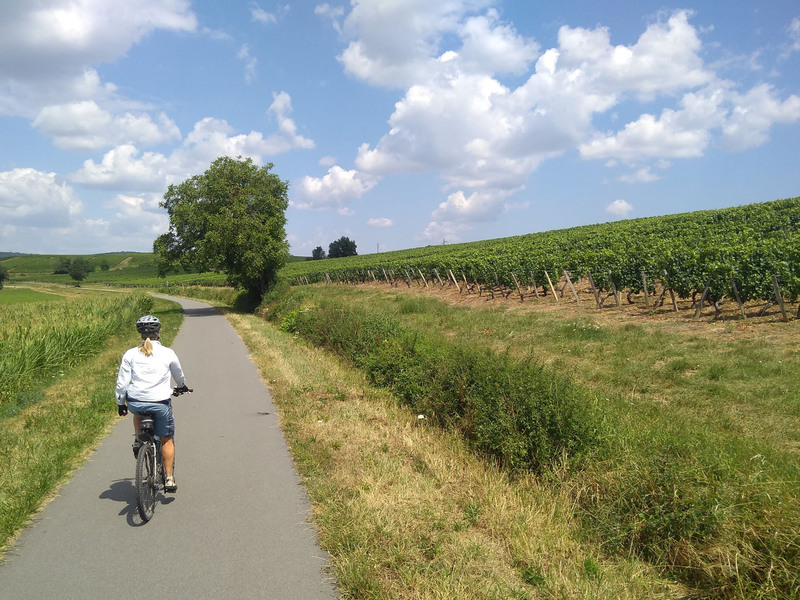 This entry was posted in 2018 Summer Tour, Cycling, France, In France, Our Travel Journal and tagged architecture, city, Cycling, french passion, nature, relaxing, river, travel, vineyard, voie verte, wine on Aug 12, 2018 by Aaron Hill. After the successful completion of the TMB hike, we rested up at Le Grand Champ for a further two rainy nights. We tasked ourselves with the necessary jobs of laundry, photo-sorting and rest. But we also had an eye towards our next mini-adventure, so were cooking up a few ideas. After some deliberation, Switzerland was put on our agenda. We left on a quiet Sunday morning, stocked up in a busy SuperU then headed east towards Switzerland. 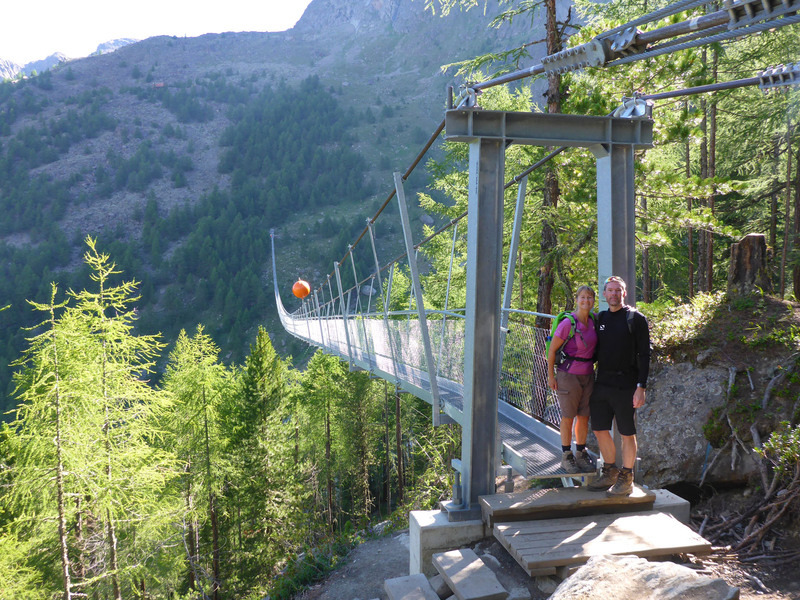 We drove back through Chamonix, Argentière and Trient, spotting many places we had recently walked, before climbing up towards Martigny. A few kilometres and many hairpins later, we were duly summoned into Switzerland with a bored look and a casual swipe of the arm at the nominal border point. Tall stone terraces bursting with vines and soft fruits, predominantly apricots, lined the steep valley sides. We dropped drastically to the valley floor and on long straight roads made easy progress. This part of Switzerland was more business than pleasure. Dominated by light-industrial sheds and strips of garishly-coloured store fronts heavy with parking areas accessed by over-wide roads, it looked much more American than European. 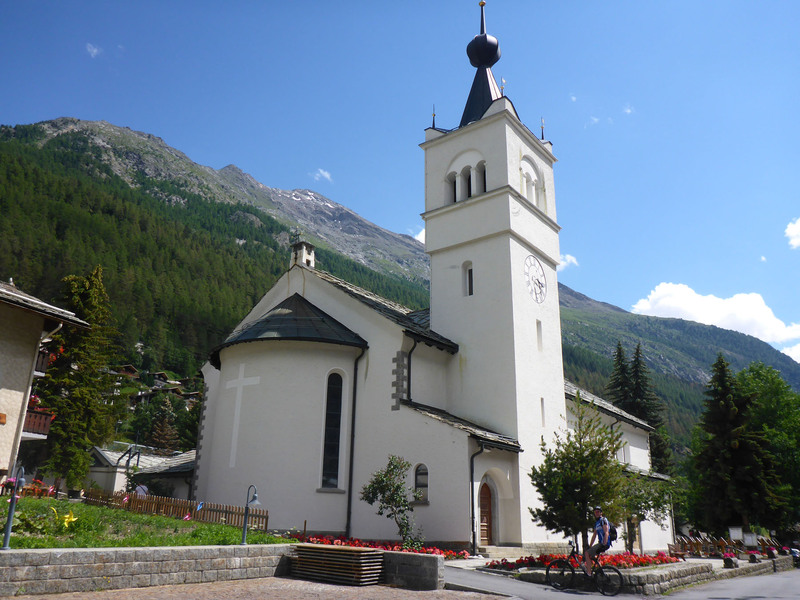 We turned off towards Zermatt, heading south through a series of villages on the only road into the valley. 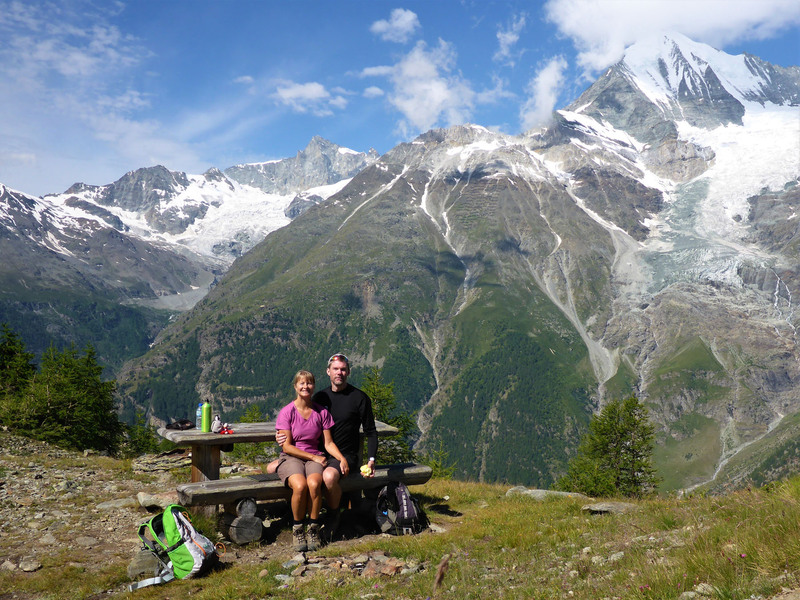 We considered stopping in a cheaper aire in Täsch, nearer to Zermatt, but on inspection it was only the back corner of a car-park, behind a garage on a busy section of road, so we passed on it and doubled back to Campsite Attermenzen to overnight. The site was an open field, so siting was entirely at your own discretion. We picked out a quiet spot on a small plateau behind the main field and set up a cosy camp. 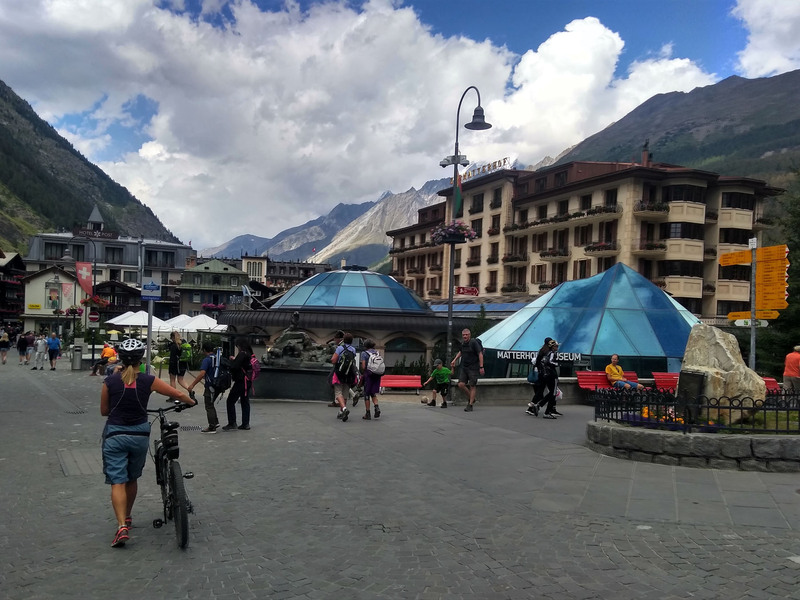 As it was only 2.30pm we had a decent portion of day left, so made the decision to quickly grab our bikes out of the garage and go see Zermatt immediately. 20 mins later we were organised and away, assuming the 9km route there would be a simple jolly along a cycle-path by the river. 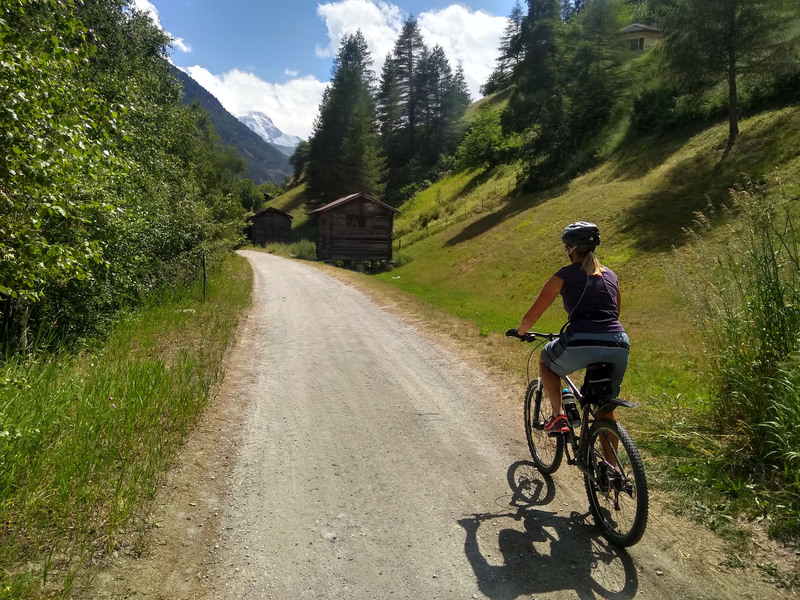 It started well, in bright sunshine, rolling through the centre of Täsch, but soon after the track crossed the railway and rose steeply up through the forests on the opposite slope. We faced a steep, difficult and technical ascent, a narrow dirt trail with gnarly roots, large boulders and overhanging nettles. 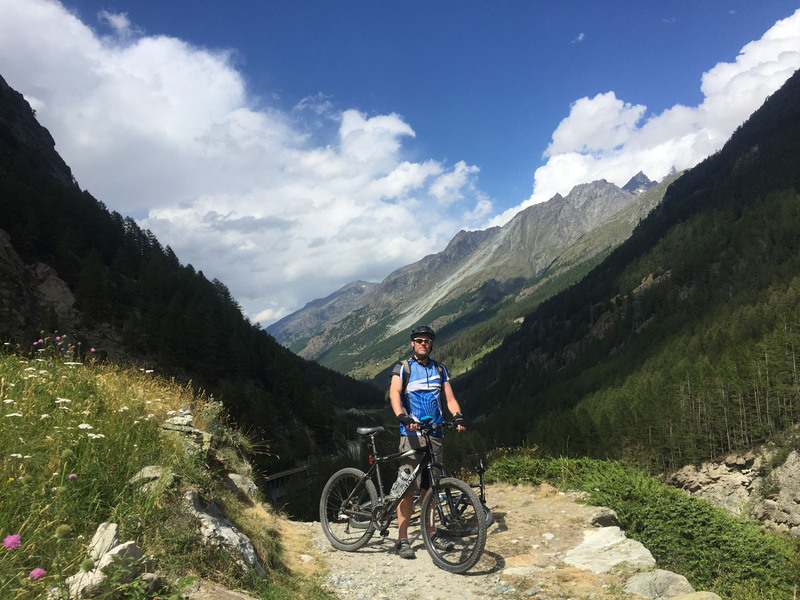 Whilst we thought we had had a decent, active summer, filled with swimming, running and hiking, we soon found our fitness for this type of off-road cycling was sadly lacking. 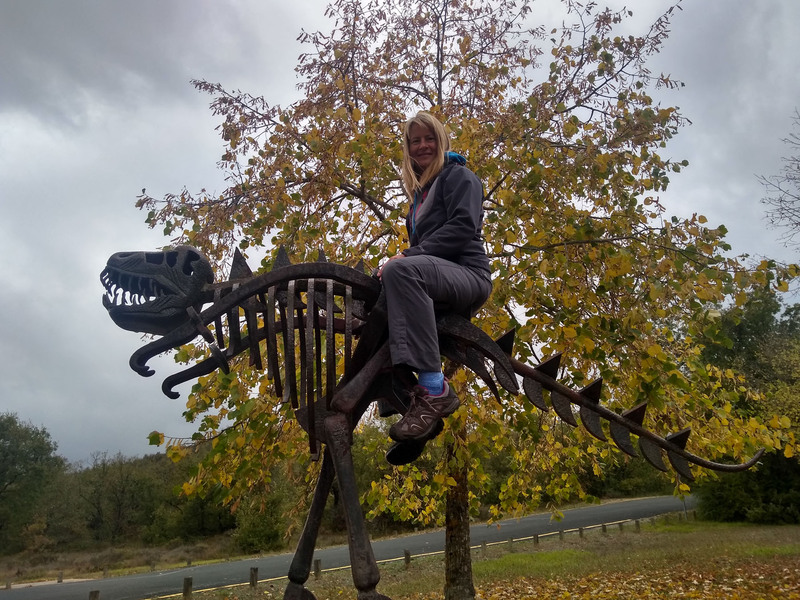 With lungs bursting and legs screaming for mercy, we had to dismount and walk portions of the trail on several occasions, decrying our inability to get up the track on our bikes. We had underestimated the cycle, judging it by the short distance and not thinking of the height differential. 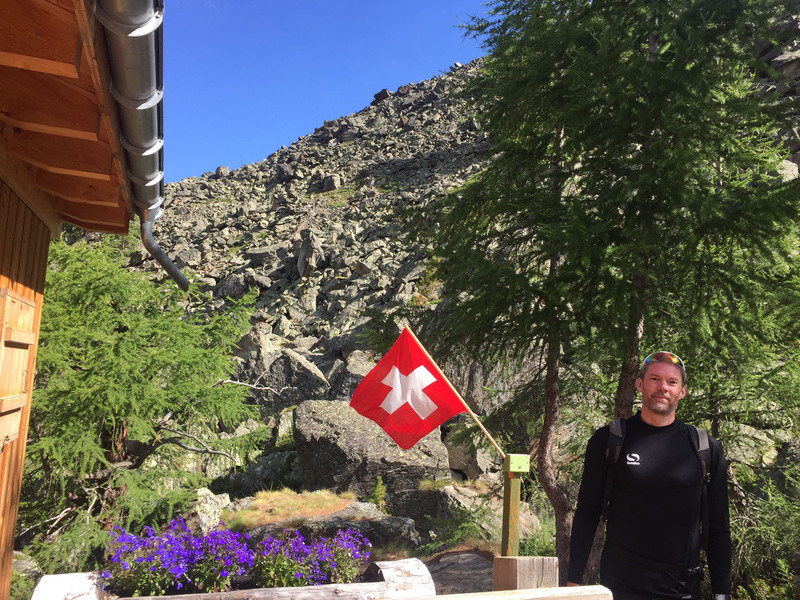 But we made it into Zermatt eventually. 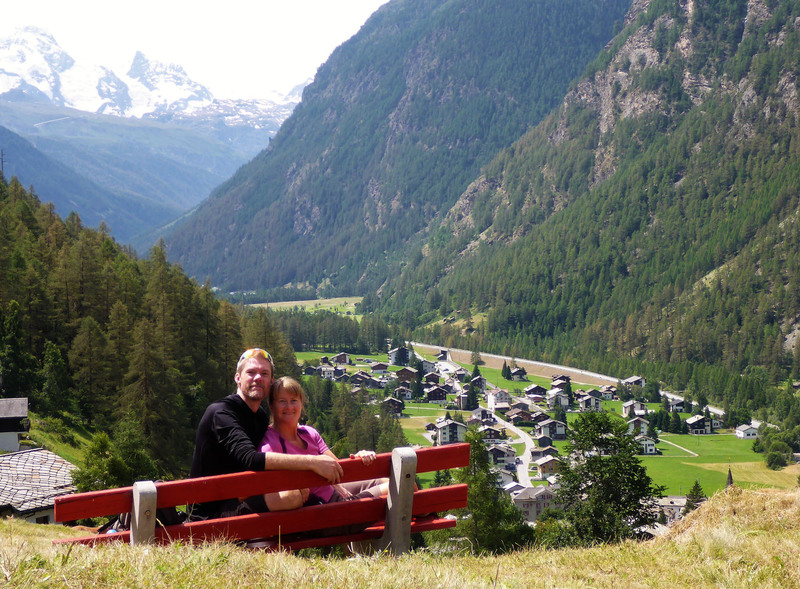 Our first impressions of Zermatt were not great. We had visualised a cutesy ski-resort, wonderfully car-free, all stone, timber and glass, in a comforting cauldron of snow-speckled mountains. Instead we entered by a rough, debris-strewn building site, both sides of the road lined with dirty piles of stones, discarded bent materials and desolate-looking buildings. 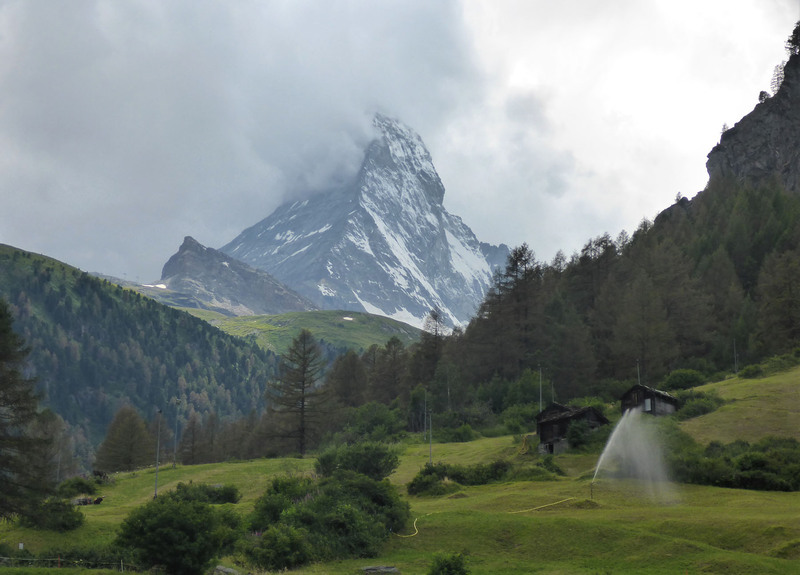 It was a disturbing and rather grim first impression, but we were very soon distracted from it all by our first sighting of the incredibly imposing Matterhorn, standing tall behind fast-moving clouds. 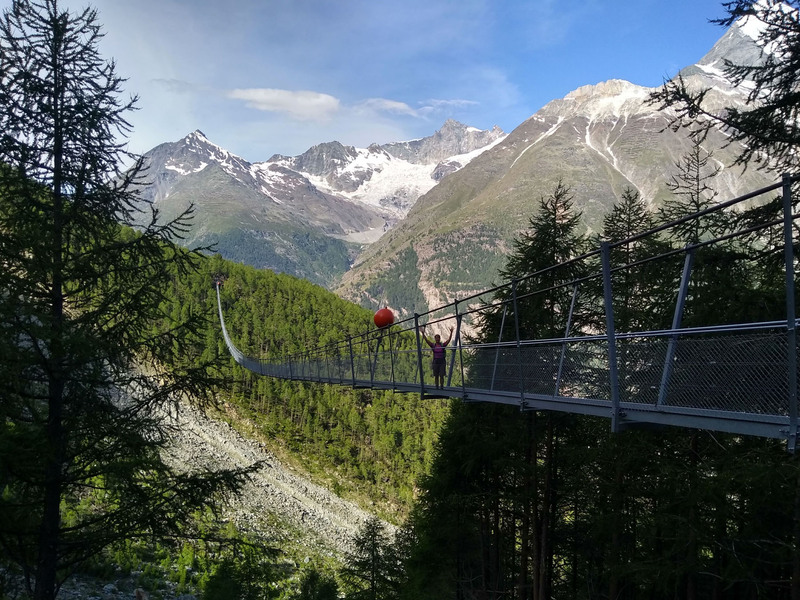 We followed the river and cycled straight through to the southern edge of town for a closer look, stopping near an Activity Park to take in views of the iconic mountain. Yet even here the parks were lined with red builder’s tape, degrading the view. 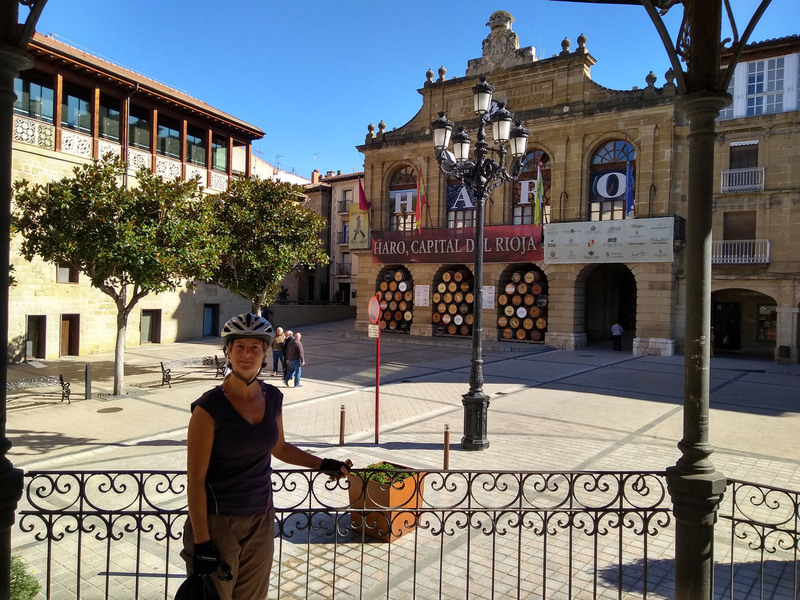 We pushed our bikes through the glitzy, kitschy, touristy centre, the busy streets lined with top-end branded stores and expensive hotels. 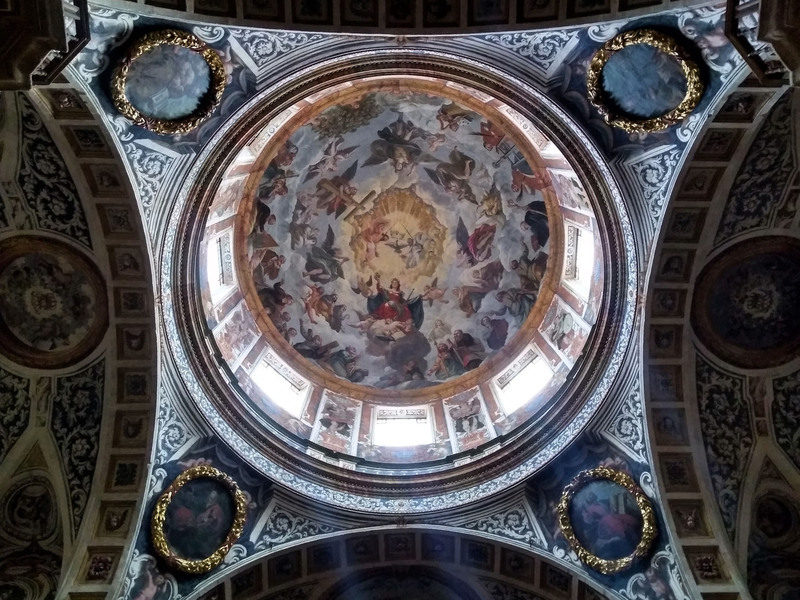 We passed neat churches, almost apologetically nestled into tiny corners, their importance lessened in the face of the new, dominant religion of commerce. Visitors mingled with quirky locals in national dress, popping in and out of cafés and souvenir stores selling the usual T-shirts and tea towels. We heard mostly German being spoken, but smatterings of French, English, Spanish and Japanese completed the cultural melting pot. At one point a herd of long-haired goats were driven through the streets by young teenagers, dodging the constantly buzzing electric hotel taxis, looking more like a scene from Nepal than Switzerland. 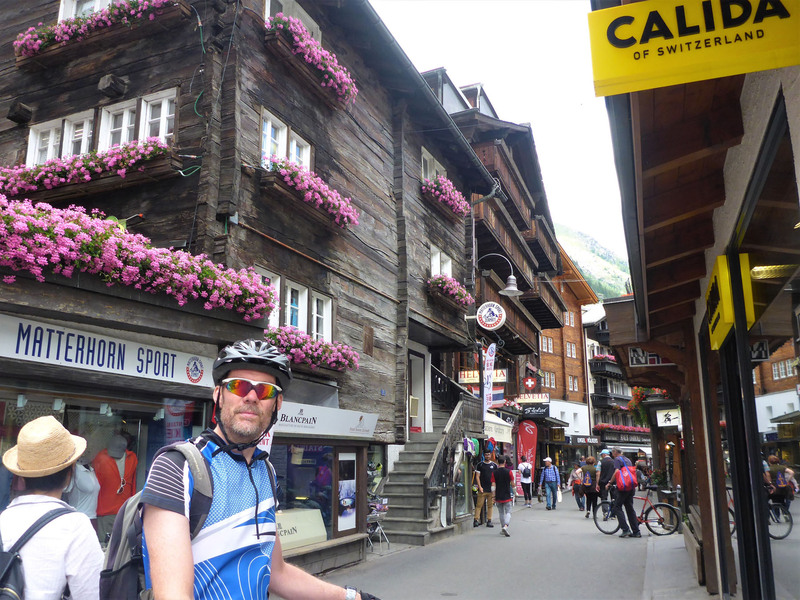 We cycled on, passing yet more hotels and shops in traditional timber and stone, with an ever-present snowy mountain backdrop framing each view. We’d been lucky with the weather, as the forecast had suggested thunderstorms in the afternoon. But grey clouds were now gathering overhead and the air changed; rain was brewing. We decided to stick to the road going back, and found it a fantastically long, sweeping downhill for most of the way. We reached Täsch in minutes, flowing at over 50km/hr, definitely enjoying this direction more. Large, slow drops of rain plopped on us and the smooth road surface as we passed through the town, threatening much more. We pushed on to reach our campsite with only moments to spare before the main deluge finally arrived, with us safely back under cover. 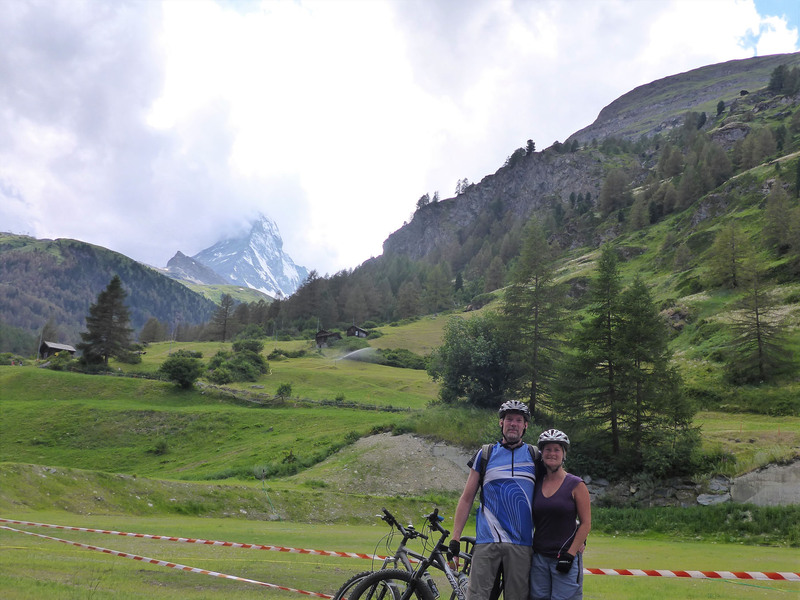 We packed away our bikes, made tea and chilled for the rest of the evening, feeling glad we had decided to make the effort to quickly visit Zermatt. We set an early alarm, had a quick breakfast and got our boots on before 8am, as the forecast was for more storms. 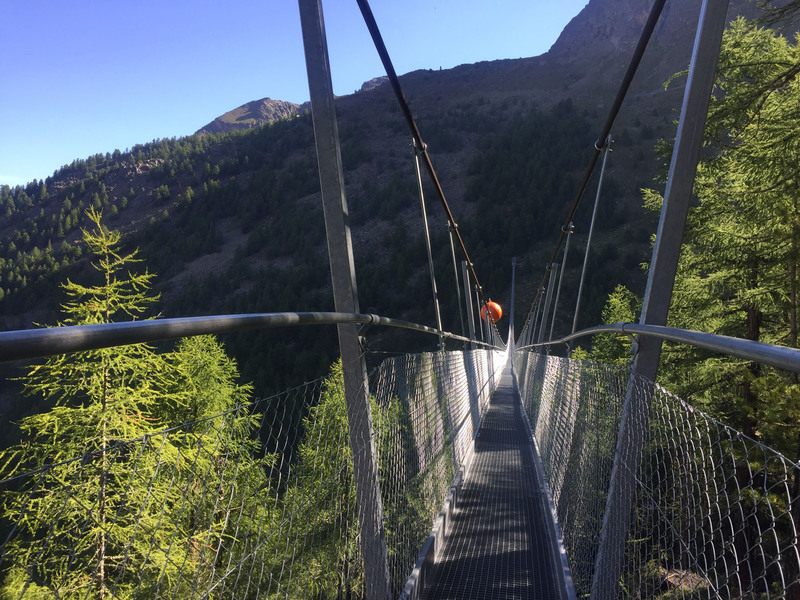 We wanted to complete a circular hike, from the nearby village of Randa, and to visit and cross what was reported to be the longest pedestrian suspension bridge in the world. It was still chilly when we left, the sun slow in rising and not yet having warmed the air. 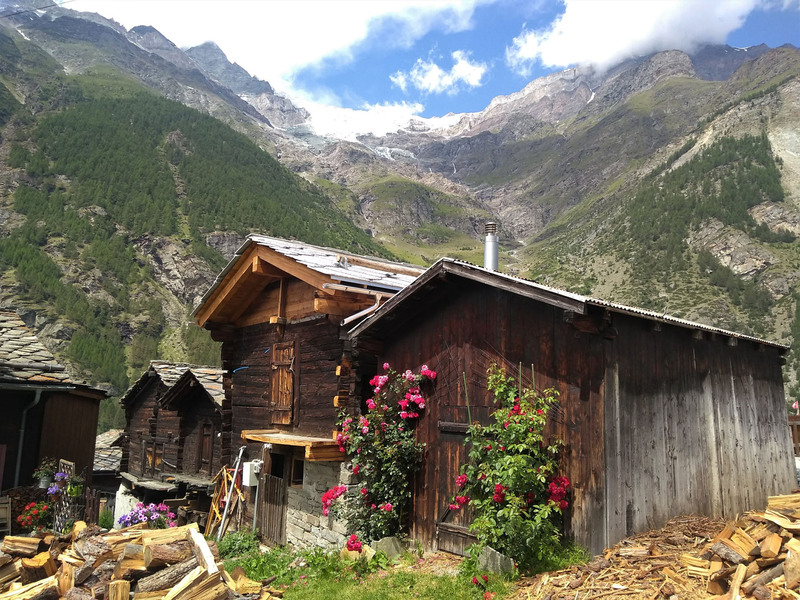 We first passed through the traditional timber buildings of Randa, enjoying the colourful vegetable patches and hanging baskets decorating the houses. 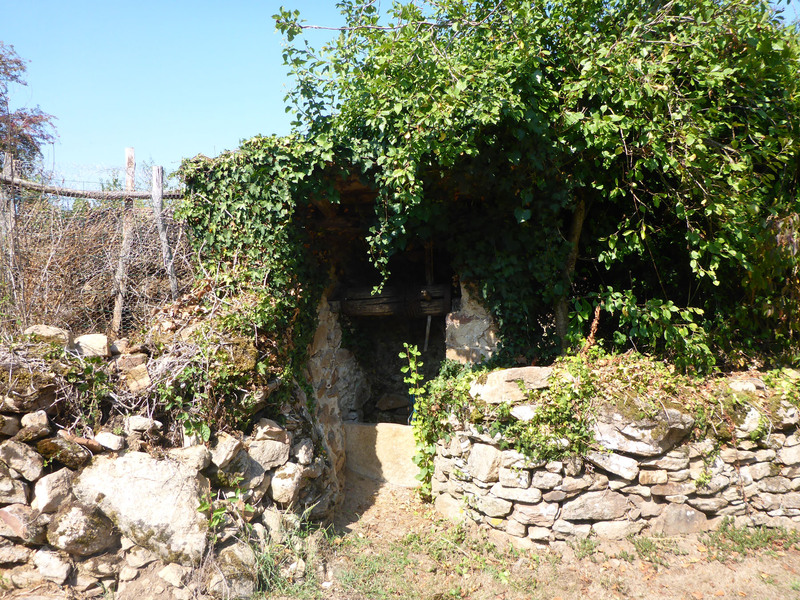 We filled our water bottles from a spring in the village then started our ascent via a narrow street between ancient timber hay barns. We rose quickly on steep, rooted paths through the woodland, our legs dealing easily with the gradient after the gruelling miles of the TMB. 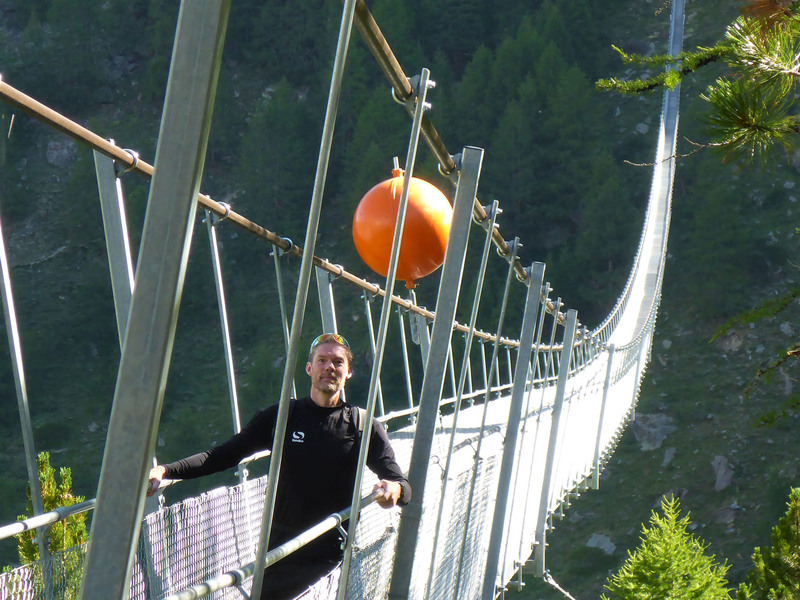 We were all alone when we reached the 500m long Charles Kuonen Hängbrücke, the suspension bridge, so we had the fortunate opportunity to play around and take a few photos and videos. 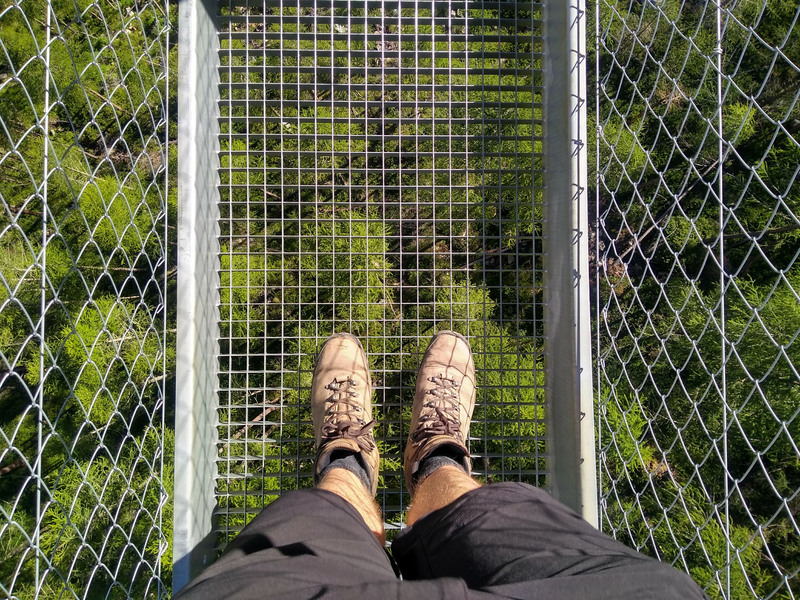 We then crossed over, apprehensive at one short portion that looked only loosely connected and rather shaky, but made it safely across. From there we walked further up the mountain to the Europahütte refuge at 2220m, guarded by a huge resting black dog that eyed us suspiciously. The view from their verandah was quite spectacular, but we didn’t linger. 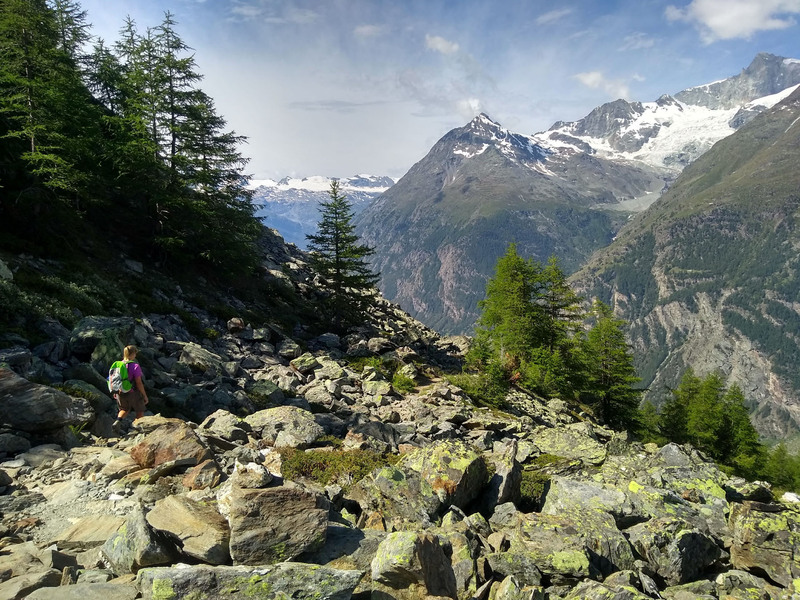 Instead we climbed a further few hundred metres through a boulder field to reach a classic picnic spot with an unbeatable view of three separate glaciers. We sat a while, eating apples and soaking up the view with only the sound of calling birds to distract us. 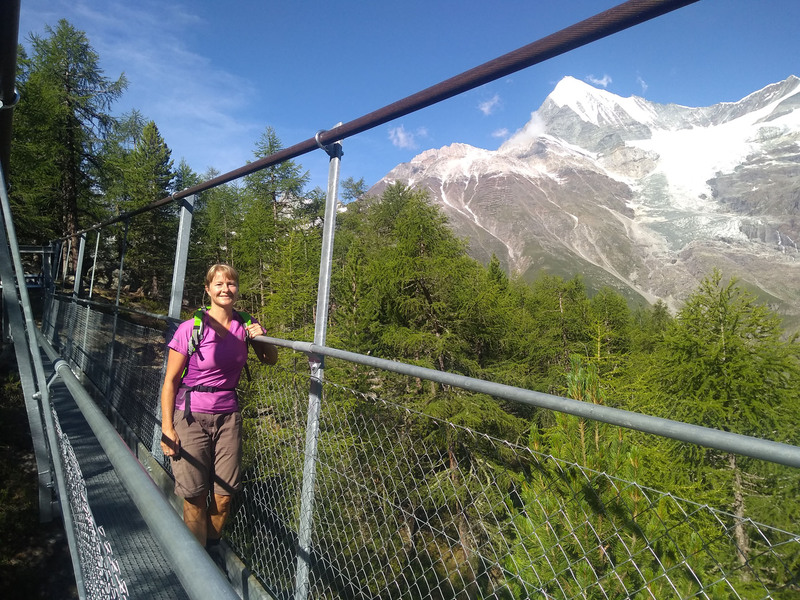 There was the possibility of continuing around the mountain and returning to Randa by a different route, but instead we retraced our steps past the Europahütte and down to the suspension bridge, this time passing under the northern end and dropping quickly downwards. Another steep woodland path led us down past a few groups of walkers now struggling upwards, until eventually levelling out in rolling grassy meadows back near to Randa. 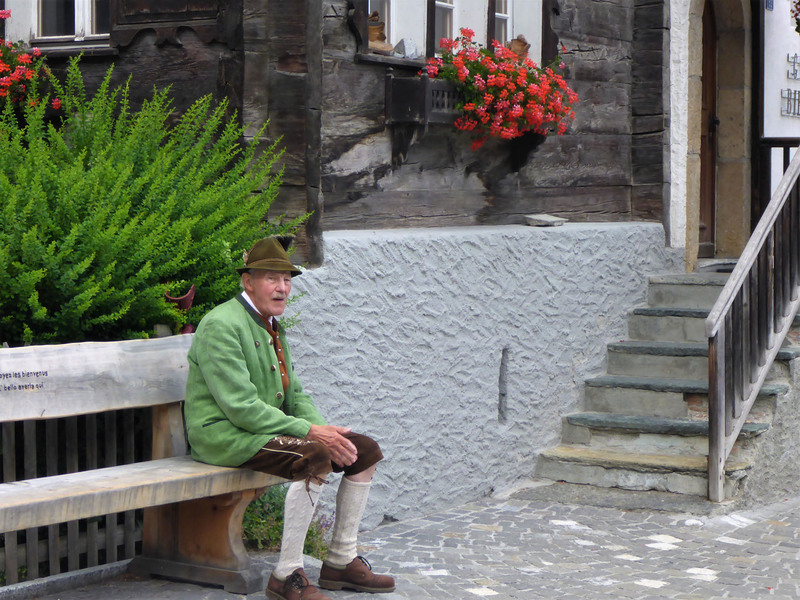 We paused a while on a lonely red bench to eat sandwiches and take in the overview of the village. 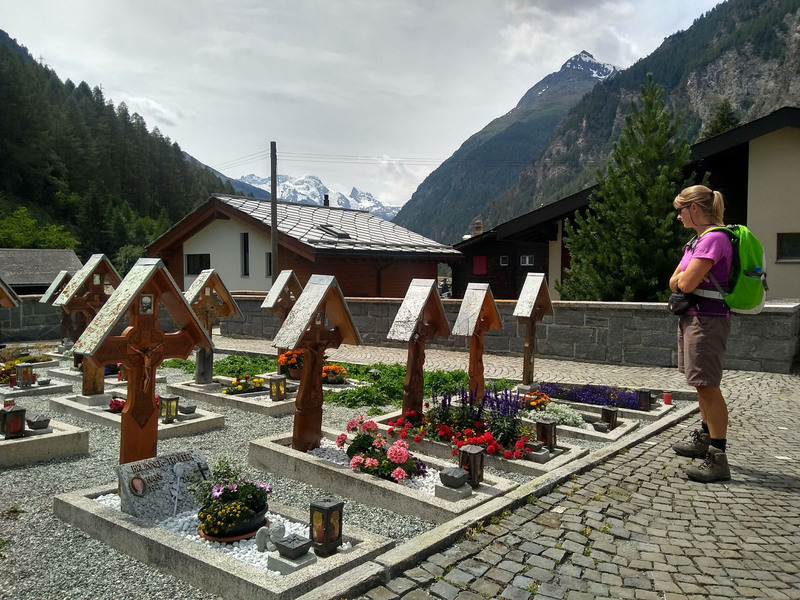 We said goodbyes to neighbouring horses and descended to the village church, circled the beautifully kept cemetery, then continued back to camp. Our wonderfully fresh morning walk was a hilly 12km, taking the best part of four hours, with almost 1000m of ascent. Our afternoon was spent doing little more than people-watching and gentle stretching on the grass, until the dark clouds rolled back in overhead and drove us inside. It was here we made the decision that it was best for us to move on, and that meant a return to France. We had business to attend to back in Limousin. In less than two weeks’ time, our new house purchase would complete, so our slow march westward now begins and our new responsibilities await. 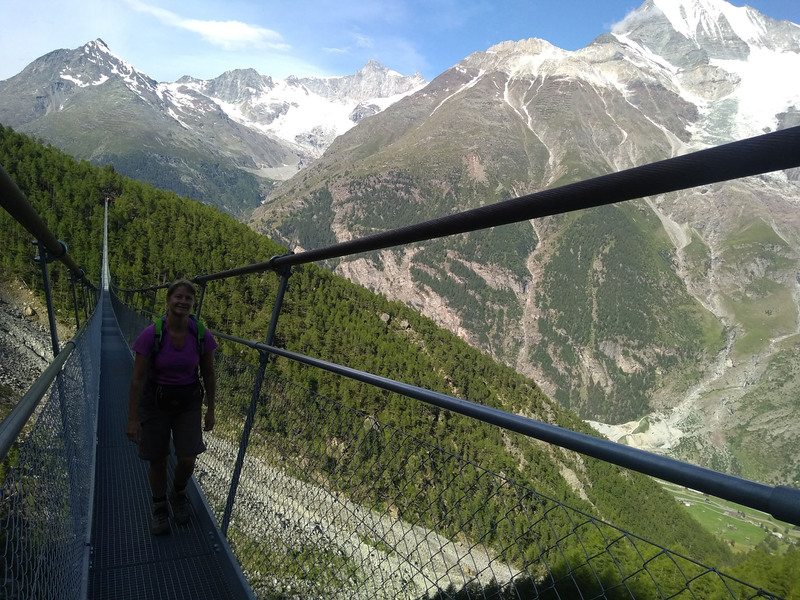 This entry was posted in 2018 Summer Tour, France, In France, In Switzerland, Our Travel Journal, Switzerland and tagged bridge crossing, church, Cycling, forest trails, France, Hiking, matterhorn, mountains, nature, sports, Switzerland on Jul 30, 2018 by Aaron Hill.